Retired 1st Sergeant Robert Martin spoke passionately about the Vietnam War and factors that affected the outcome of the war. 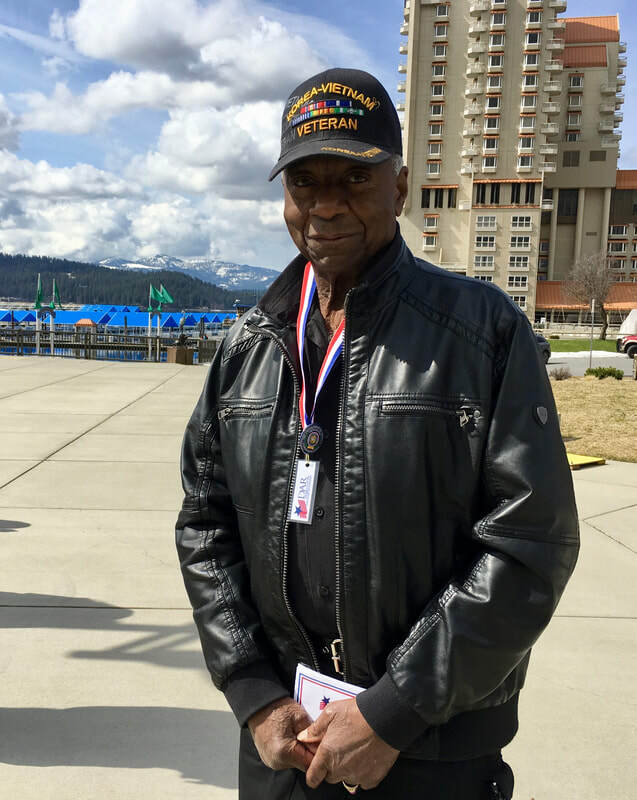 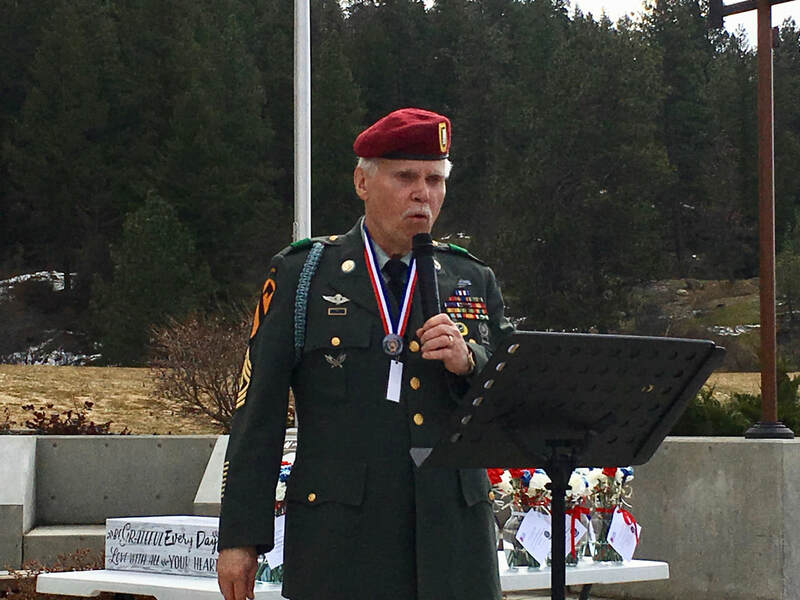 Martin was awarded 3 Purple Hearts for his service during 4 tours in Vietnam. 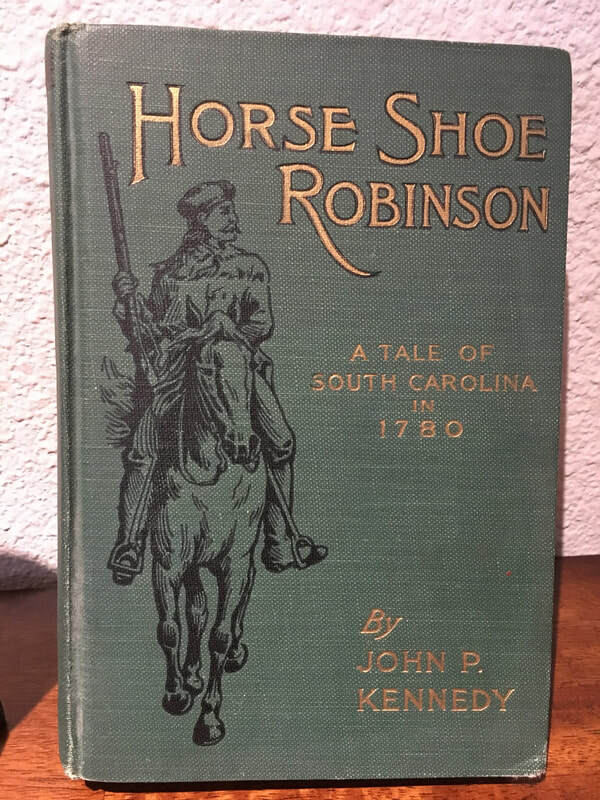 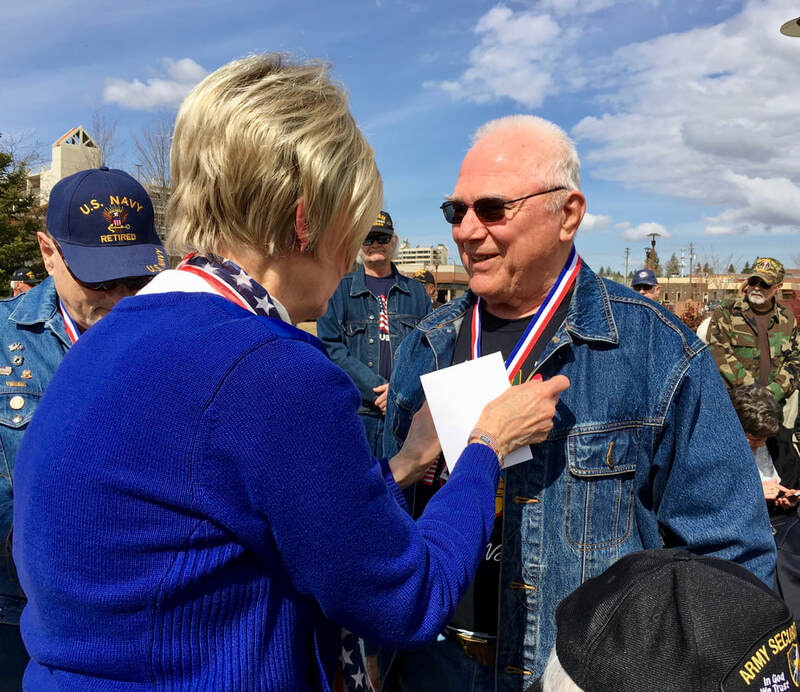 He was awarded the Presidential Unit Citation for his division's participation in 3 major battles. 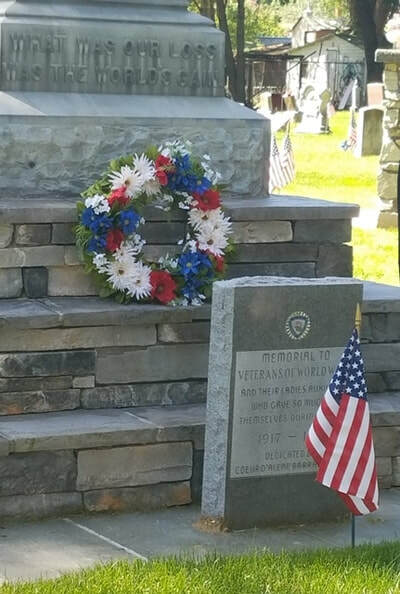 Lt. George Farragut loves our veterans! 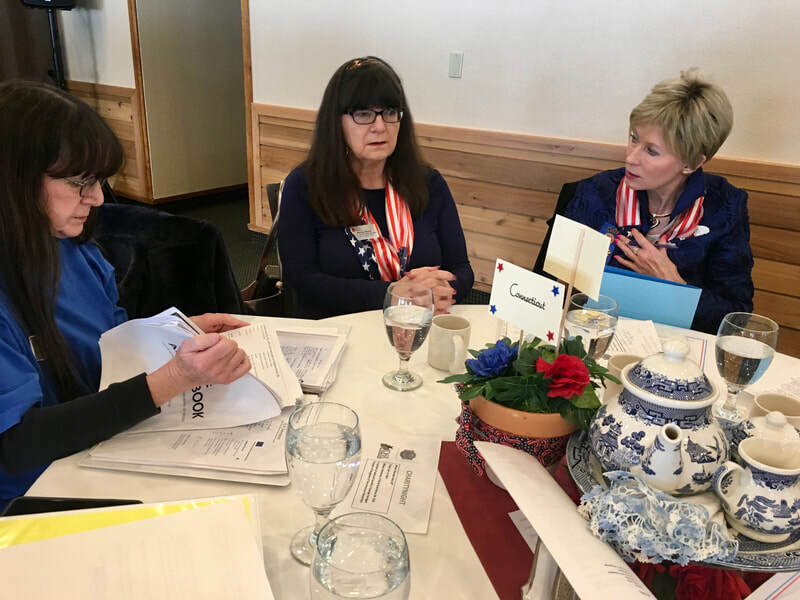 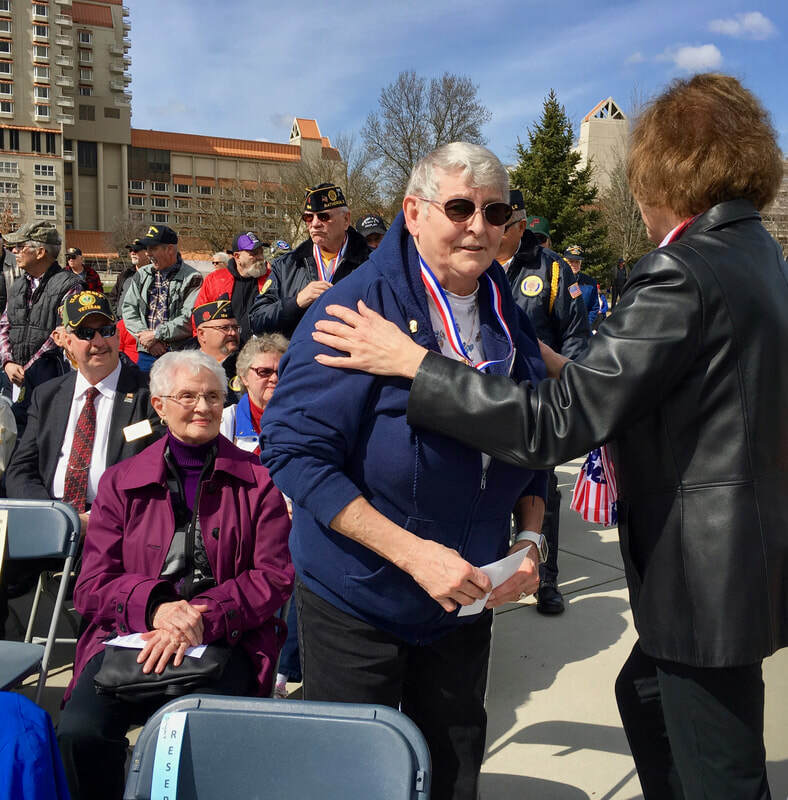 Our Daughters got behind DAR Service for Veterans Chair Barb Nelson to plan and prepare for this event. 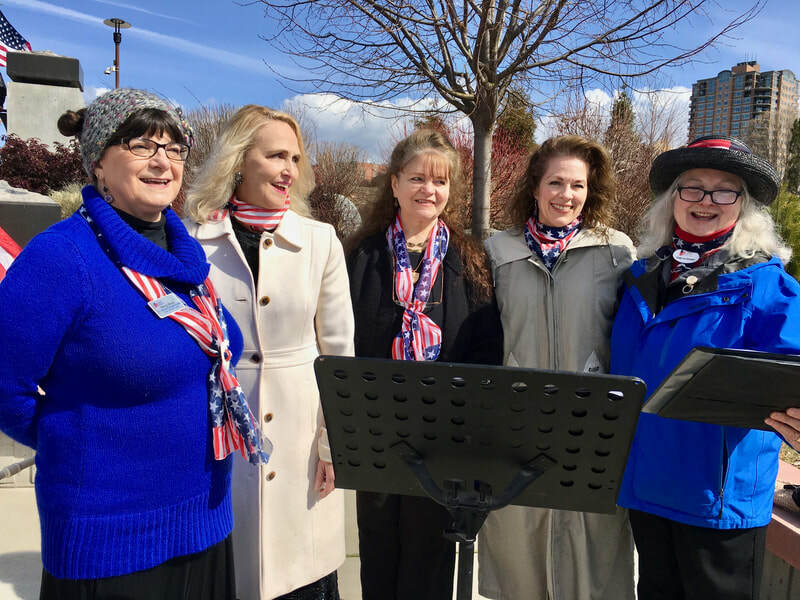 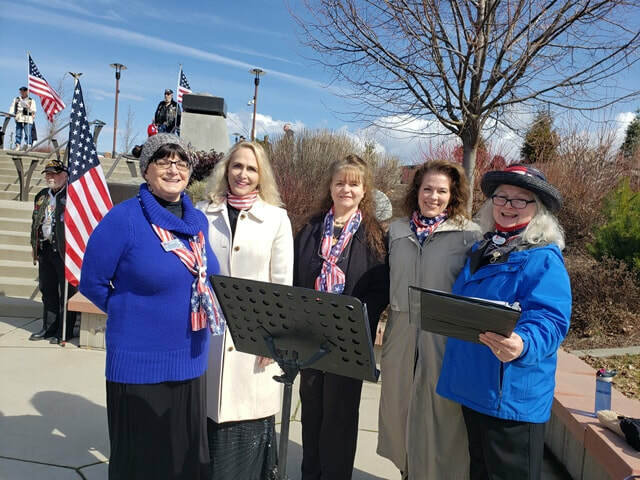 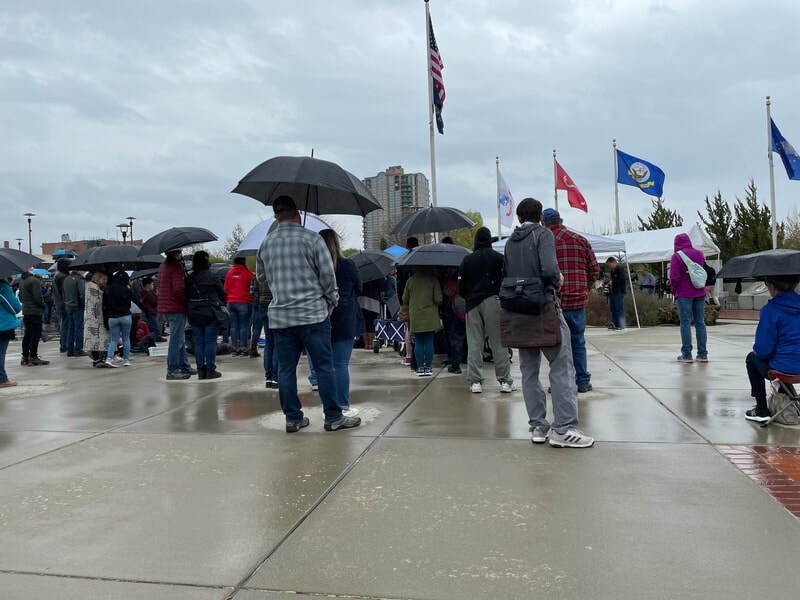 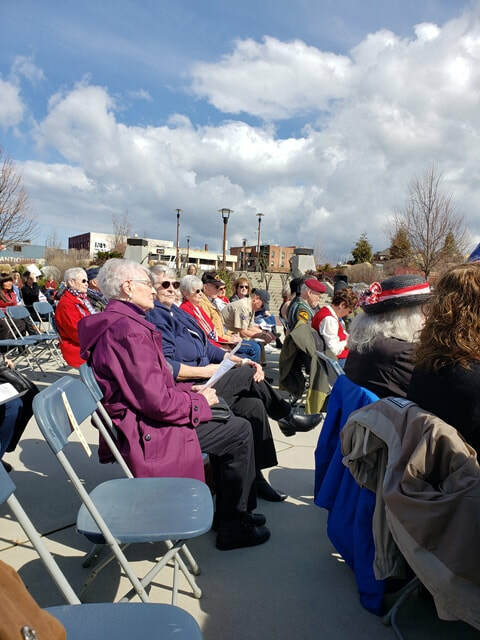 Many came out to participate in the commemoration including 5 Daughters who sang The Star-Spangled Banner and other patriotic songs. 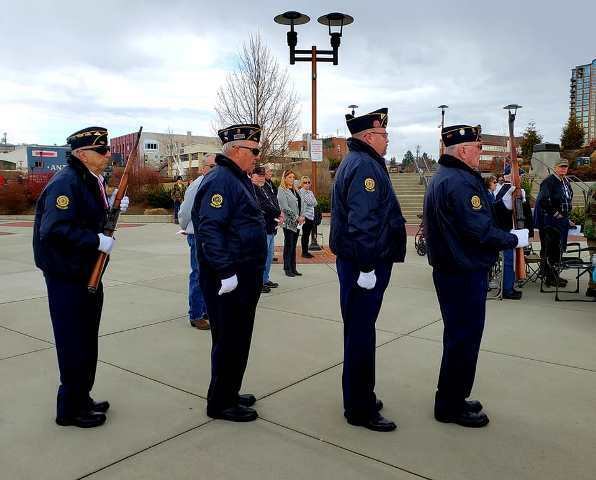 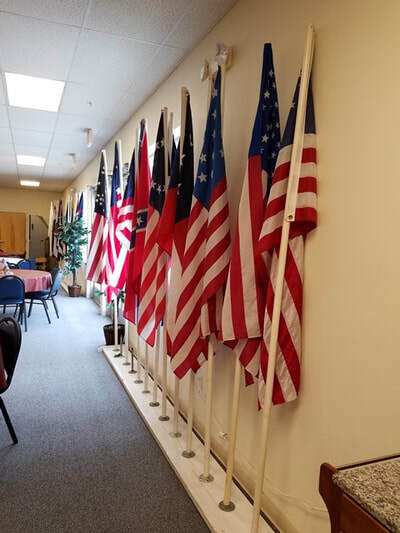 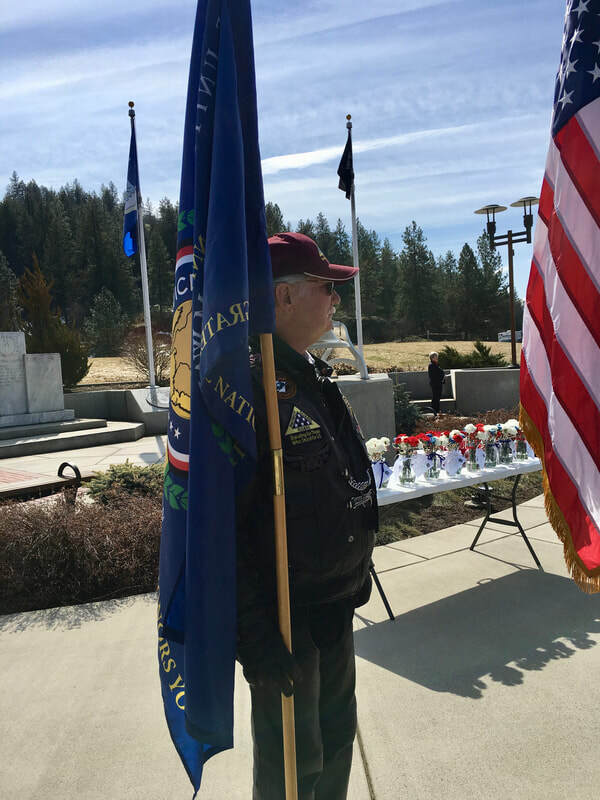 We appreciated American Legion 154 (Rathdrum) posting and retiring the colors, and their presence along with the Patriot Riders. 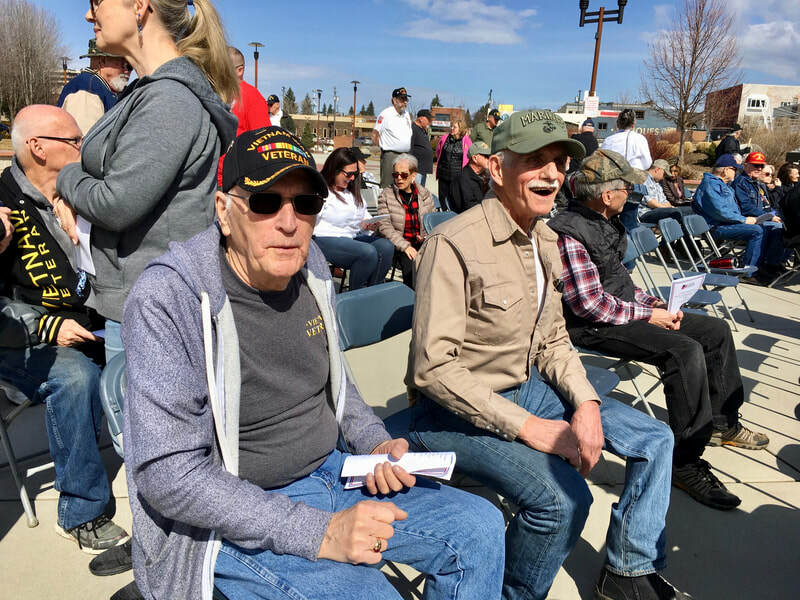 The real heroes at the event were the many veterans in attendance. 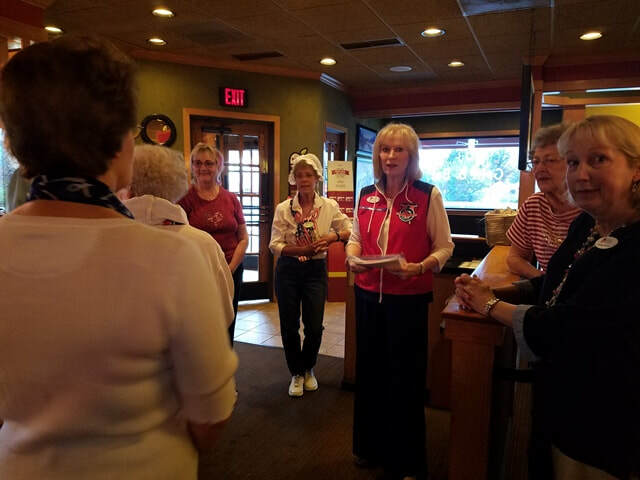 Each was given a medallion commemorating the event and a card of appreciation from the chapter. 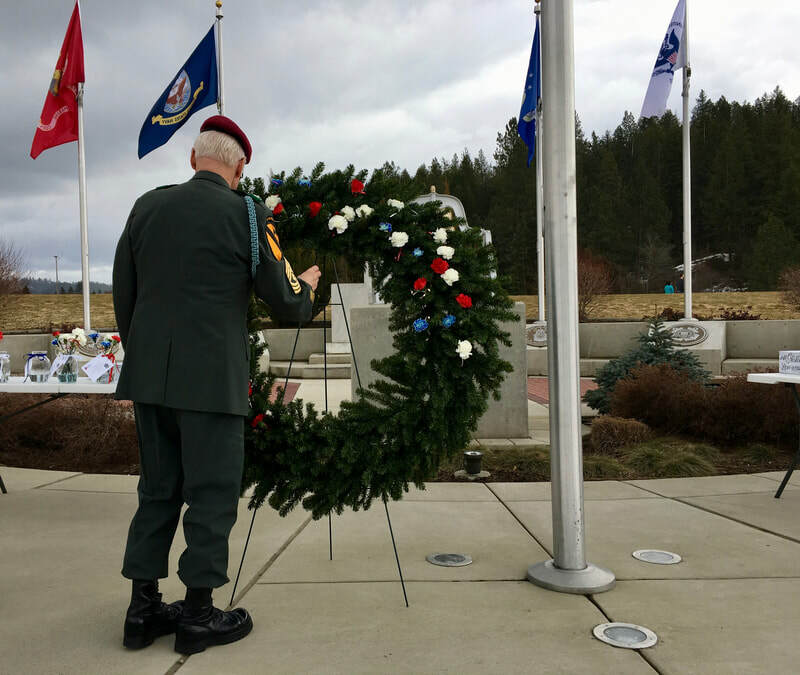 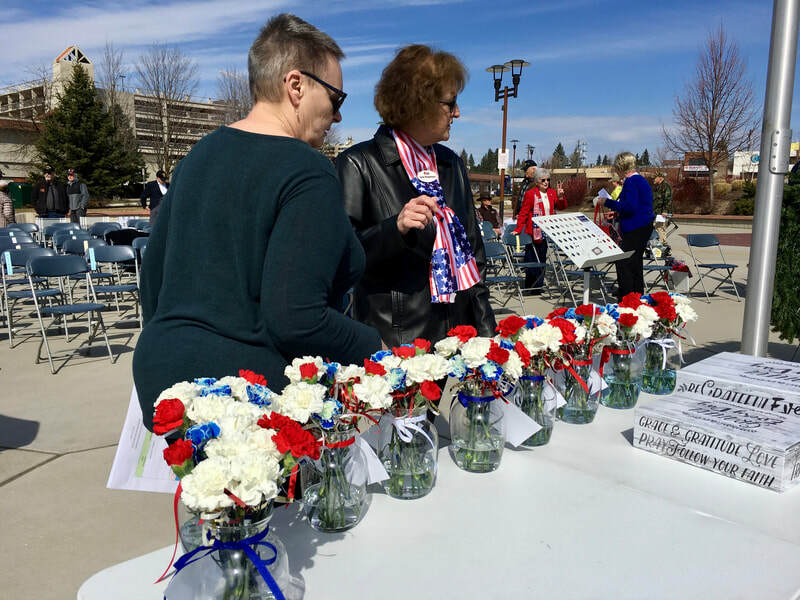 Two of the recipients were chapter members Donna J. and Trish T.
The public was invited to add a carnation to our wreath in honor of a love one who served in the war, but who has passed, whether while serving in the war or after. 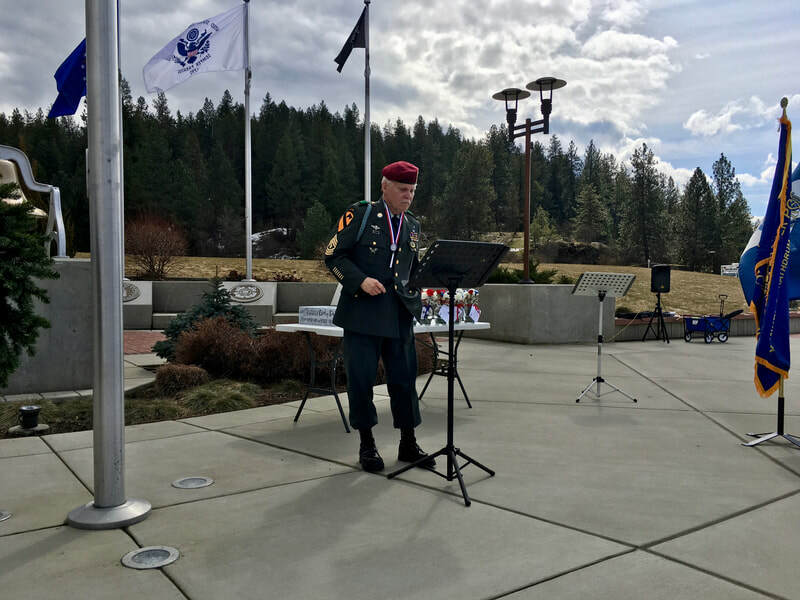 The program concluded with Phil Kowzan, LTC, USAR, Retired, Vietnam playing Taps. 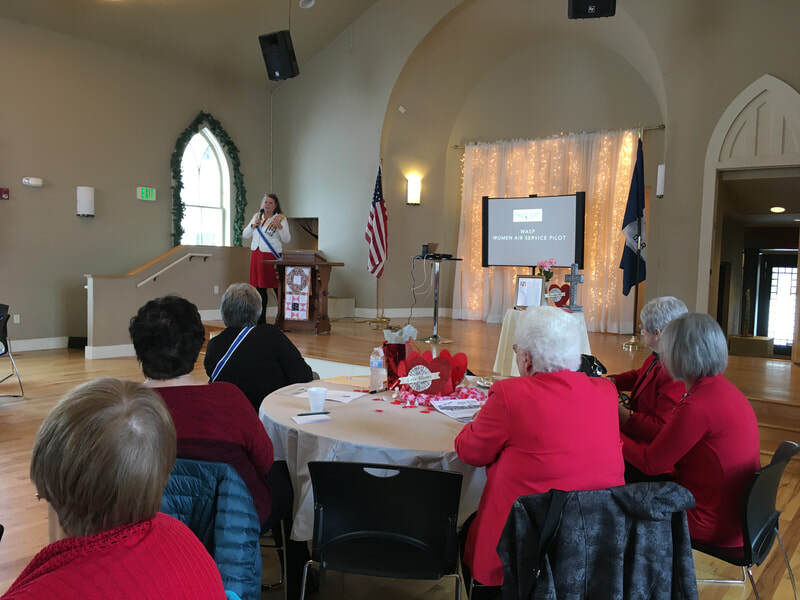 We Appreciate All Who Came! 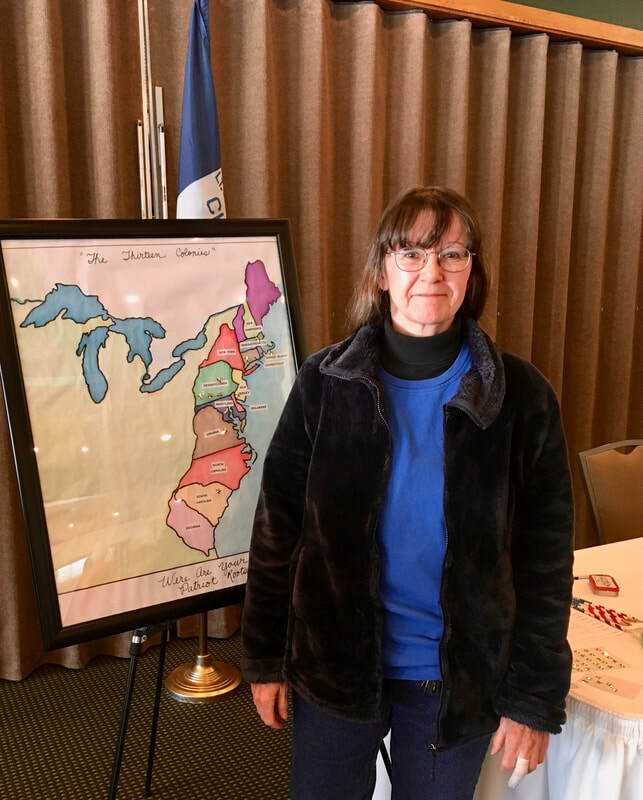 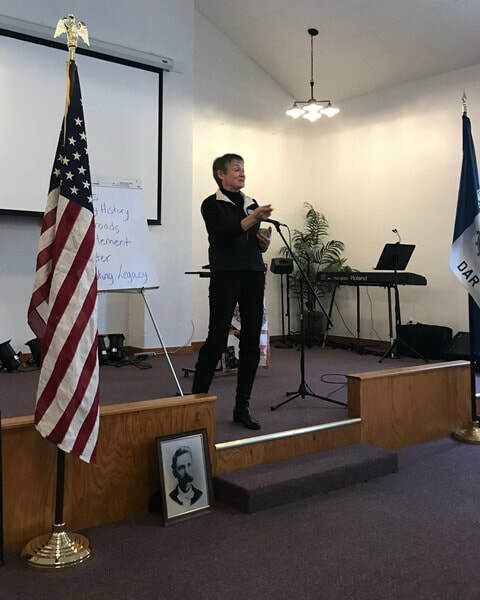 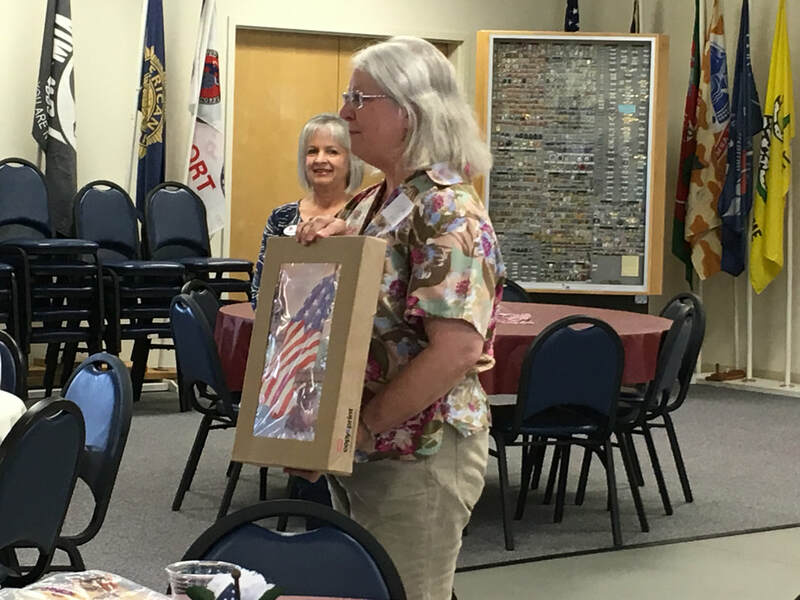 After a brief presentation by Sandra Doutre with research tips, it was all about our patriot ancestors. 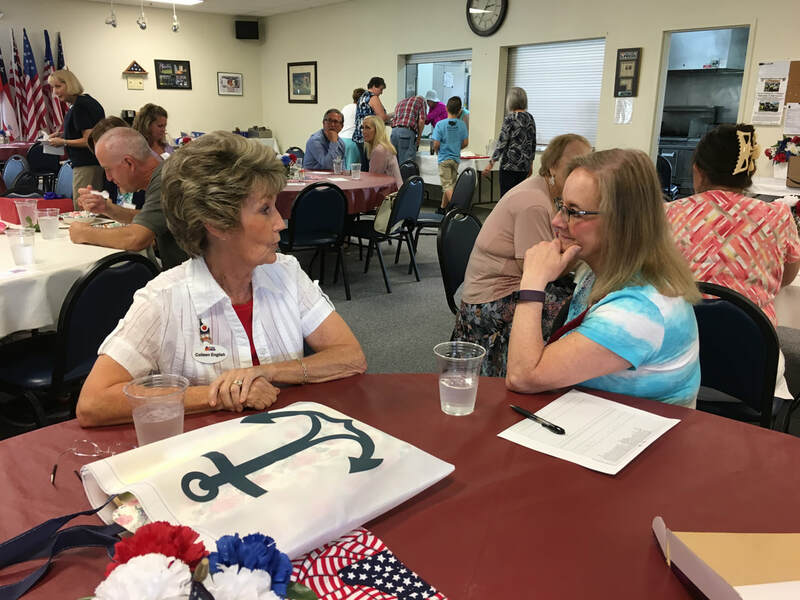 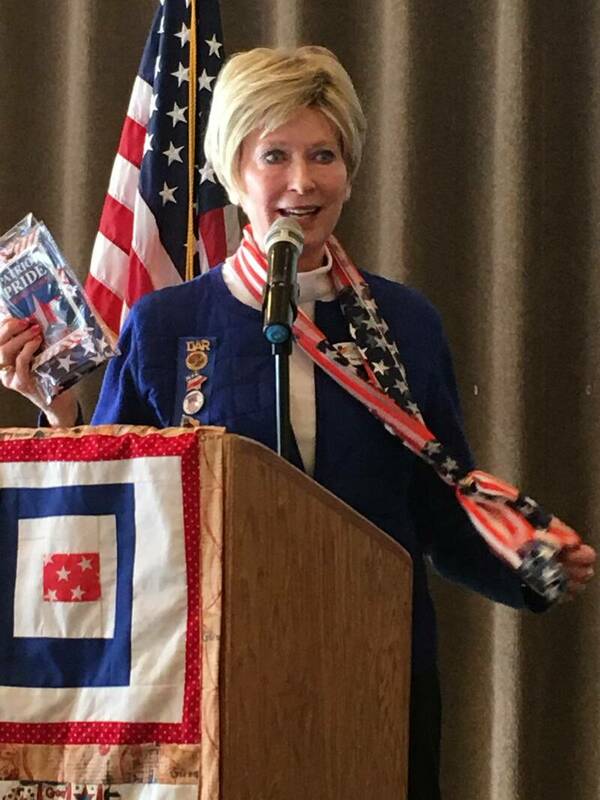 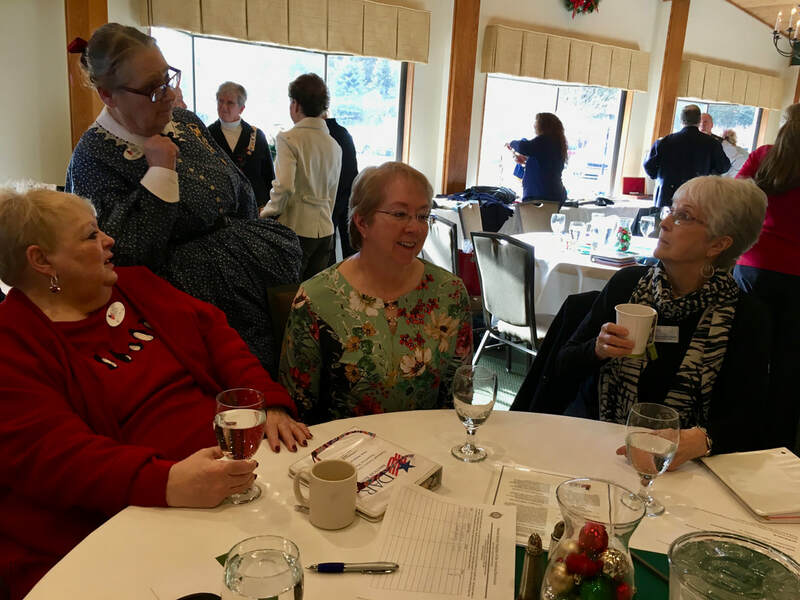 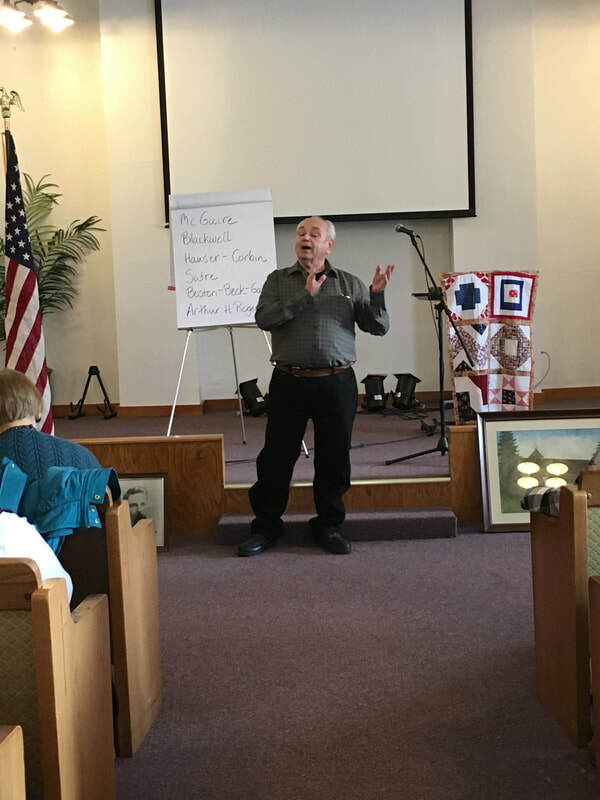 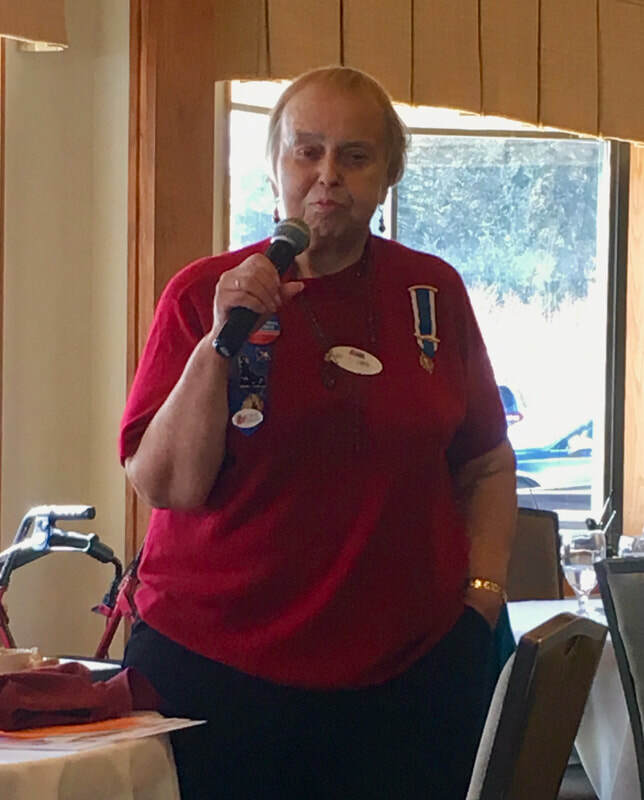 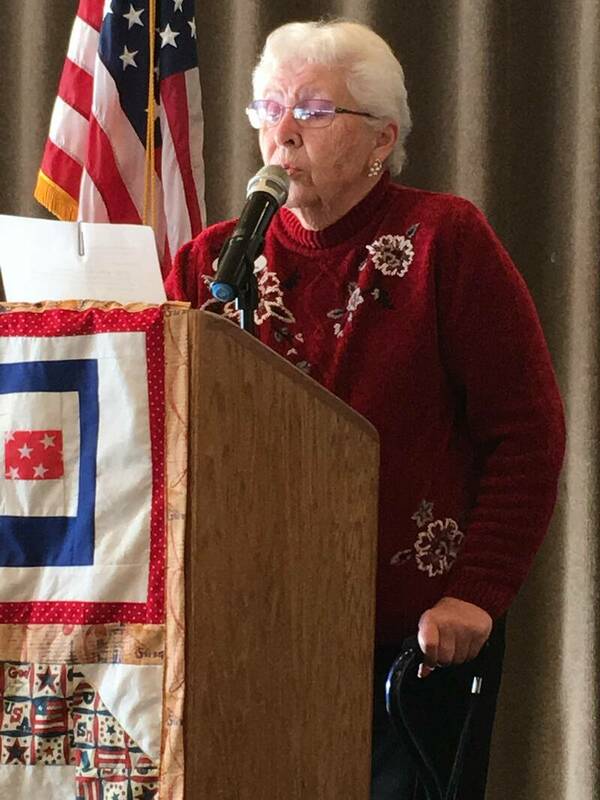 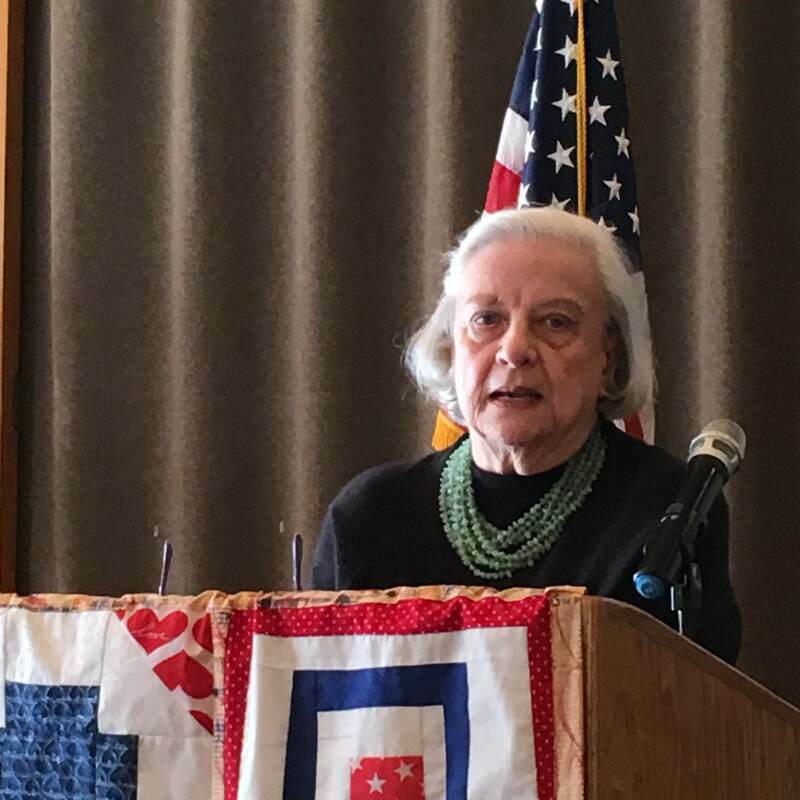 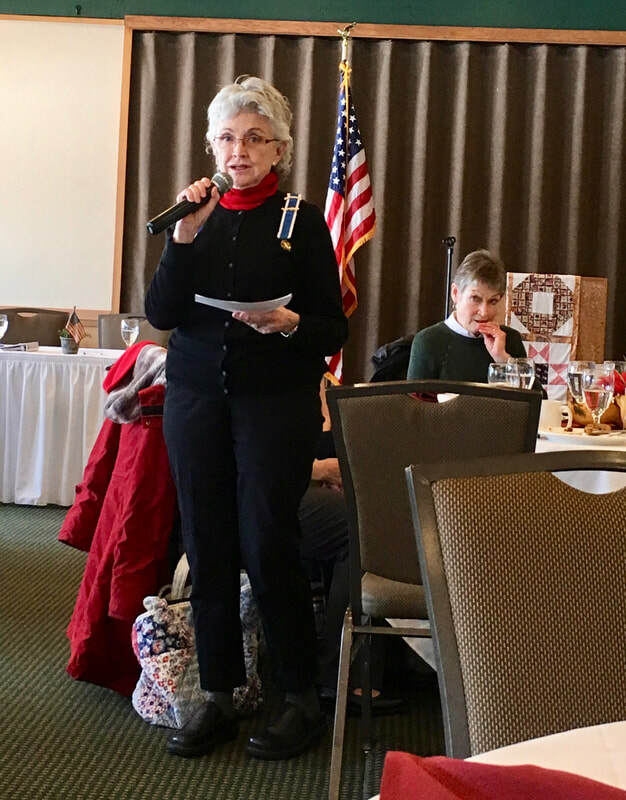 With pride, members took the microphone to share stories and books about their DAR patriots. 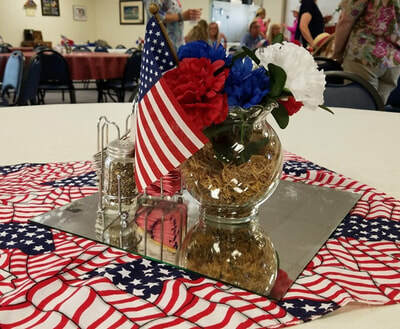 The stage was set with beautiful patriotic-themed table settings. 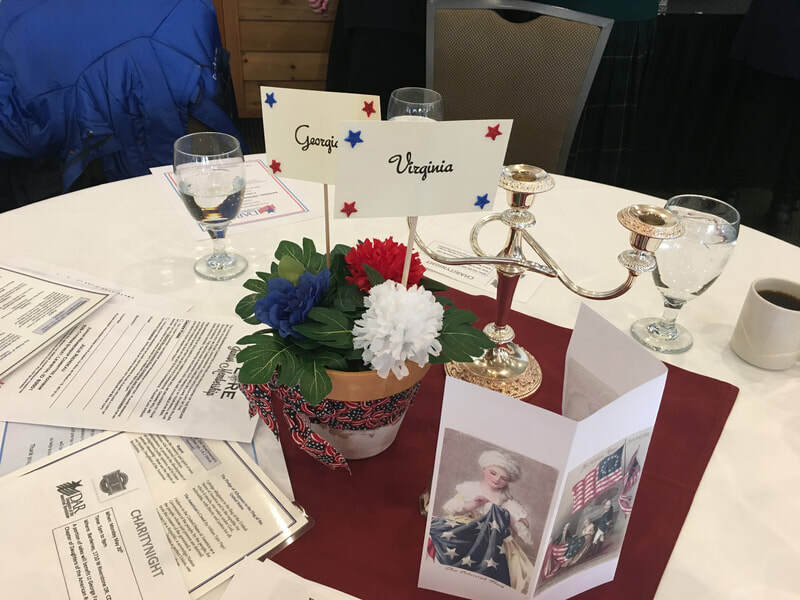 Seating was by the state from which our patriots served. 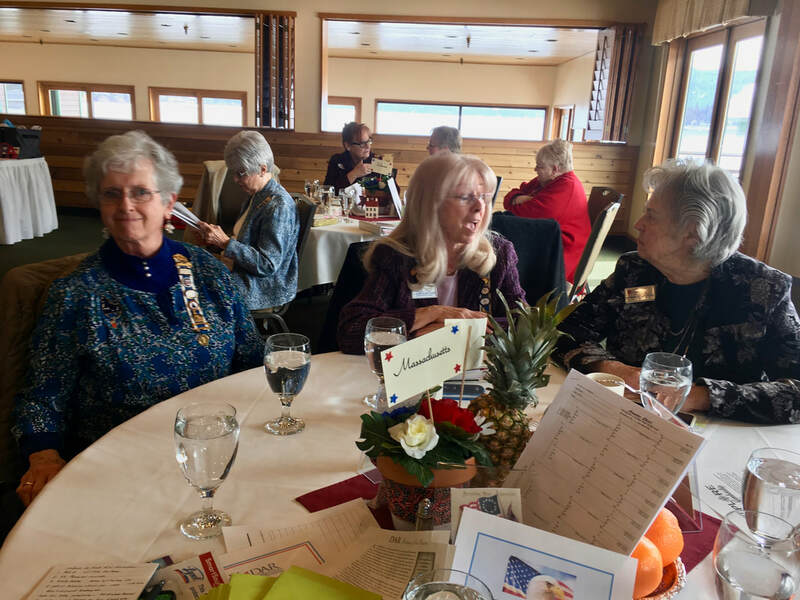 Lt. George Farragut members and guests gathered at the Jacklin Arts and Cultural Center for our February meeting. 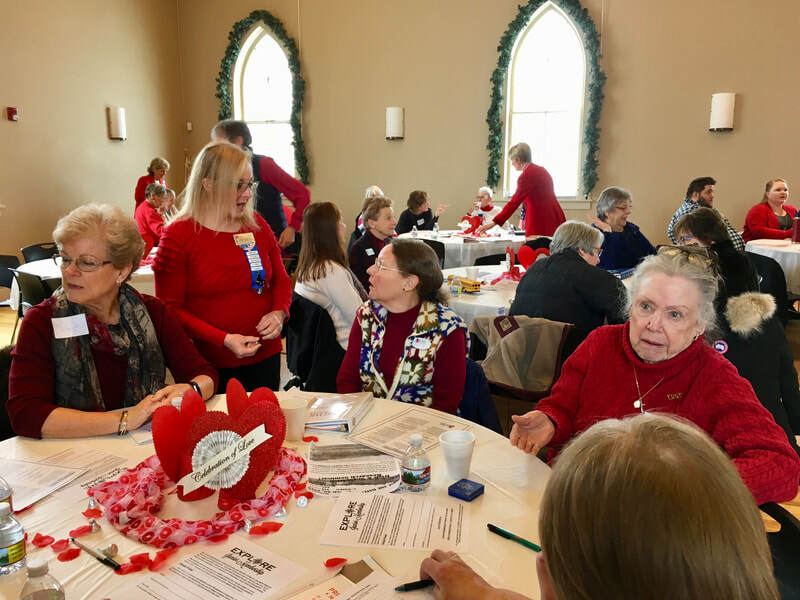 Red was the predominant color as a show of support for Heart Health Awareness Month. We welcomed State Regent Susan Davis who gave an update on her state project. 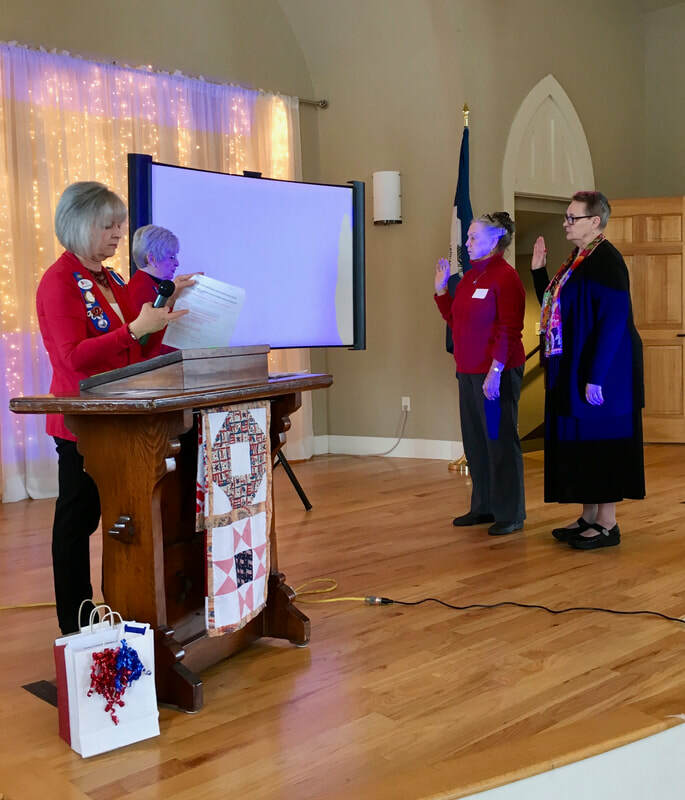 We were privileged to witness two new members, Susan S. and Kathy V., take the DAR Oath of Membership. 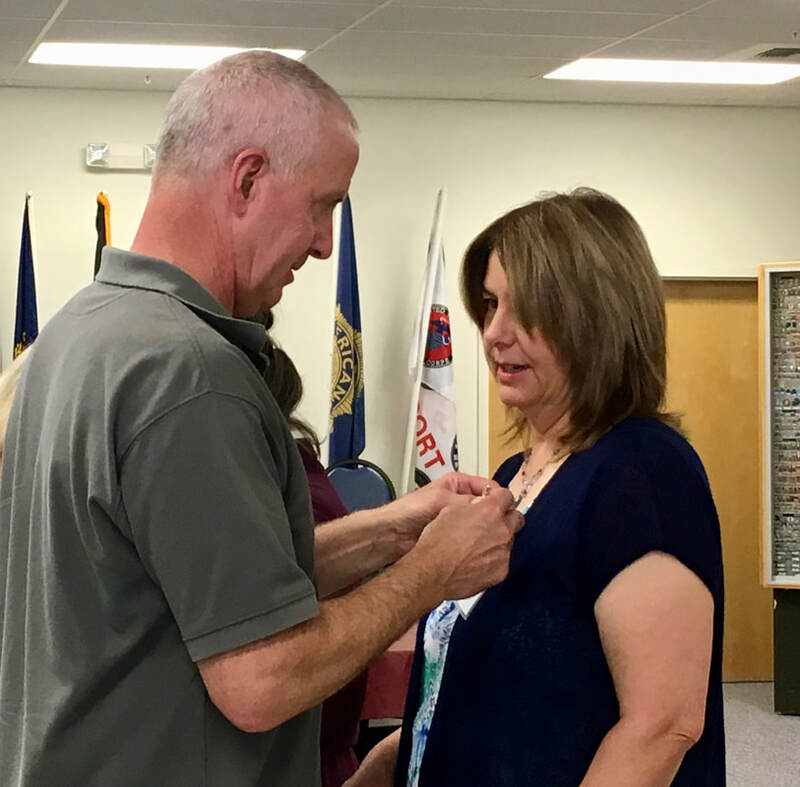 Susan was pinned by her husband, and Kathy by our regent. 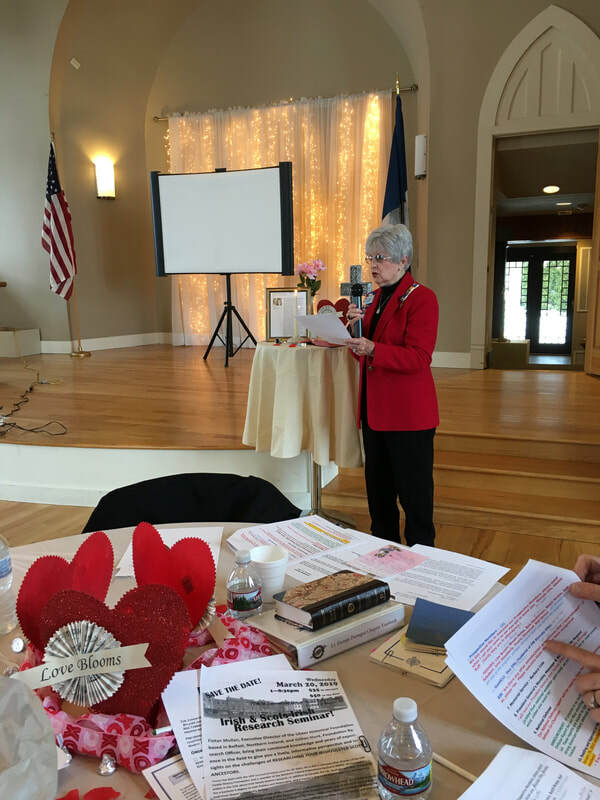 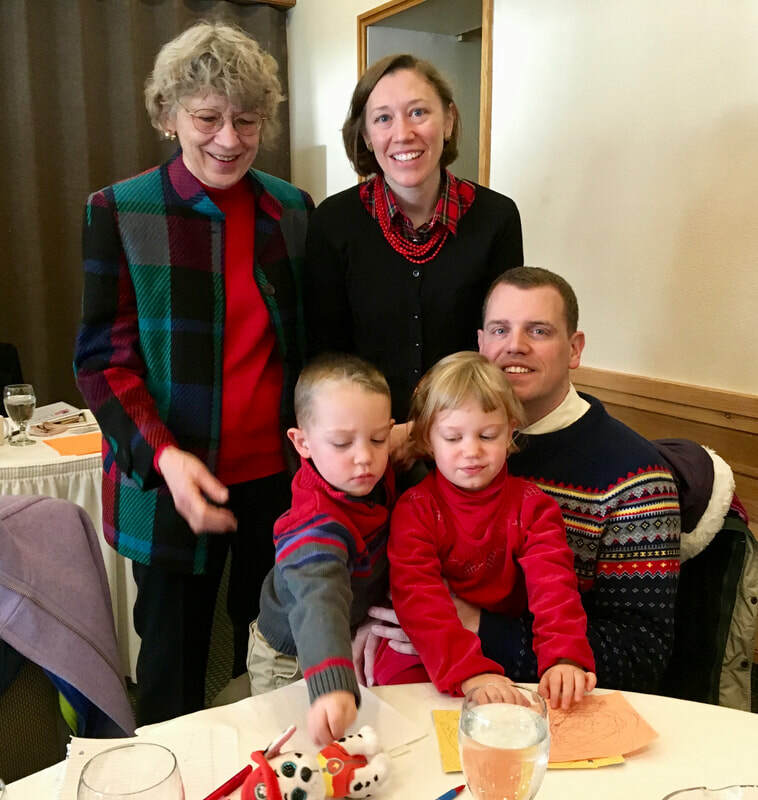 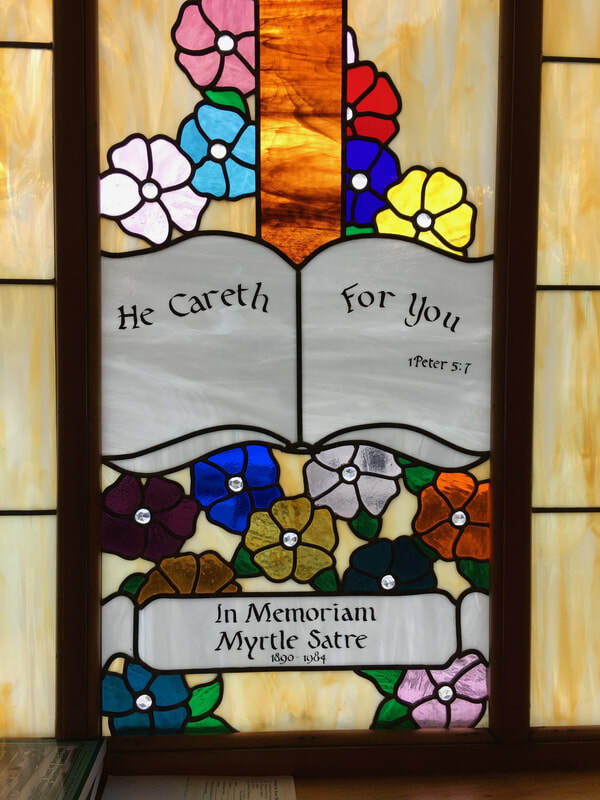 Chaplain Helen Burge led a memorial service for Barbara Cole. 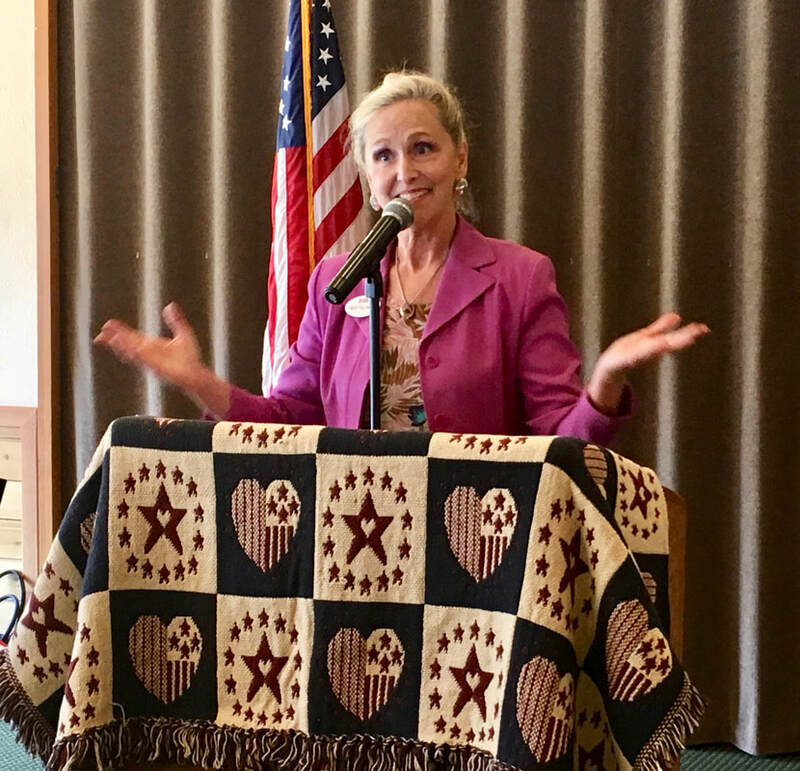 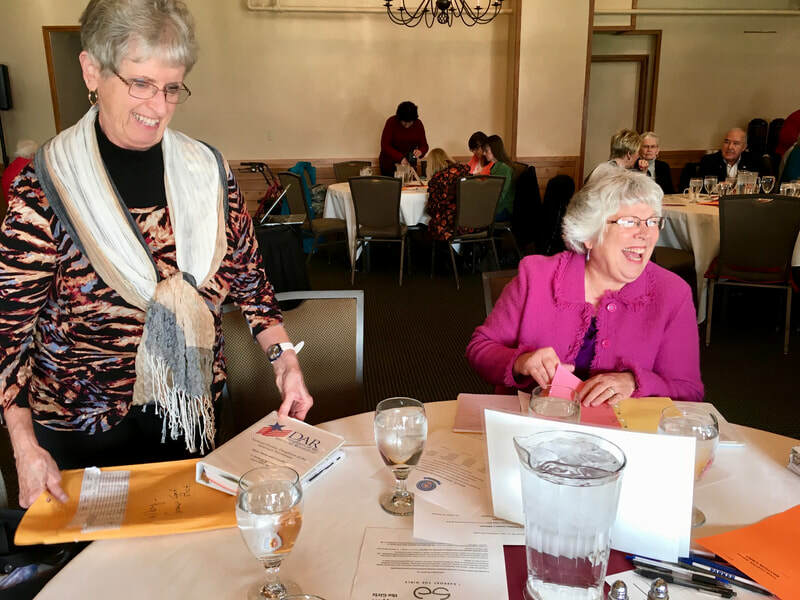 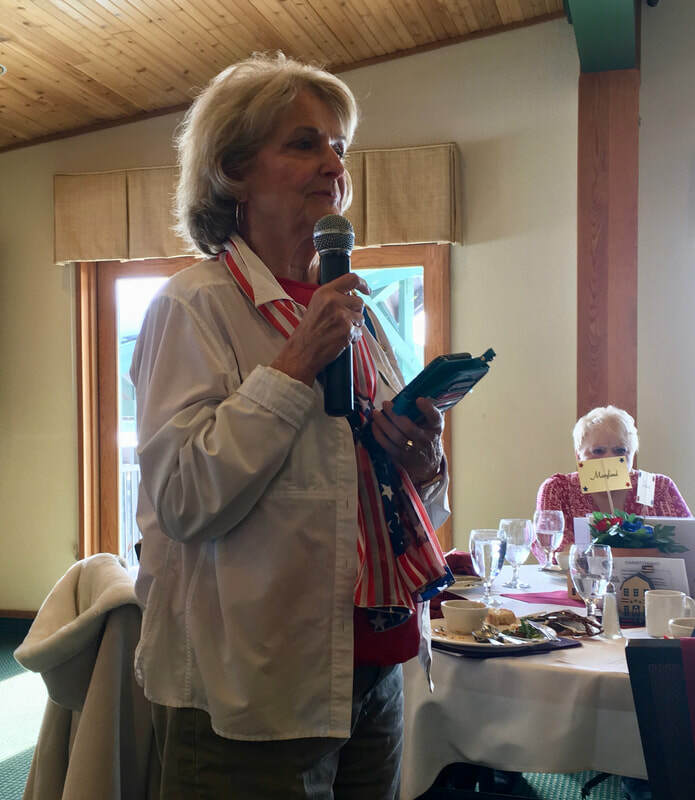 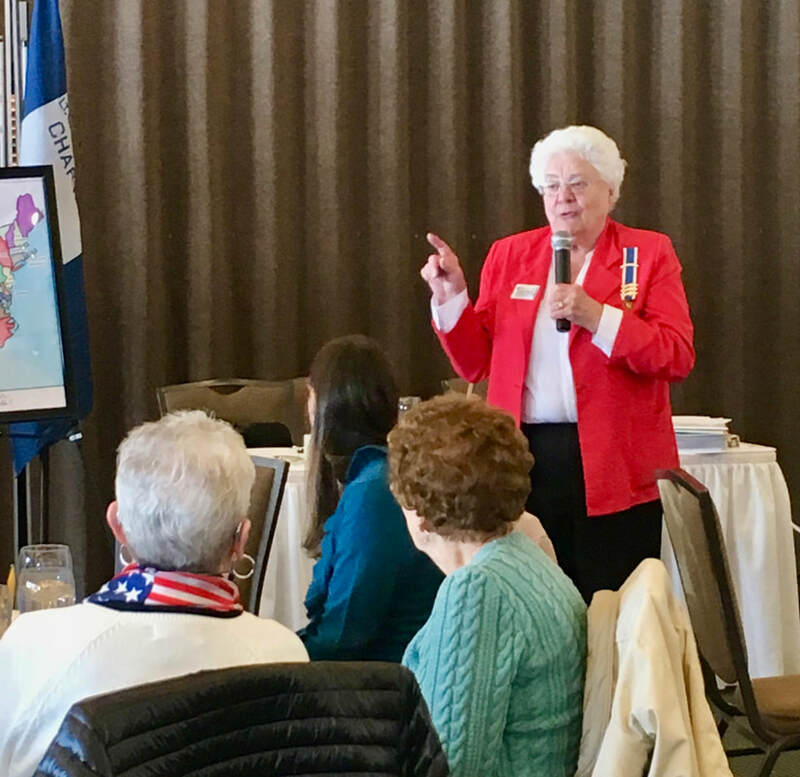 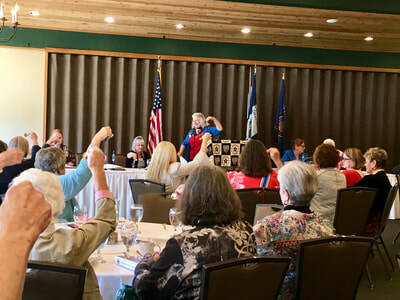 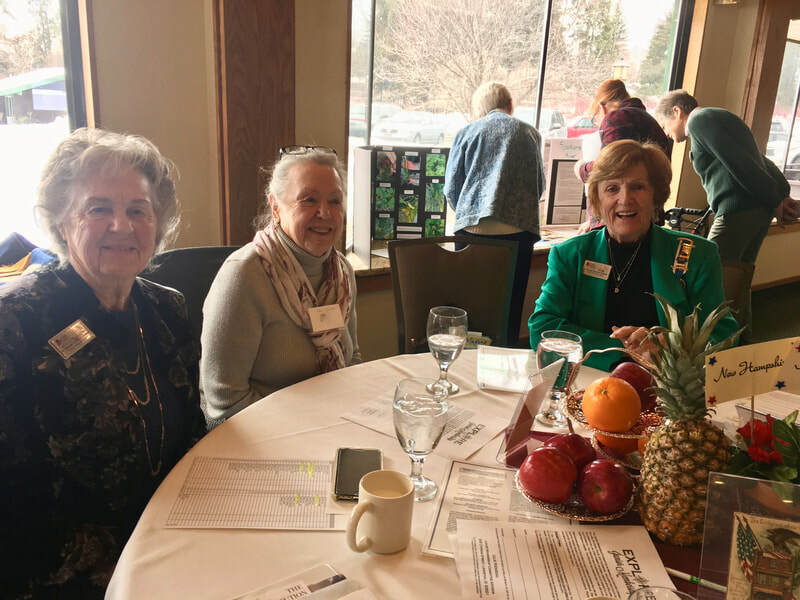 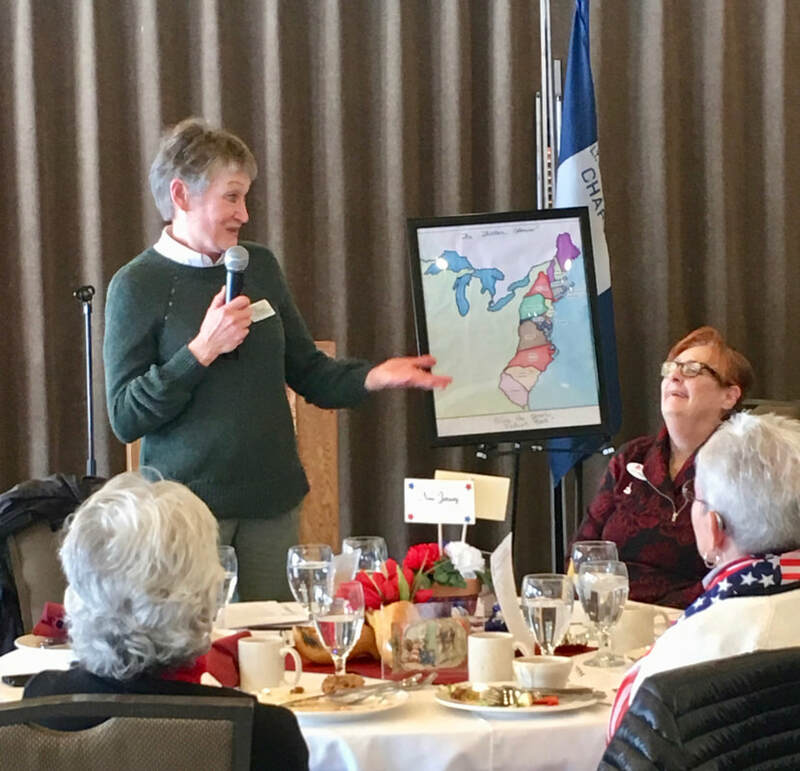 ​Honorary State Regent and chapter member Liz Jones, a private pilot, presented a program on the courageous women who stepped up to serve as pilots during World War II. These women volunteered to take on ferrying jobs and much more. 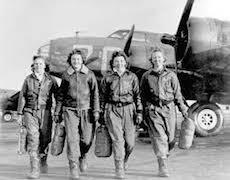 The WASP have inspired generations with their stories that forever changed the course of women in aviation. 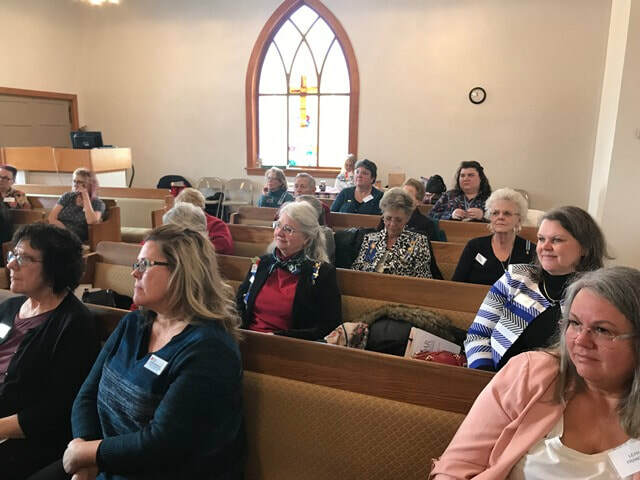 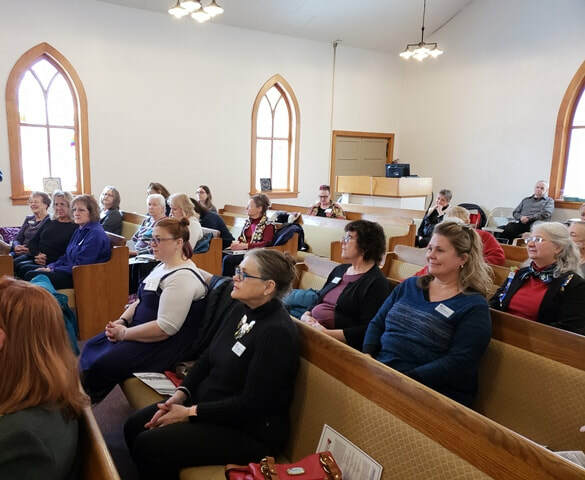 Our January meeting was held at the historic Rock Chapel in Post Falls. 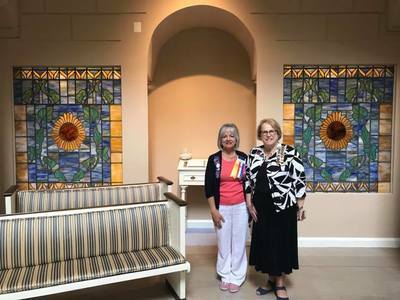 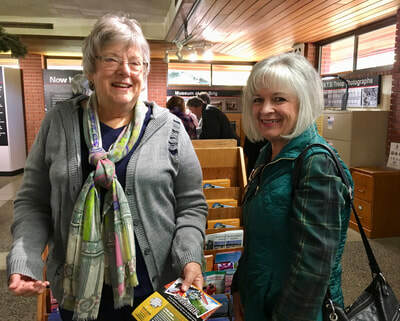 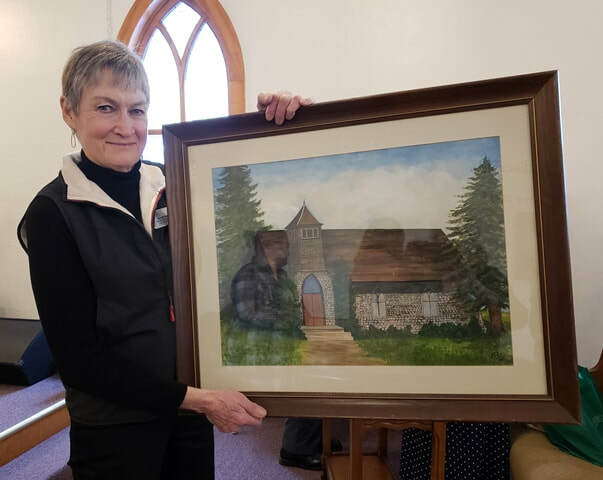 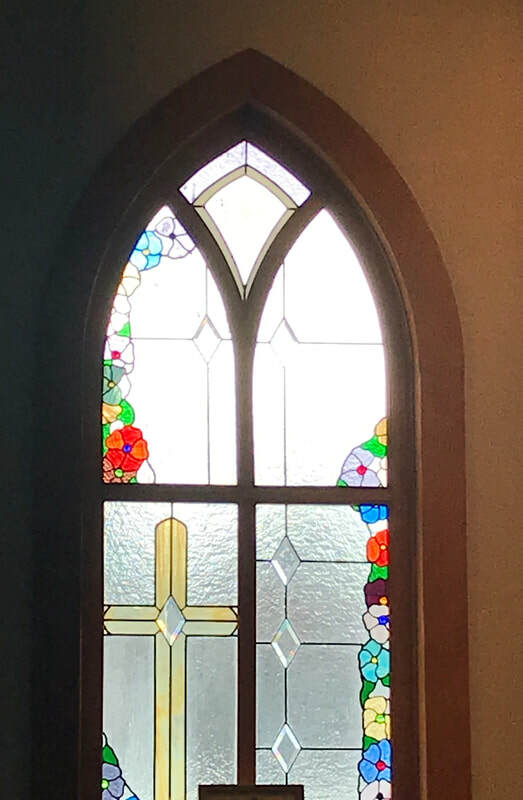 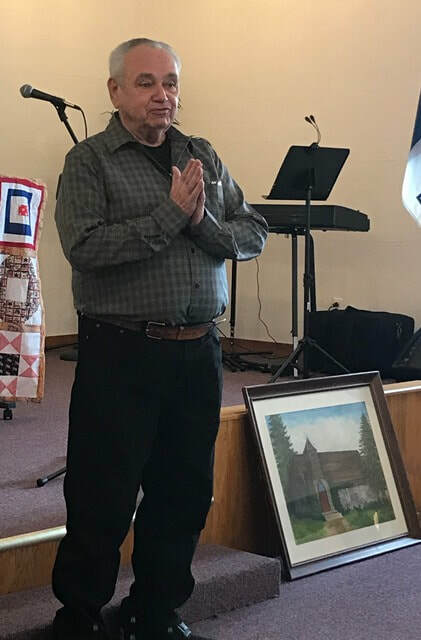 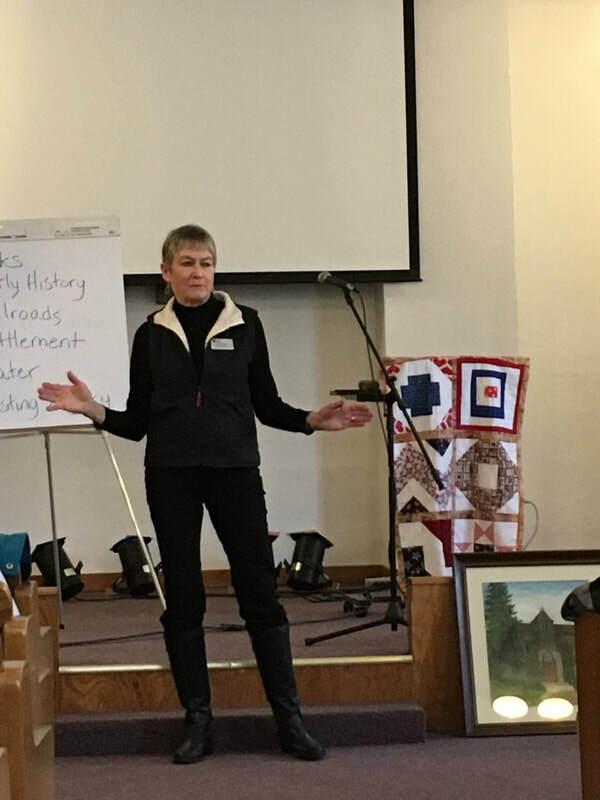 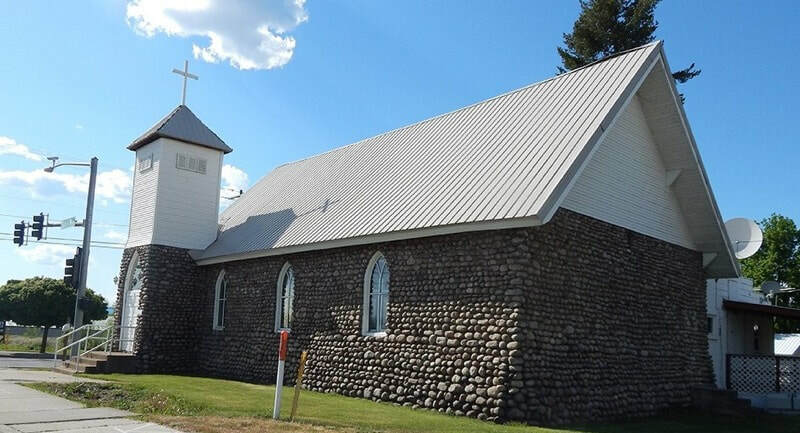 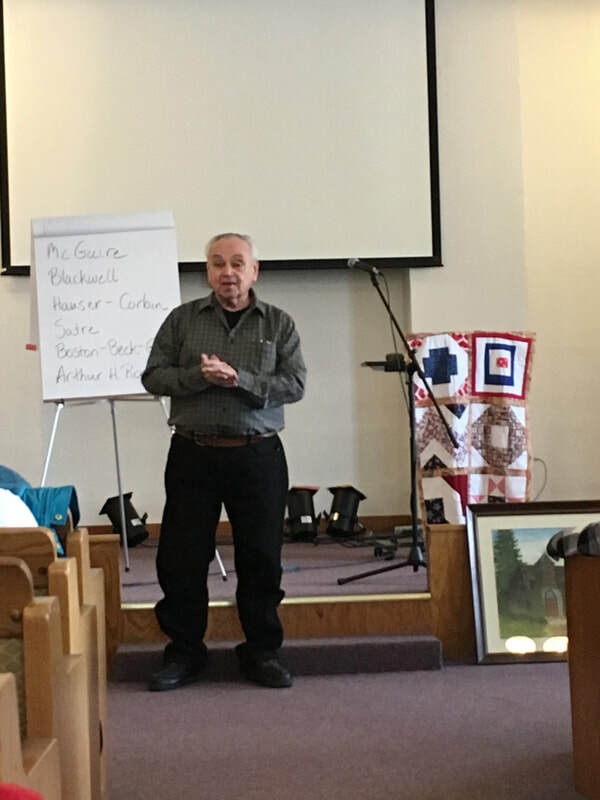 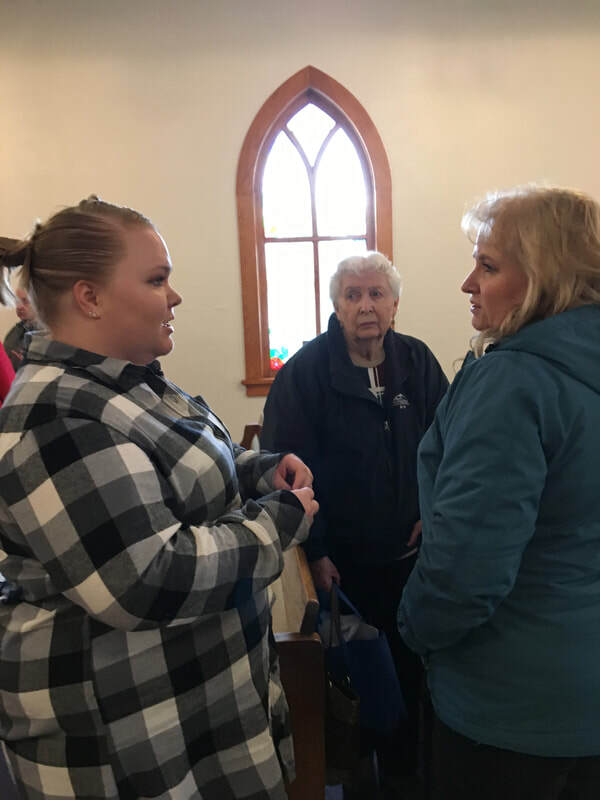 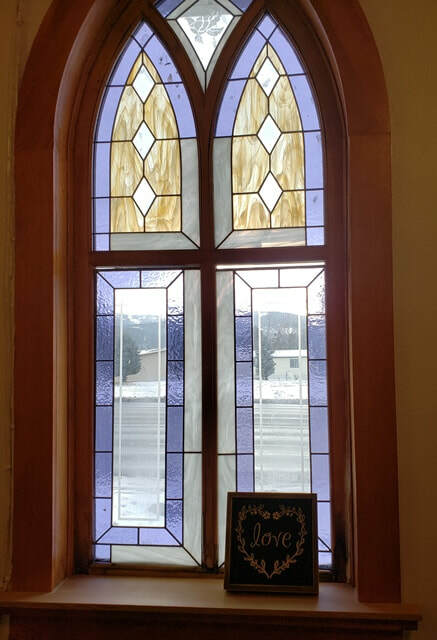 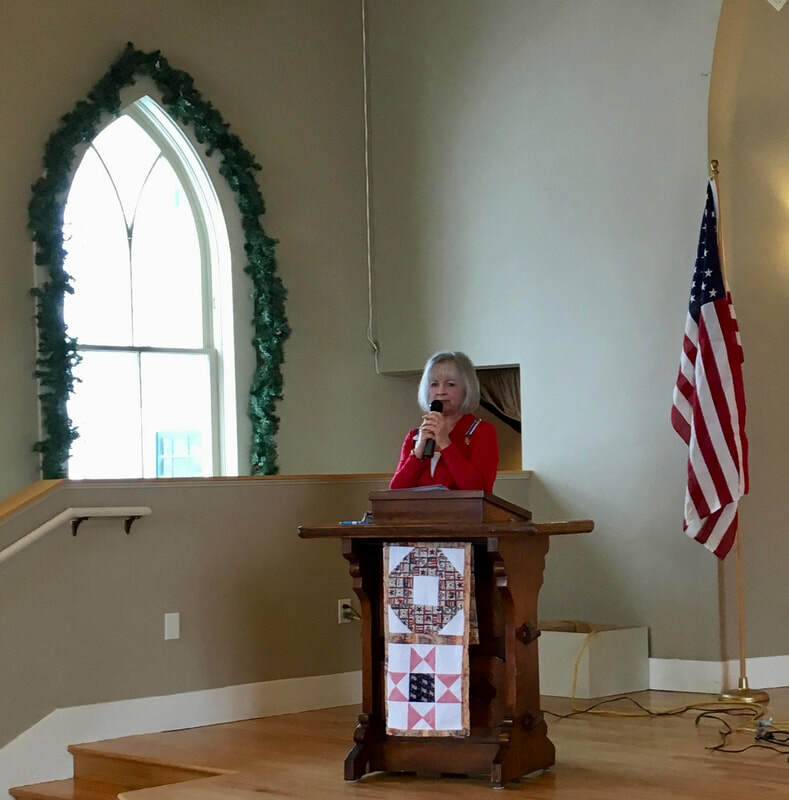 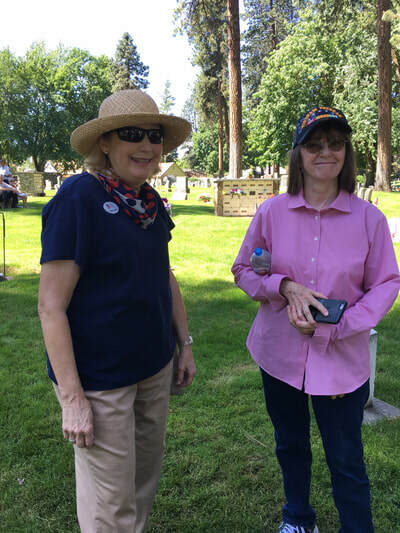 Chapter member Kim Brown along with Ted Fredekind, both members of the Post Falls Historical Society, shared with us the rich history of the chapel and local area. 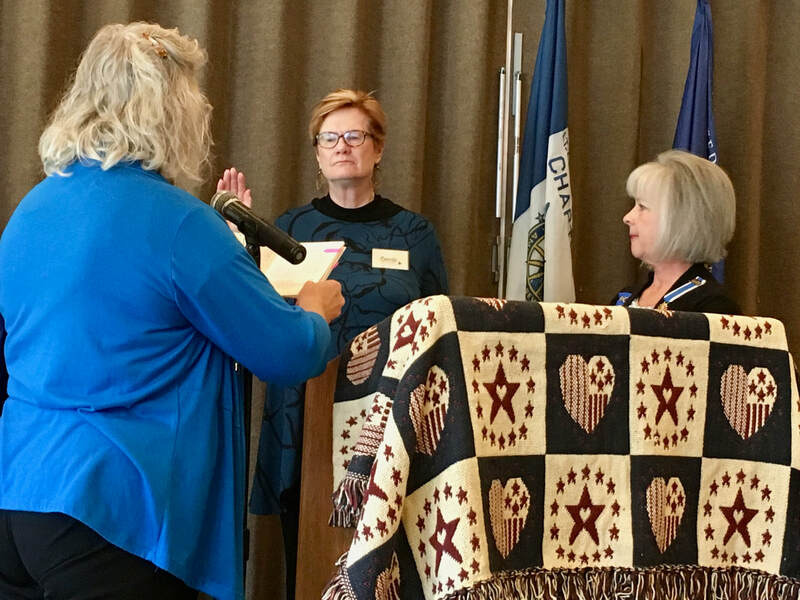 New members Kriss and Faith took the oath of membership under the direction of Regent Catherine McClintick and Chaplain Helen Burge. 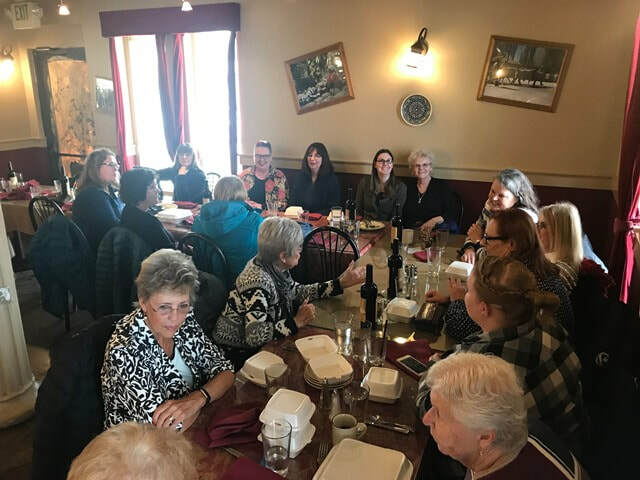 After the meeting and programs, Daughters gathered at The White House Grill for lunch and fellowship. 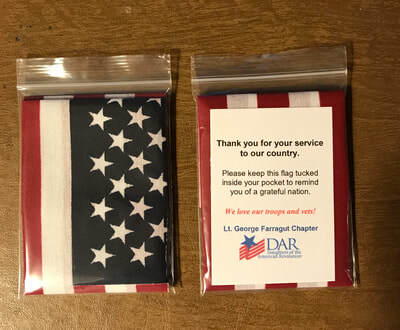 Lt. George Farragut proudly sponsors the DAR Good Citizens program that recognizes outstanding high school seniors who exhibit good citizenship in their homes, schools and communities. 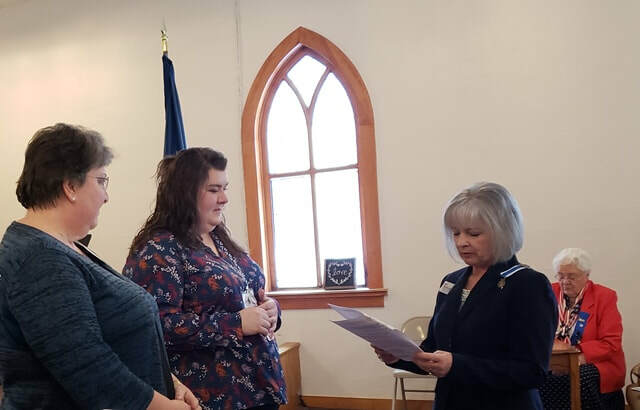 A school's DAR Good Citizen is selected by the senior class. Five local high schools participated this year. 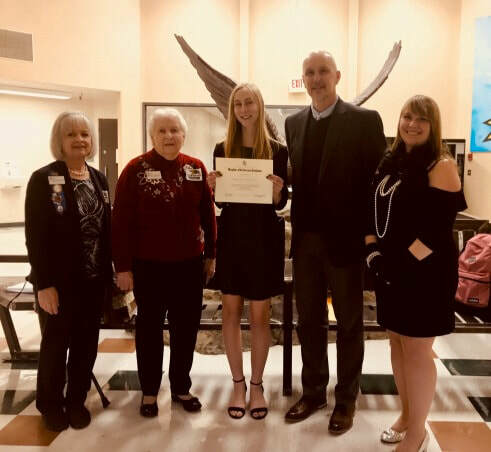 All five DAR Good Citizens chose to participate in the optional essay contest, and from those, Ruth Schenkenberger from Lakeland High School in Rathdrum was chosen as our chapter winner. She was recognized at a school program. 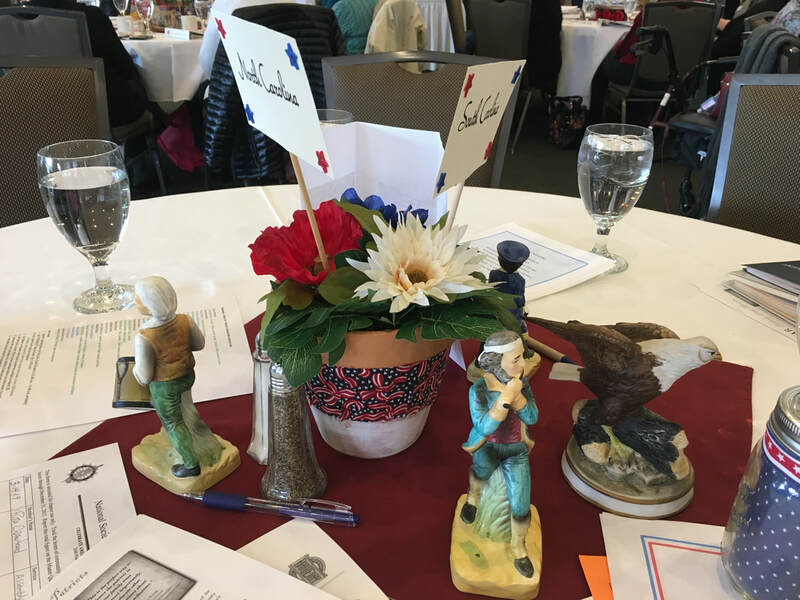 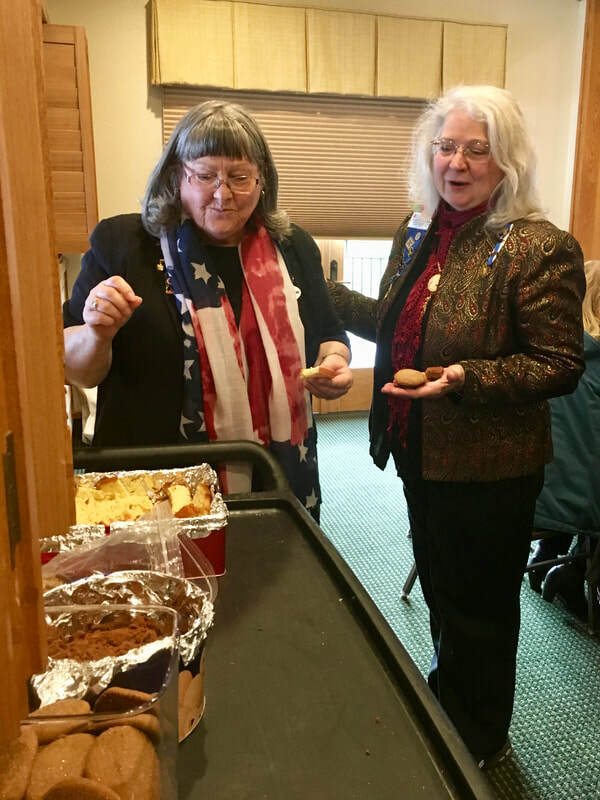 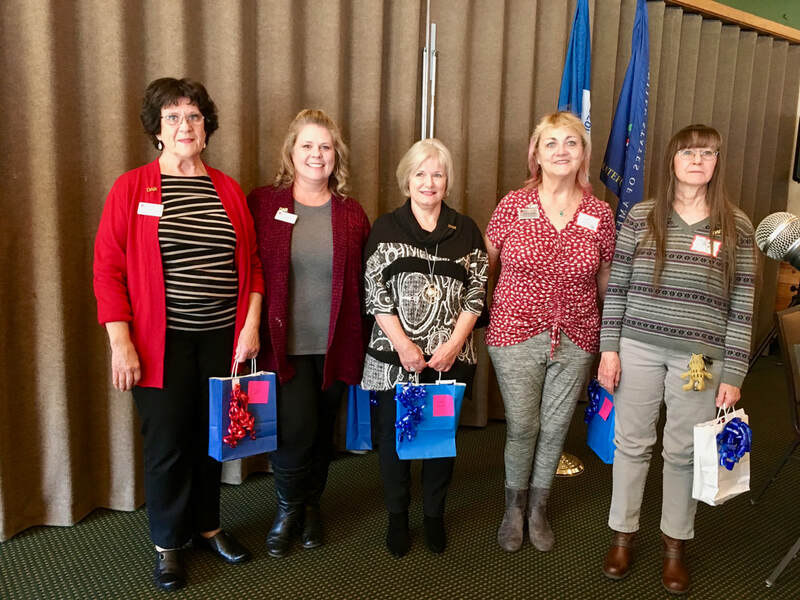 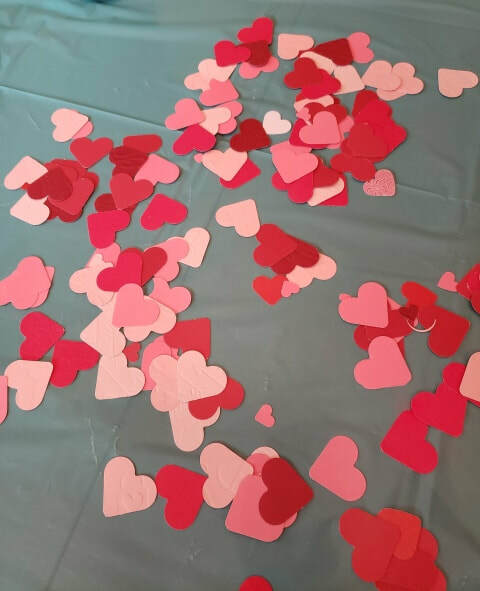 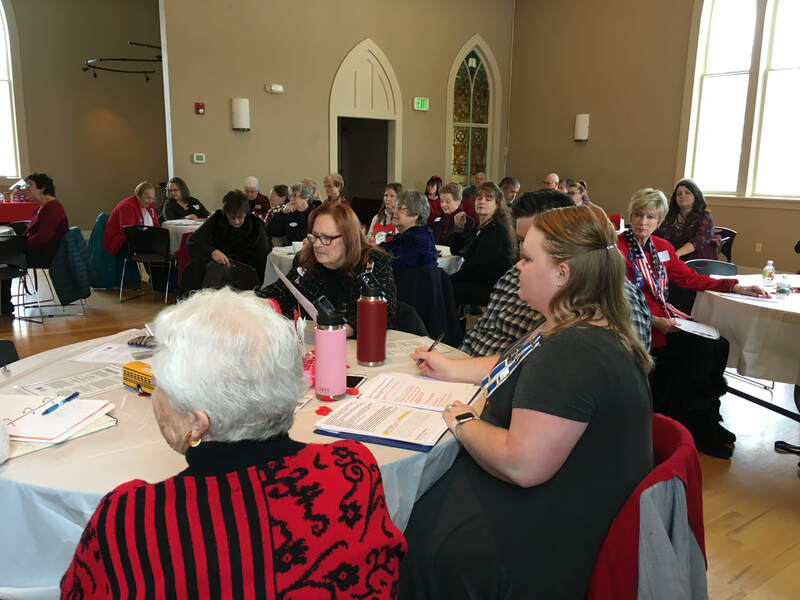 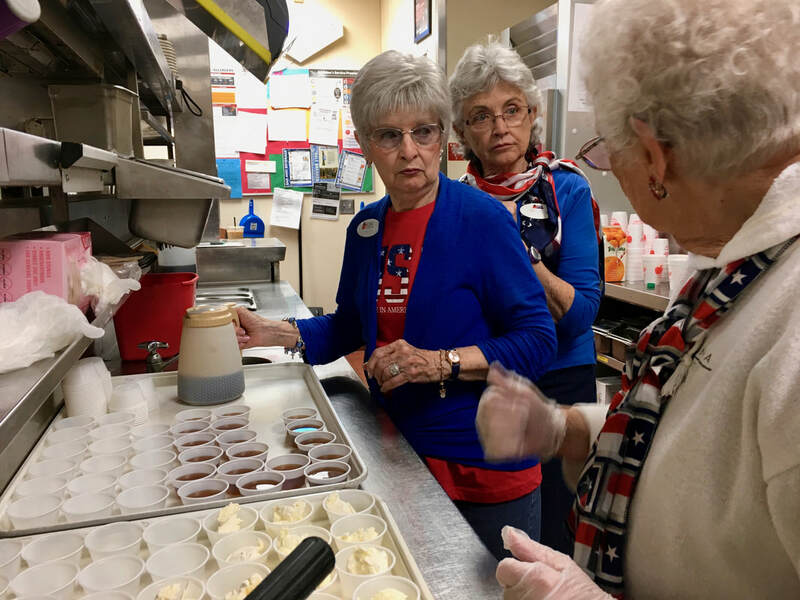 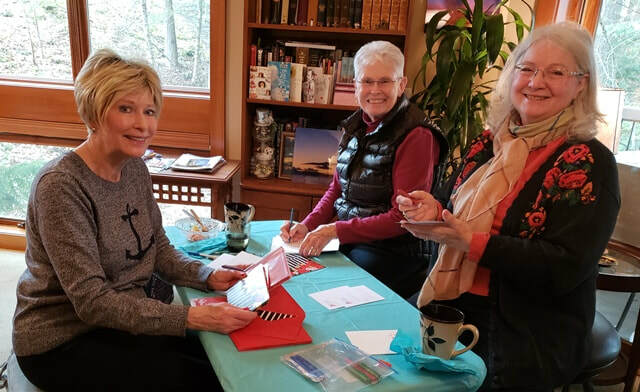 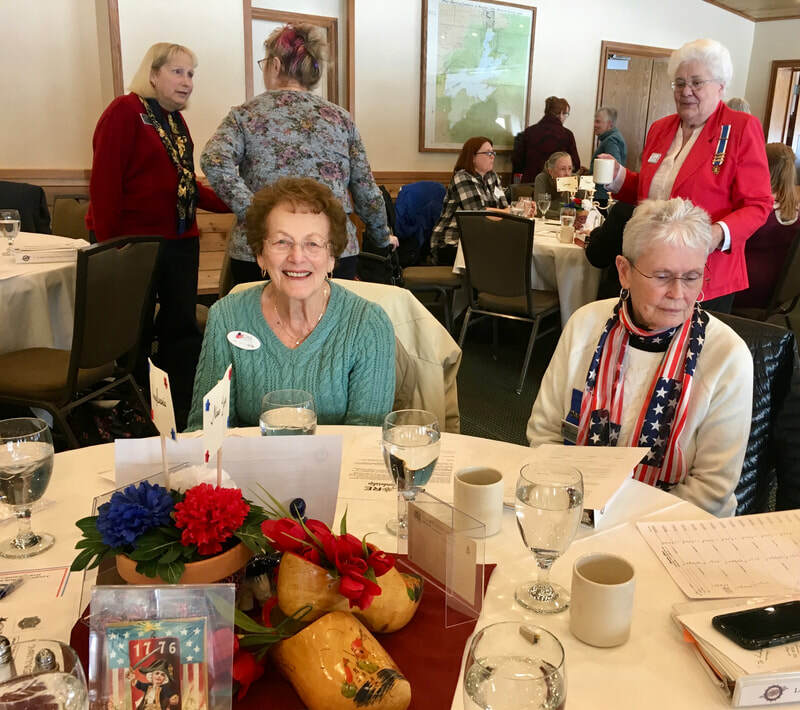 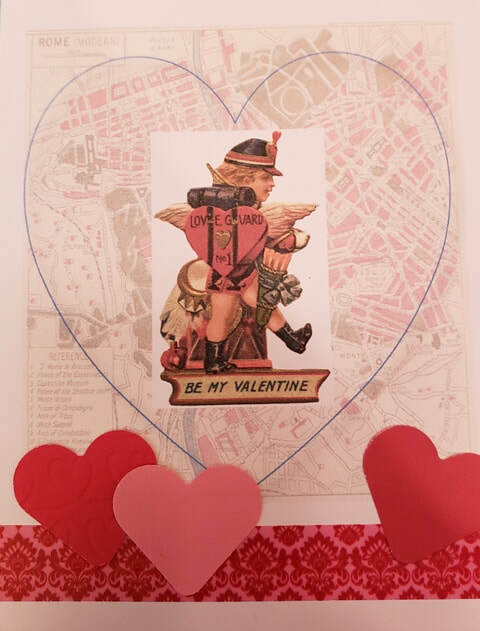 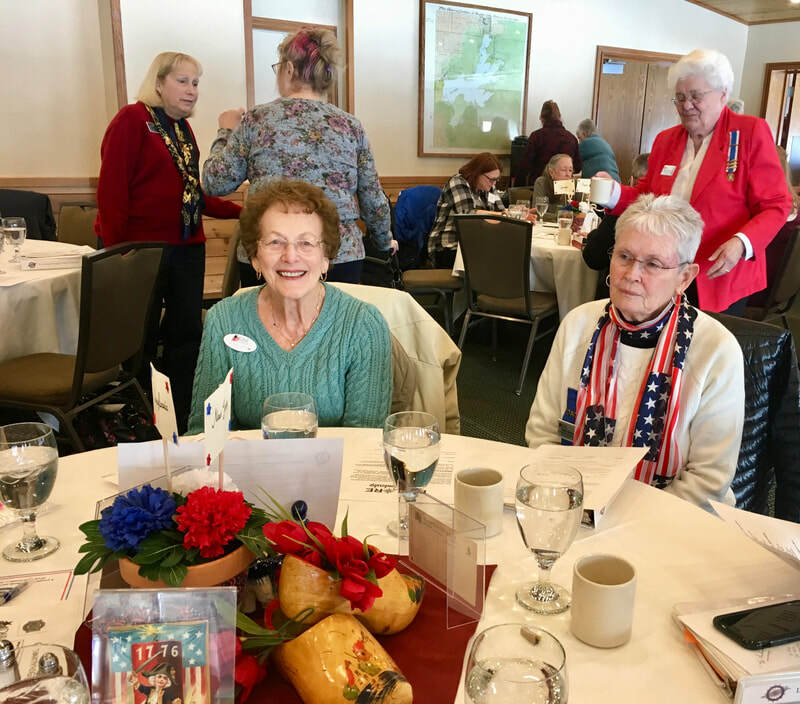 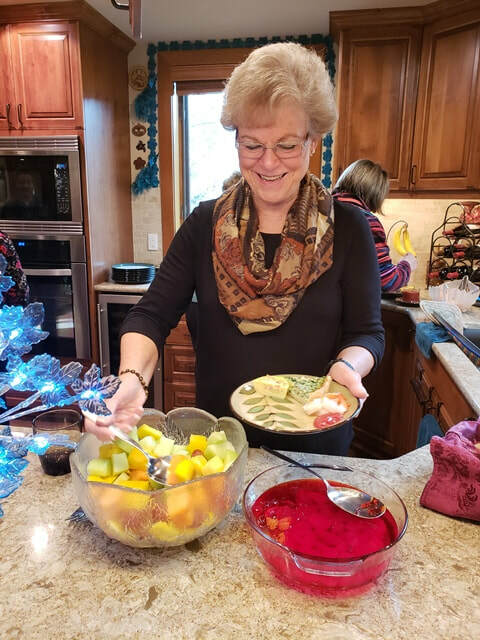 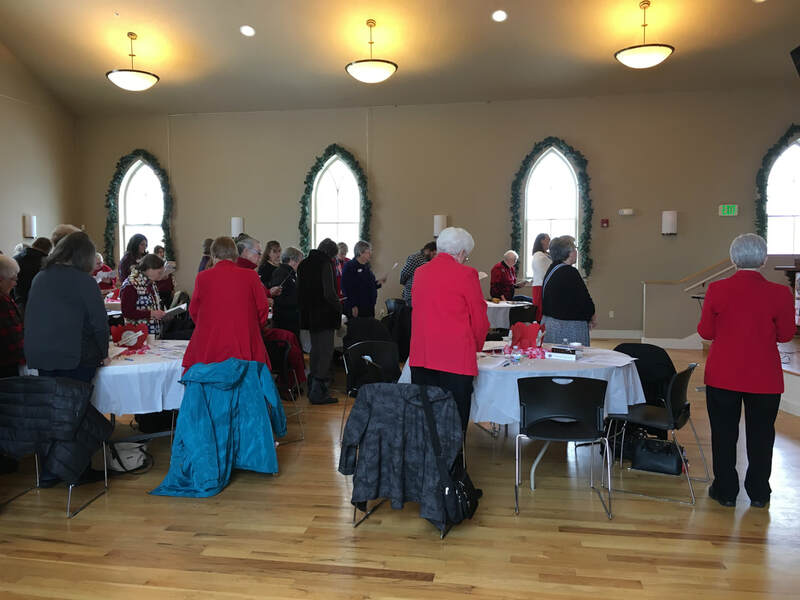 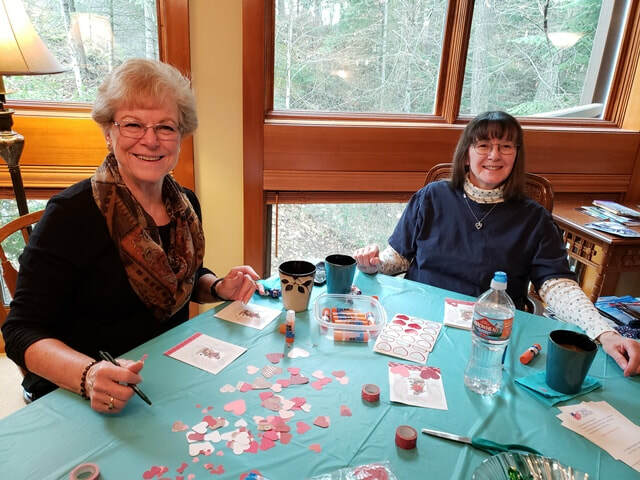 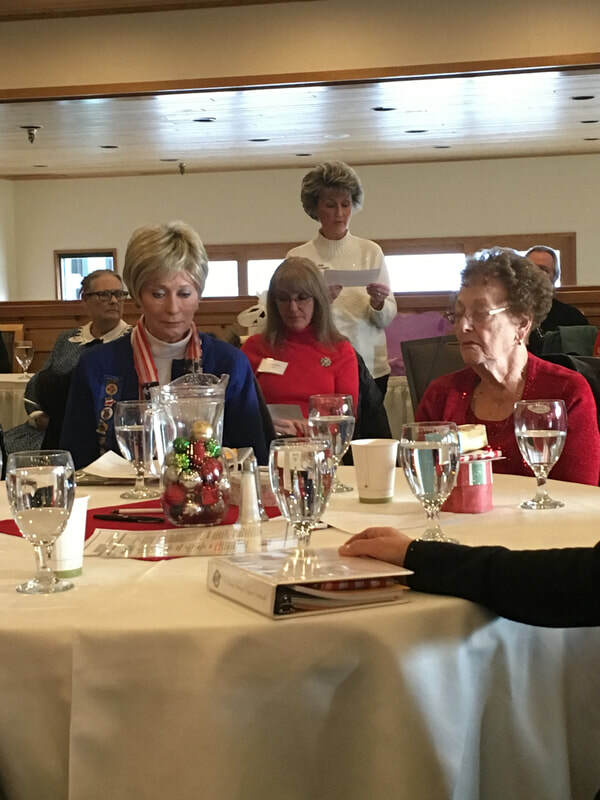 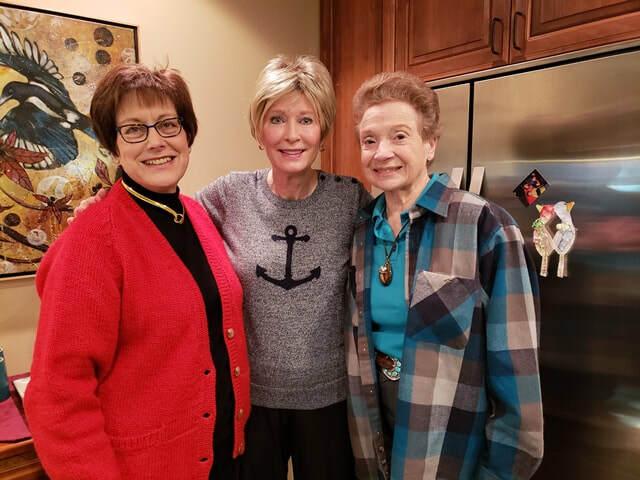 Barb N., DAR Service for Veterans chairman, hosted a lovely brunch for a group of ladies who made Valentines for Veterans. 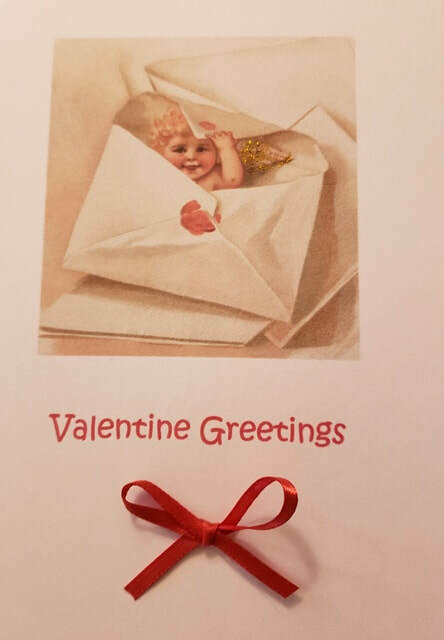 Some of the Valentines will be delivered to patients at the VA Hospital in Spokane, and others sent to Wounded Warriours at Landstuhl Medical Center in Germany. 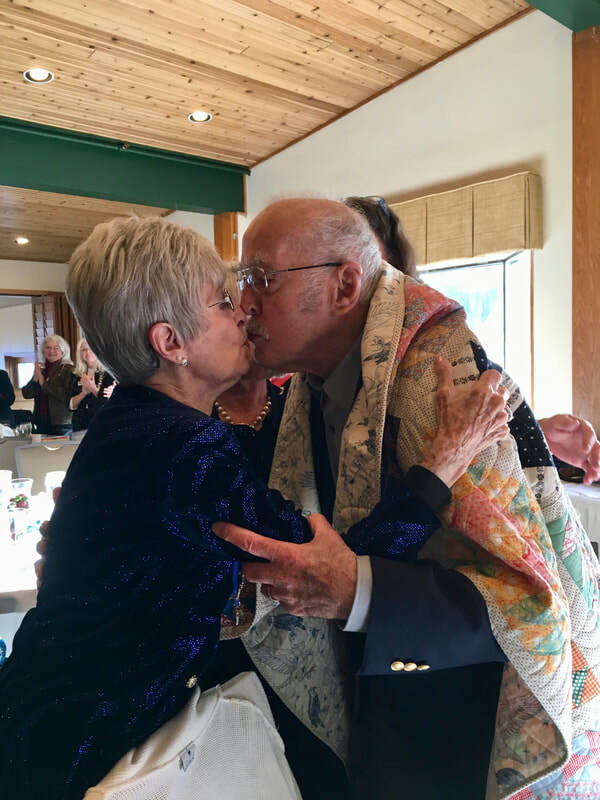 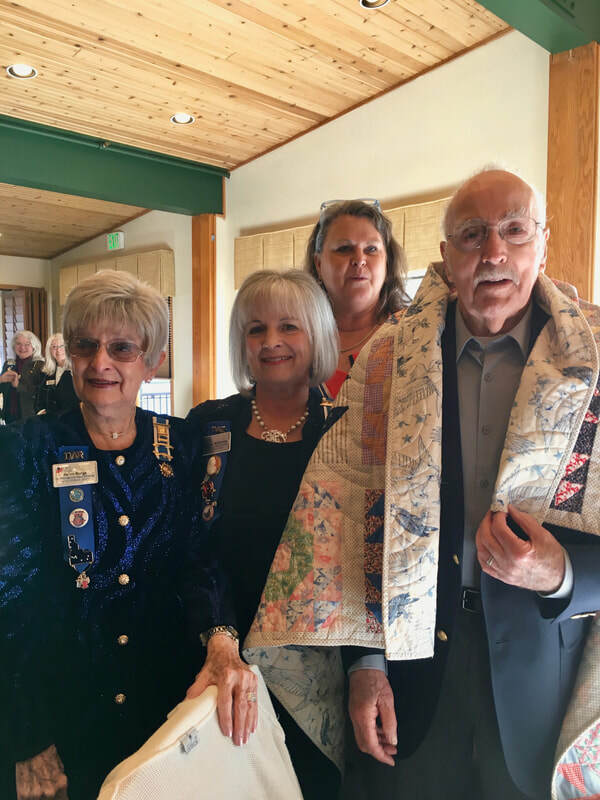 A highlight of our December meeting was the presentation of a Quilt of Valor to Otis Burge, husband of our chapter chaplain and father of our chapter regent, recognizing his military service in the Korean War. Mr. Burge served in the United States Marine Corp from 1948 - 1952. The quilt squares were pieced by his mother in the 1940s, and the squares were lovingly pieced into a quilt by chapter member Liz Jones. 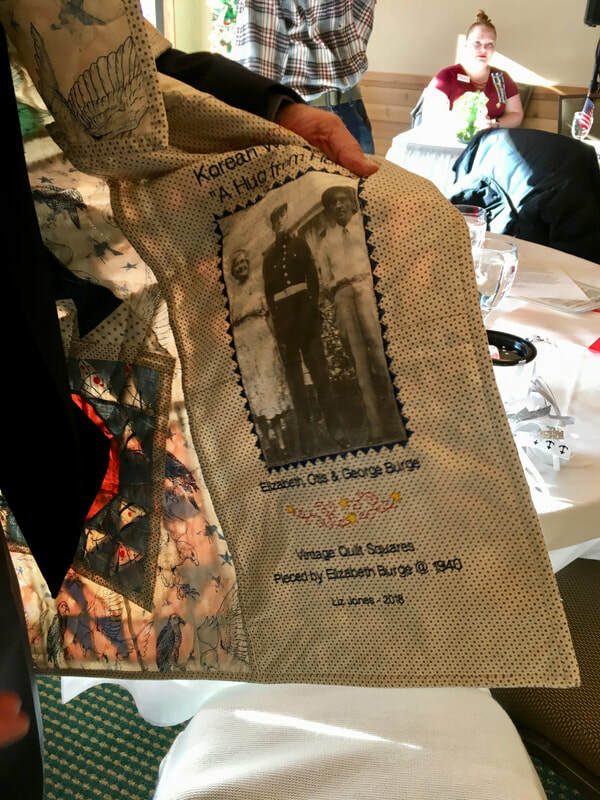 The back side of the quilt includes a photo of Mr. Burge in uniform with his parents. 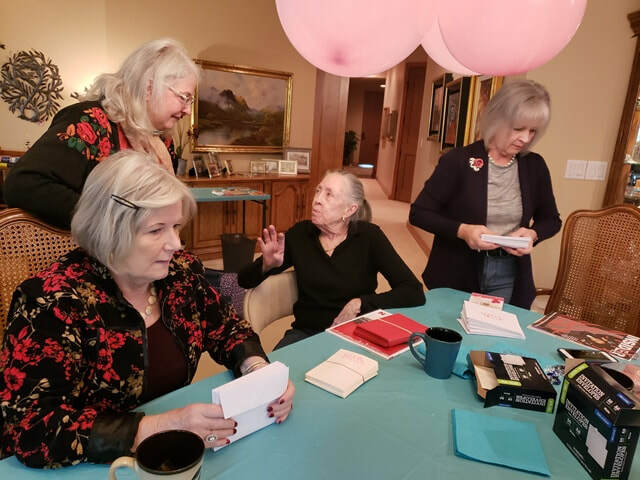 Four generations of the family were present for the surprise presentation. 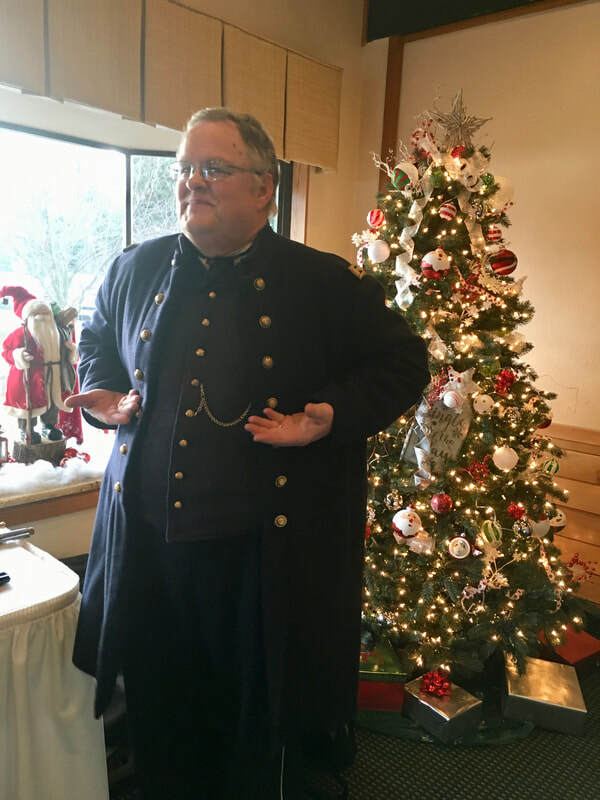 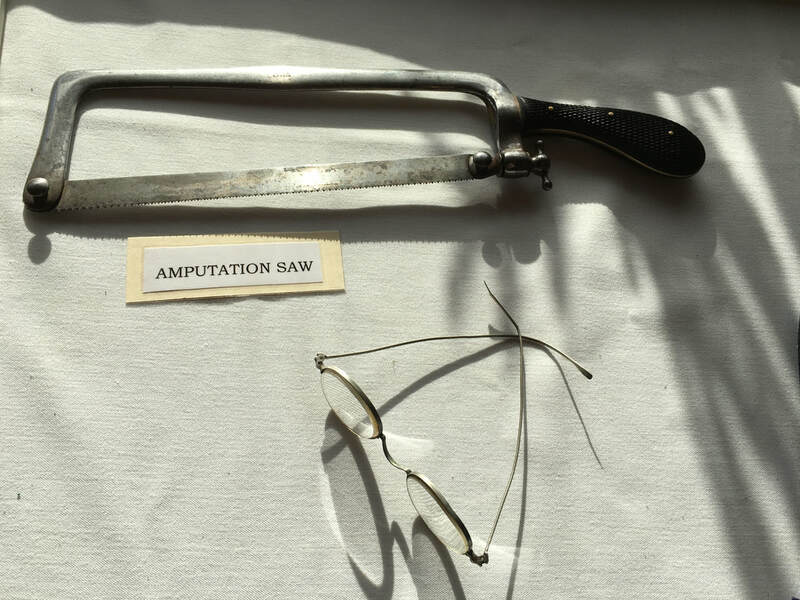 Civil War re-enactor Mike Inman, wearing the uniform of a Civil War surgeon, presented an engaging program on the Civil War, focusing in particular on Christmas during the Civil War. 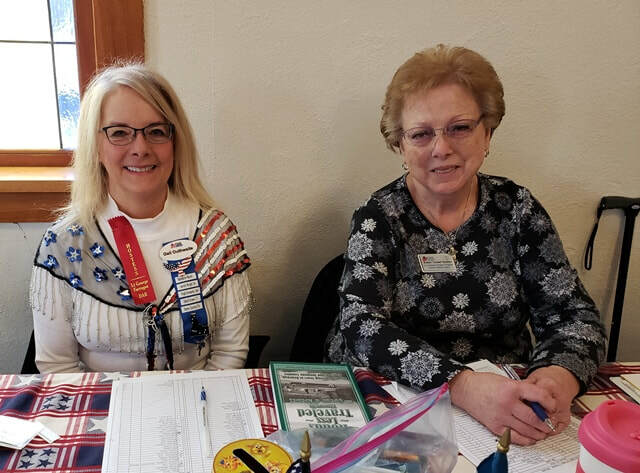 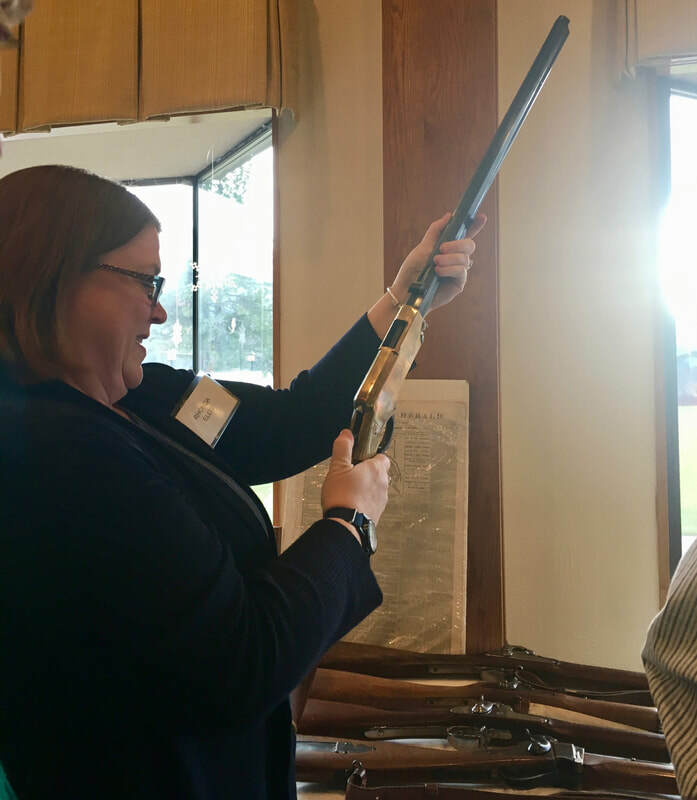 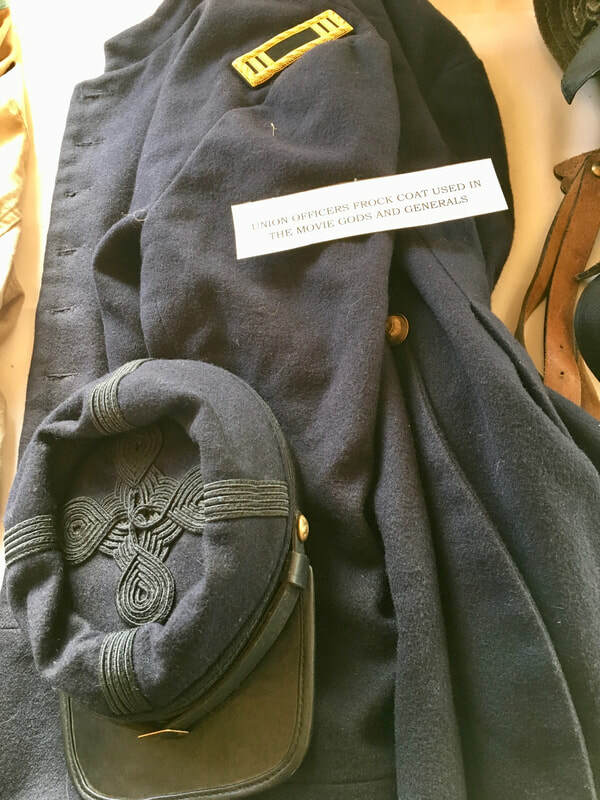 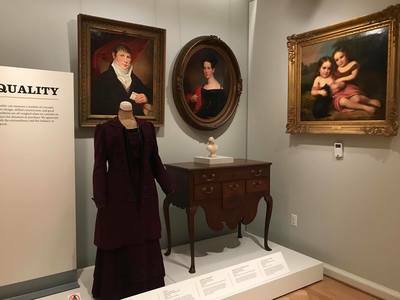 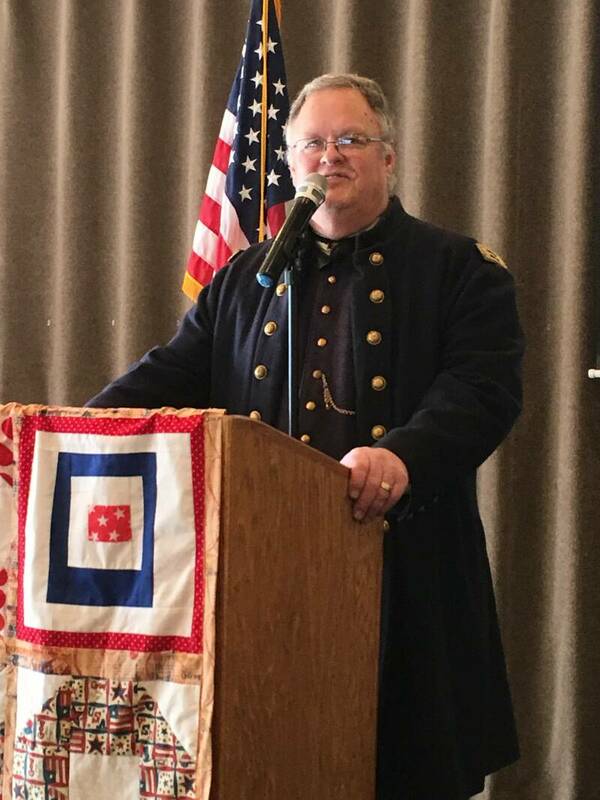 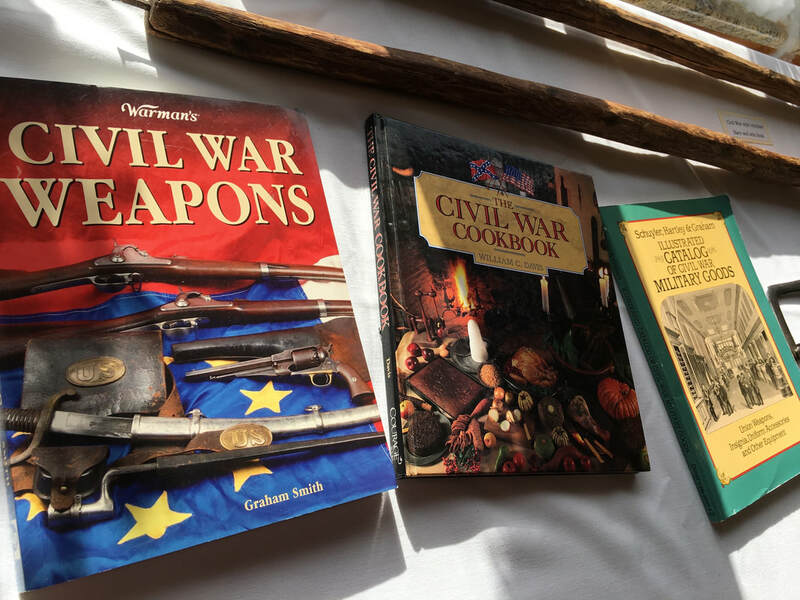 Selected attendees took on the role of a real person from the Civil War as they read heart-wrenching stories from diaries or letters.Attendees were encouraged to handle the items on display and to sample hard tack, molasses cookies and candy prepared from Civil War era recipes. 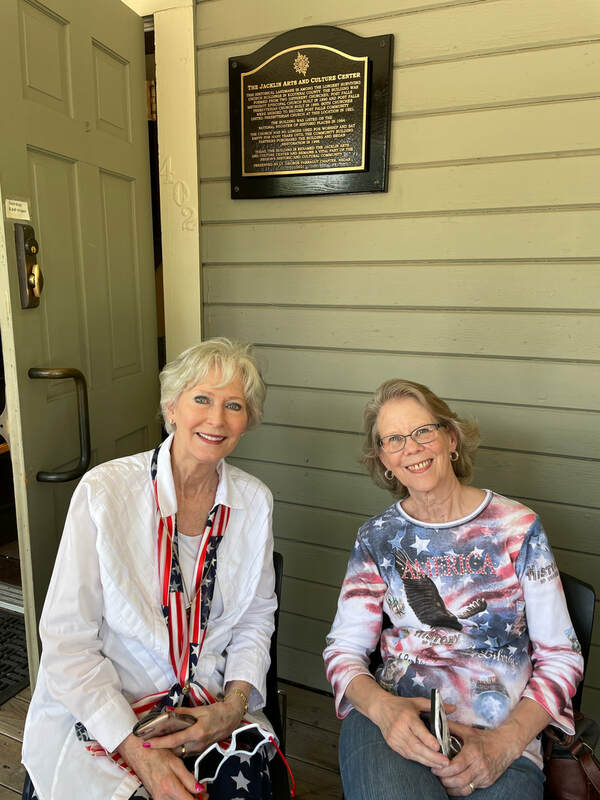 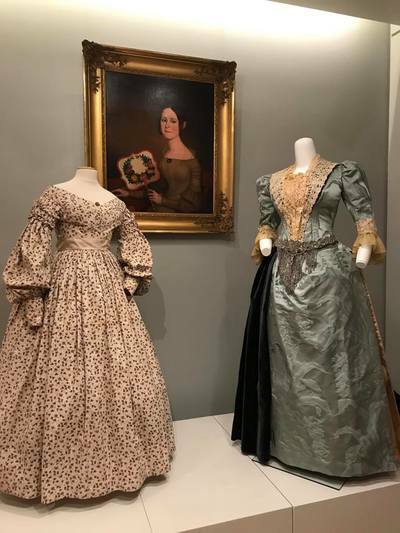 Lt. George Farragut Daughters are passionate about the mission of DAR, and it shows at our meetings and in our activities. 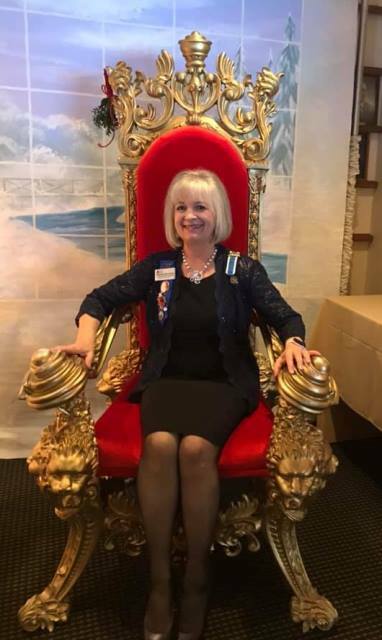 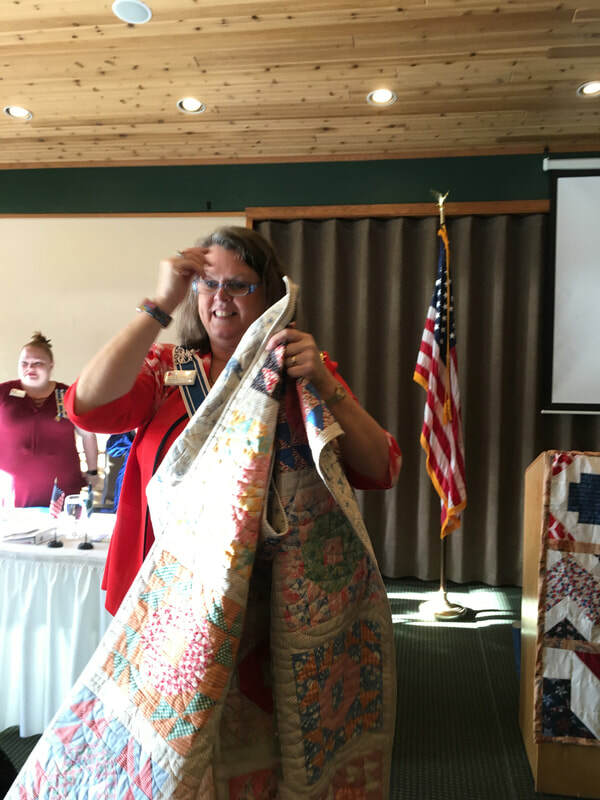 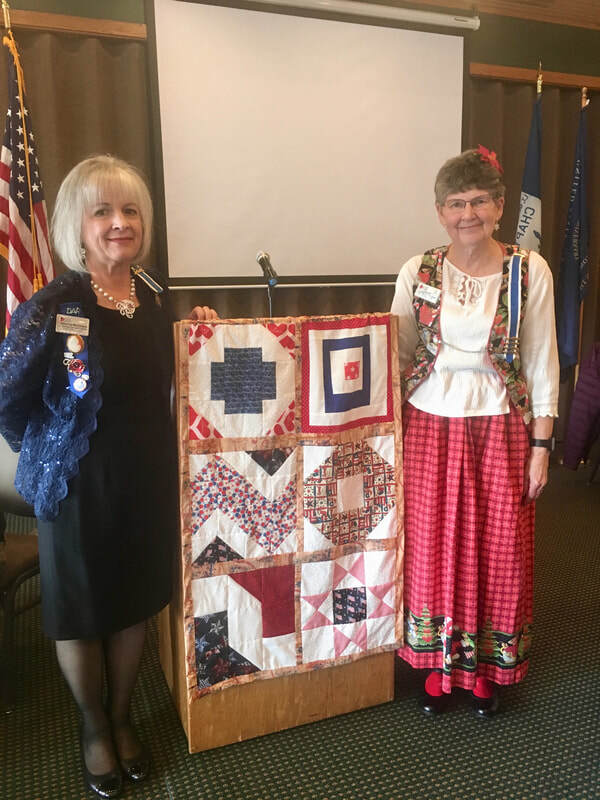 Gracing our podium is a quilt made by chapter member Karen T., pictured with Chapter Regent Catherine McClintick who also posed as Queen for a Day in Santa's chair. 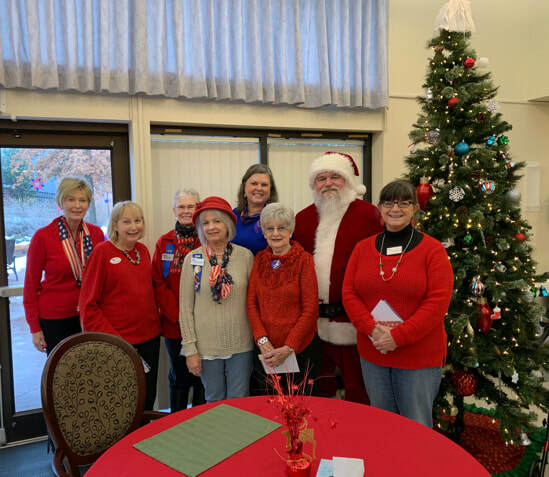 A small group from Lt. George Farragut Chapter visited the VA Hospital in Spokane to deliver Christmas greetings. 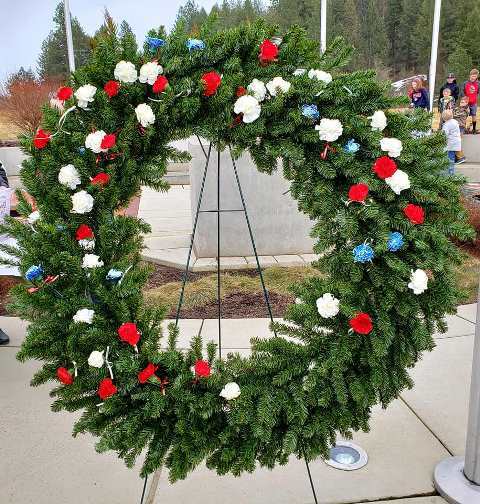 Our chapter was honored to once again participate in Wreaths Across America. 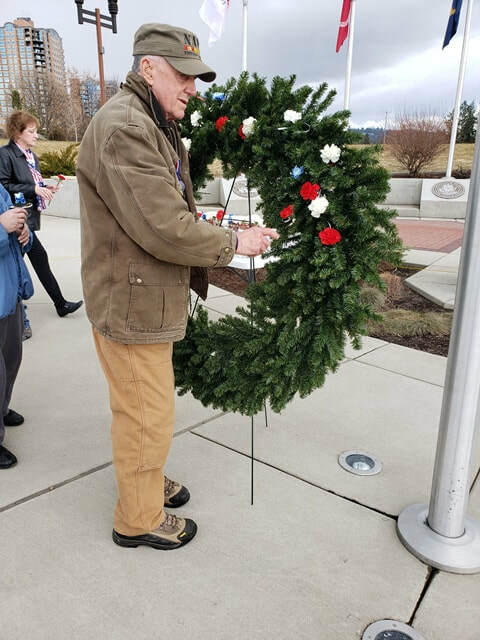 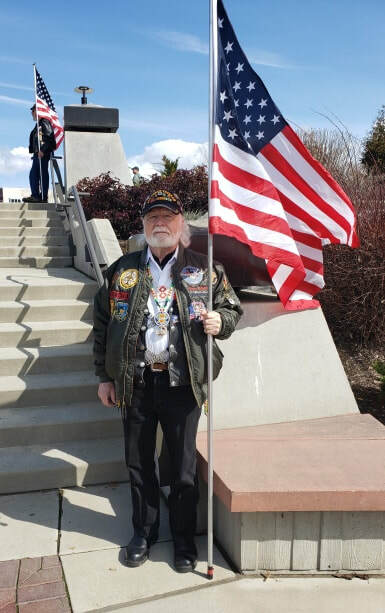 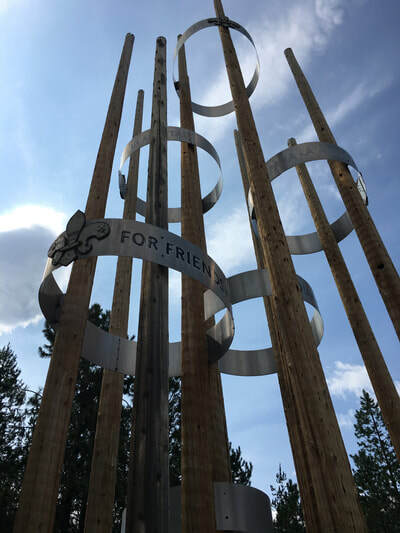 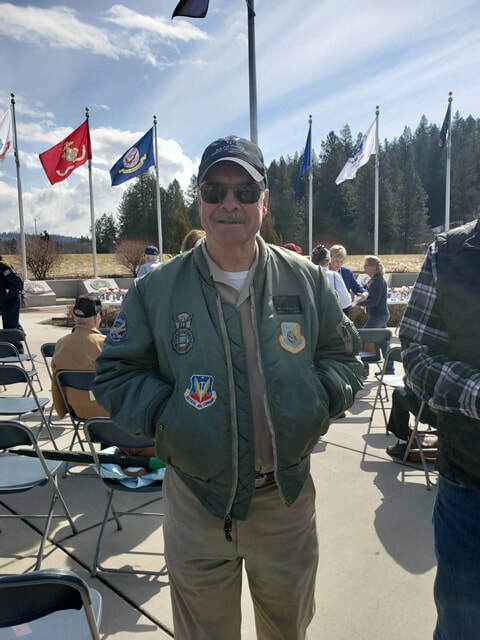 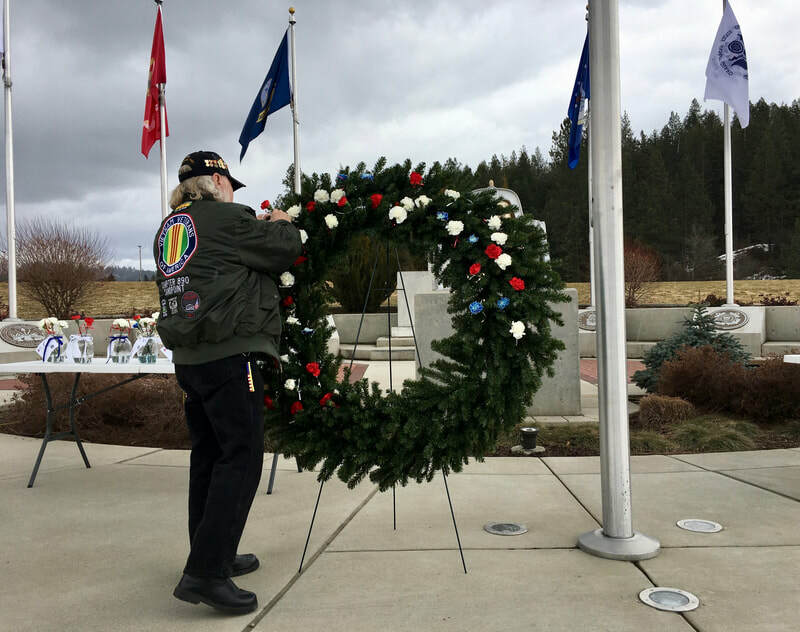 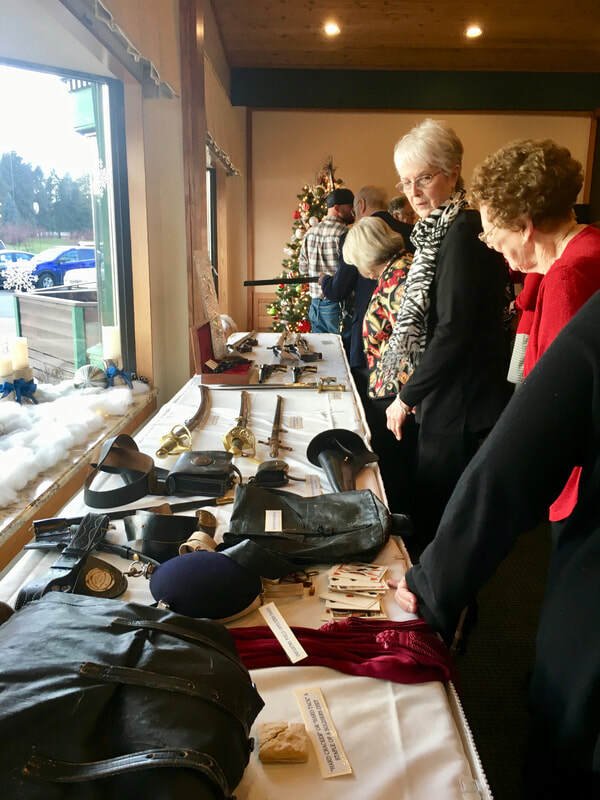 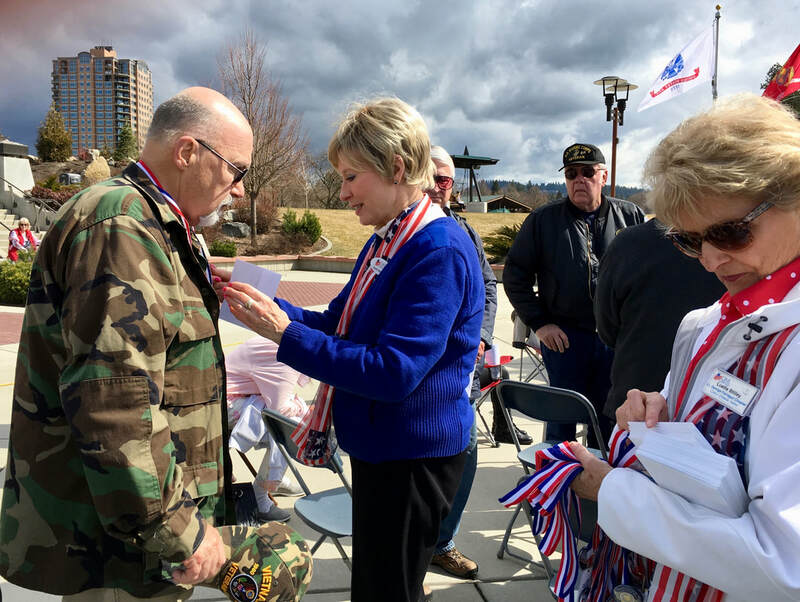 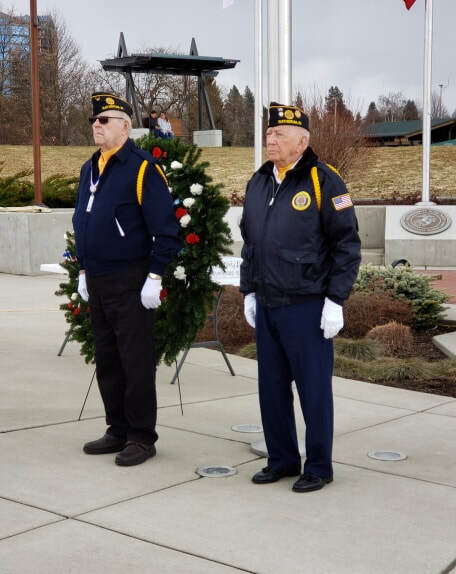 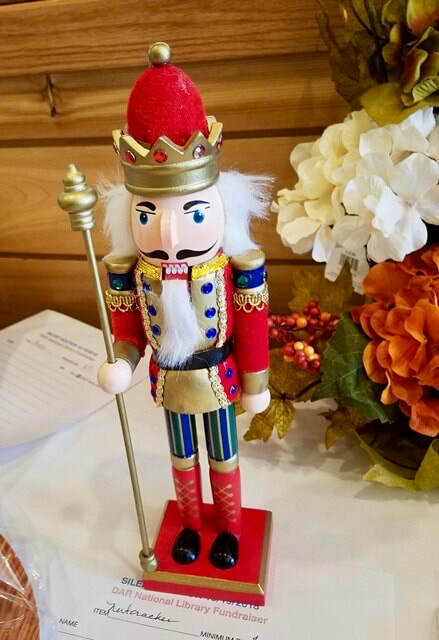 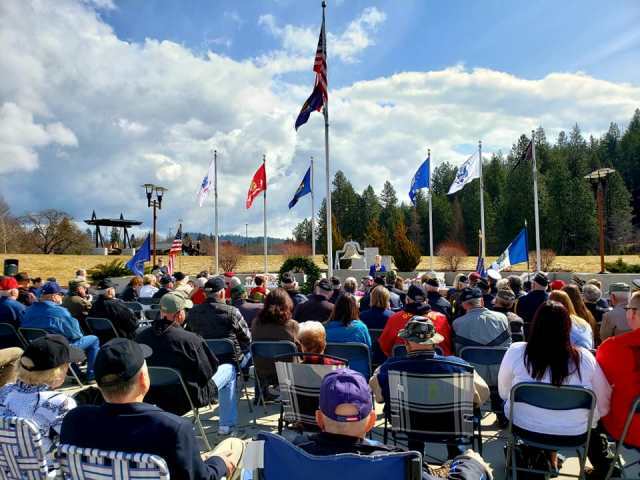 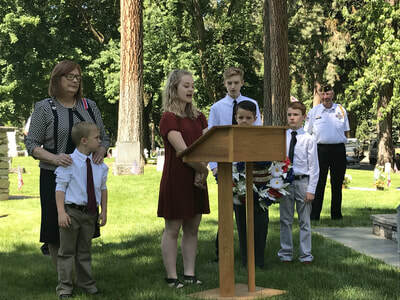 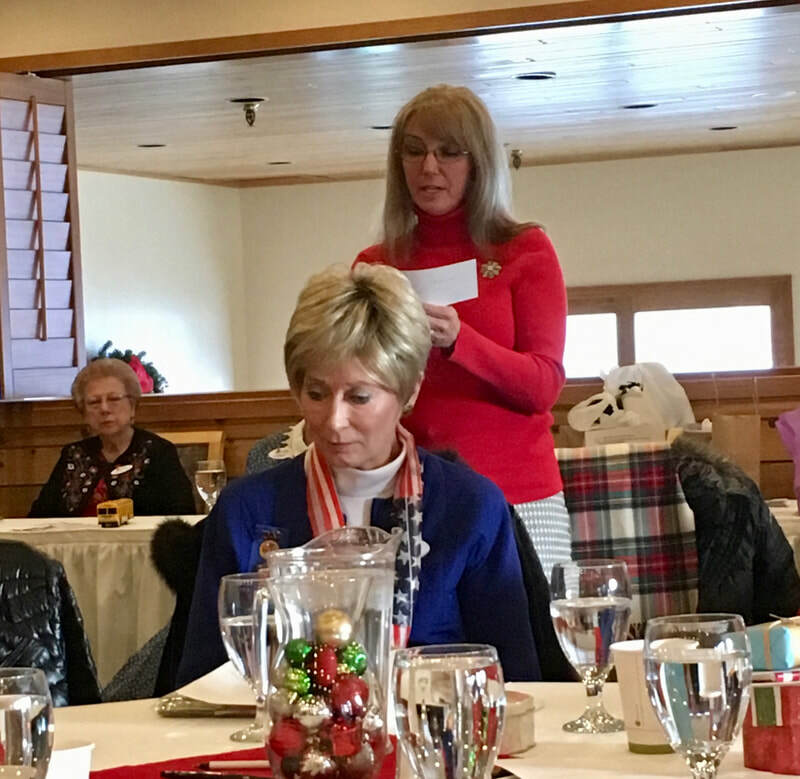 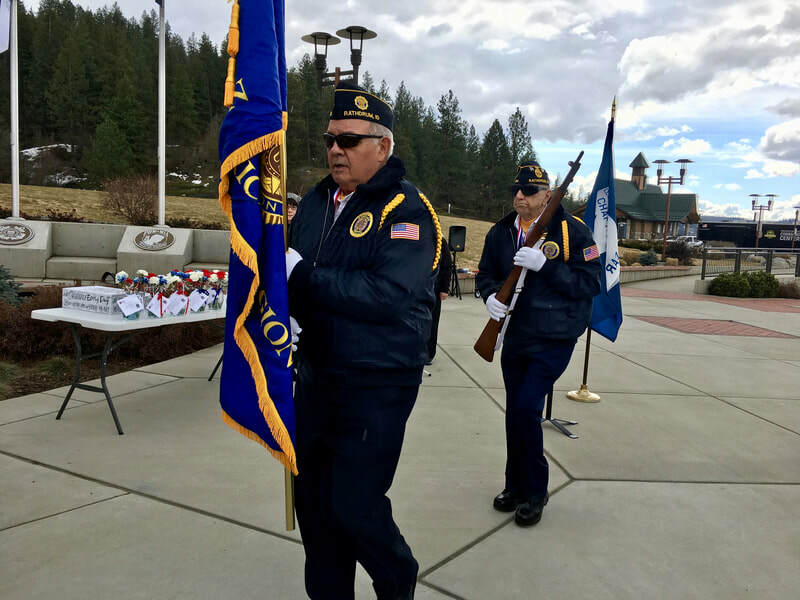 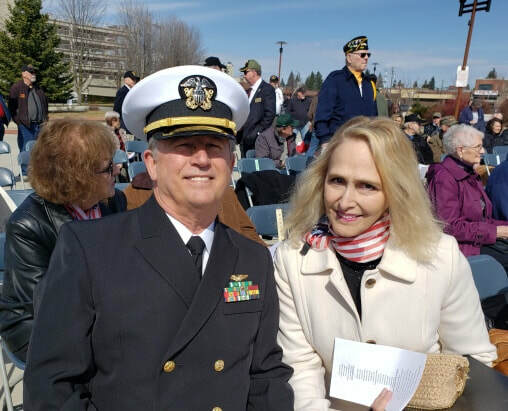 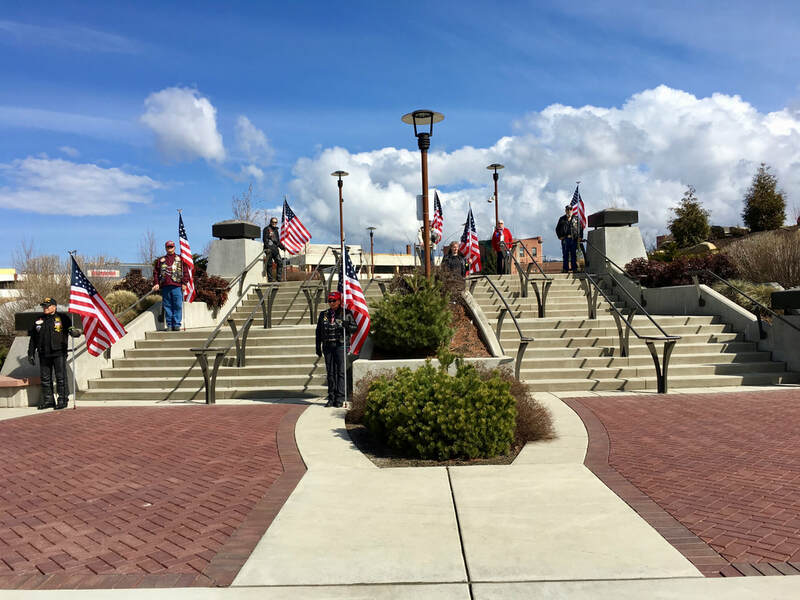 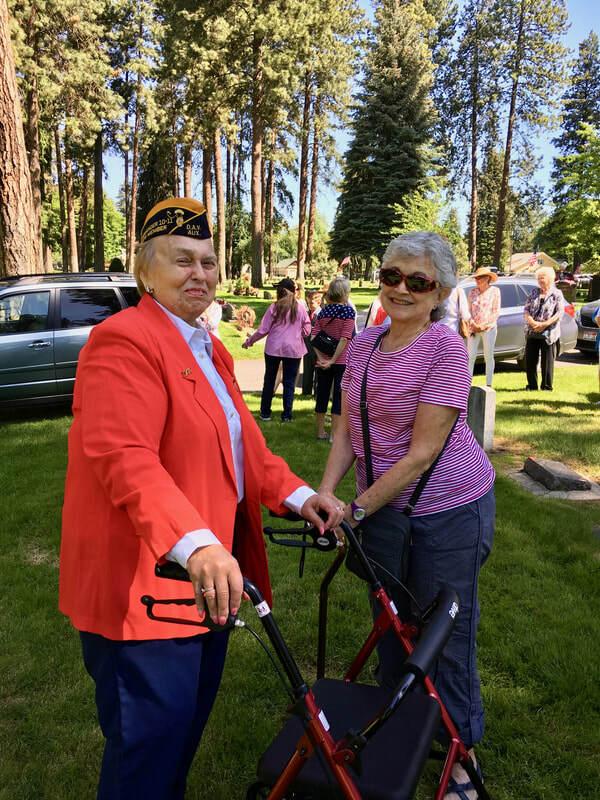 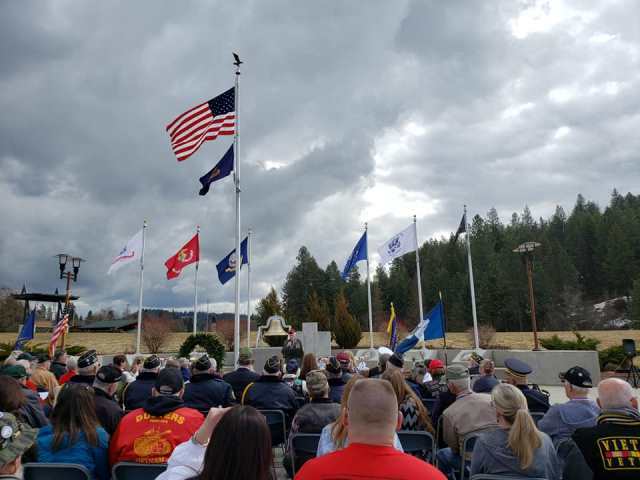 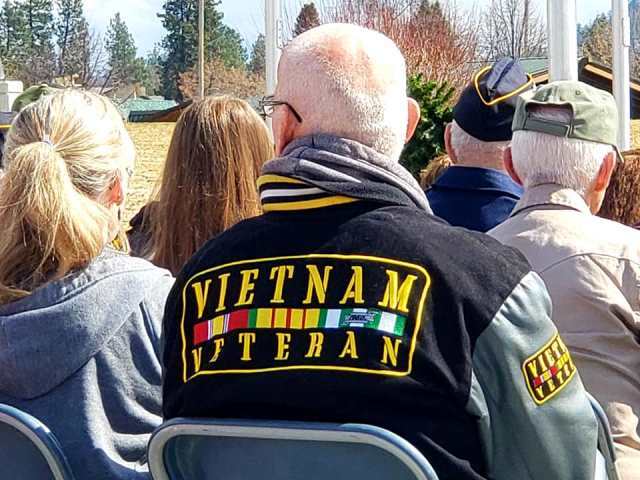 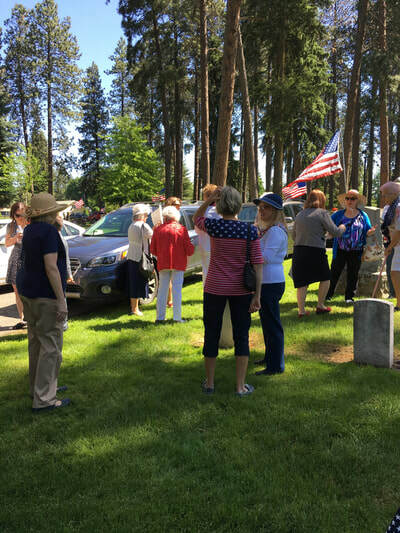 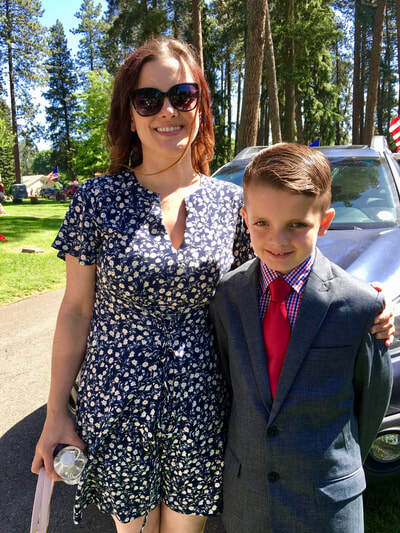 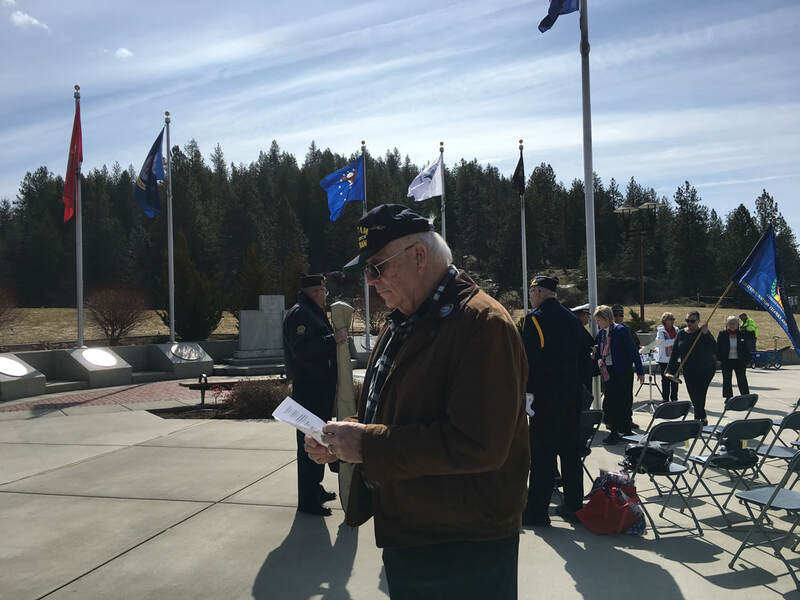 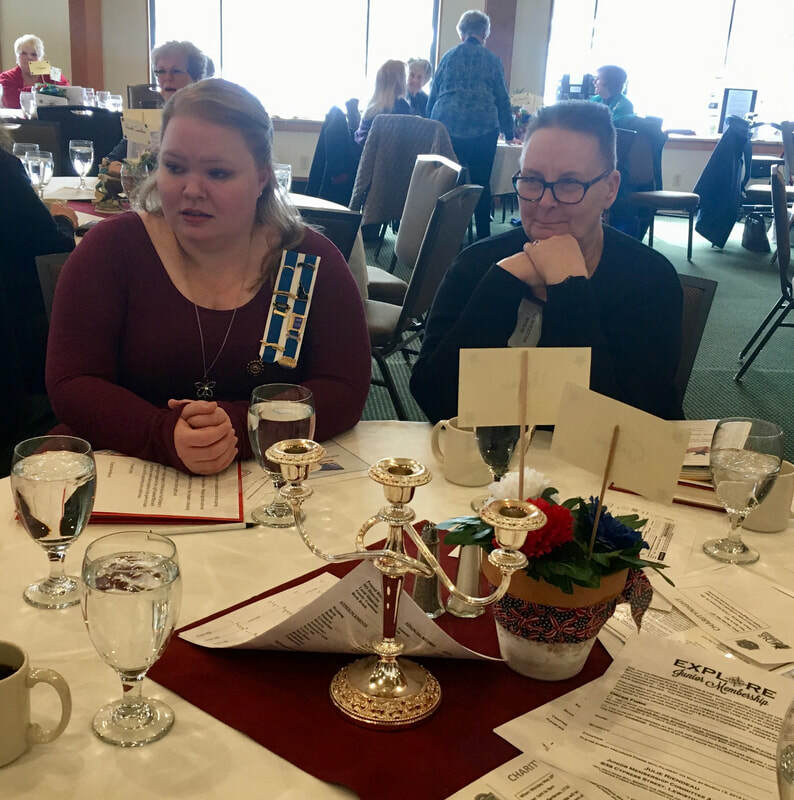 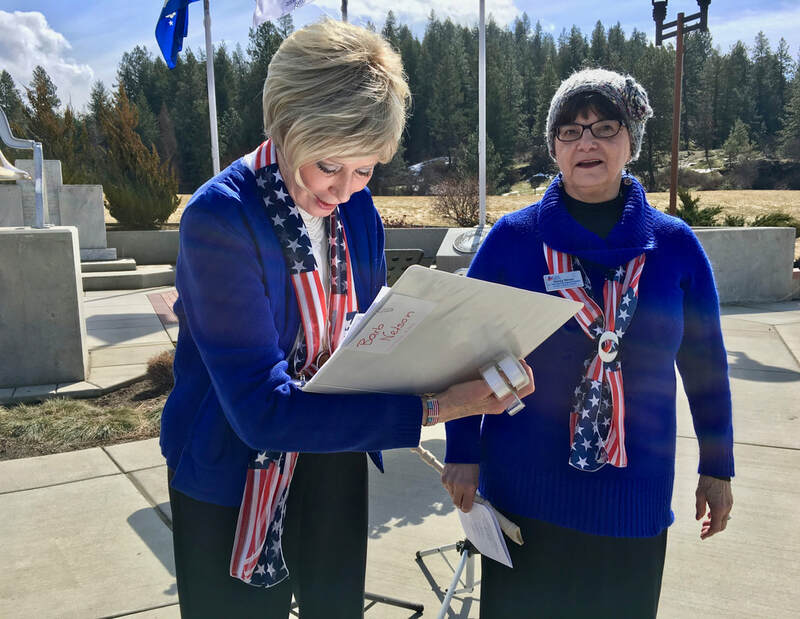 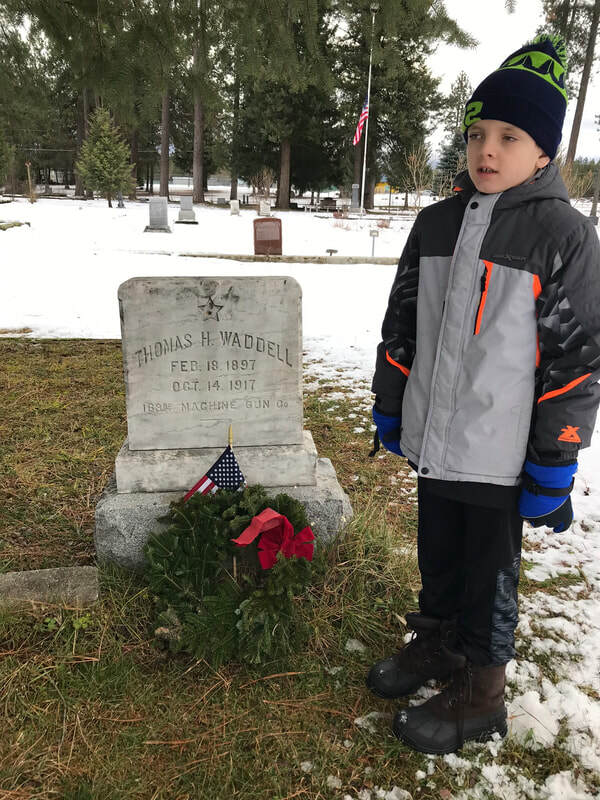 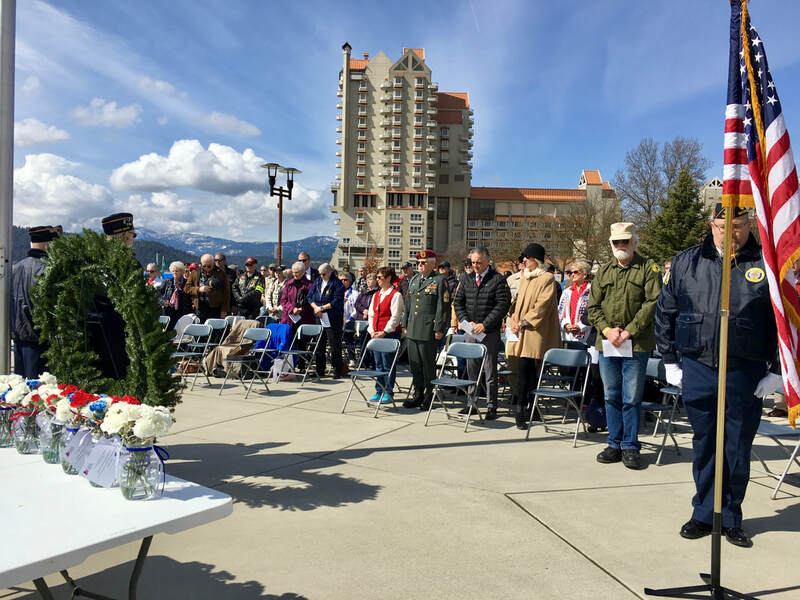 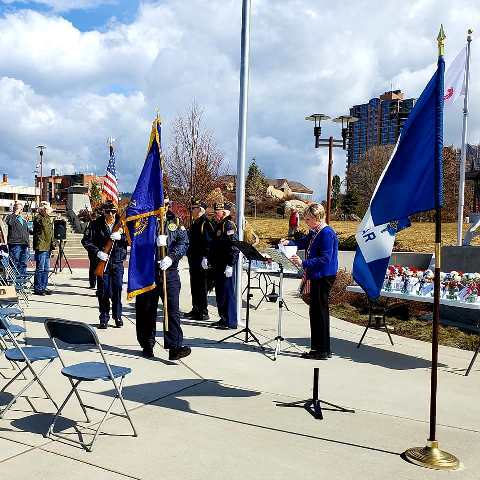 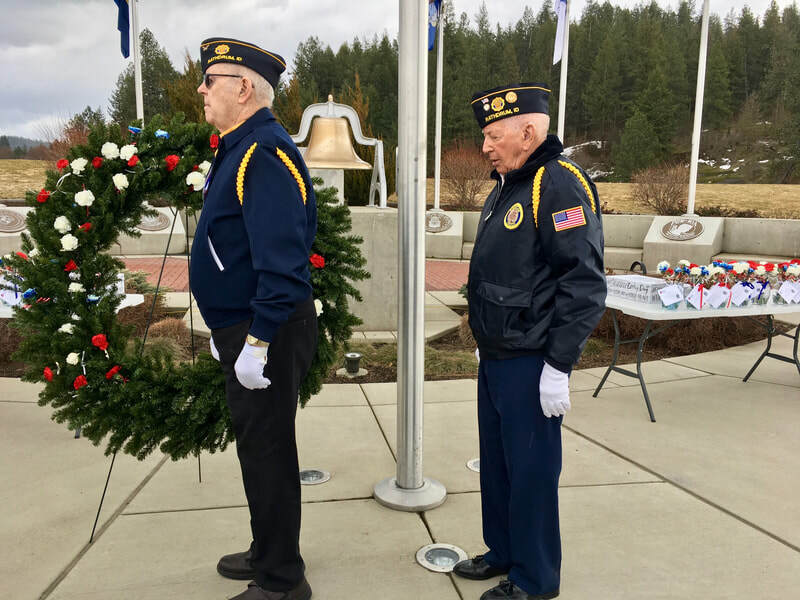 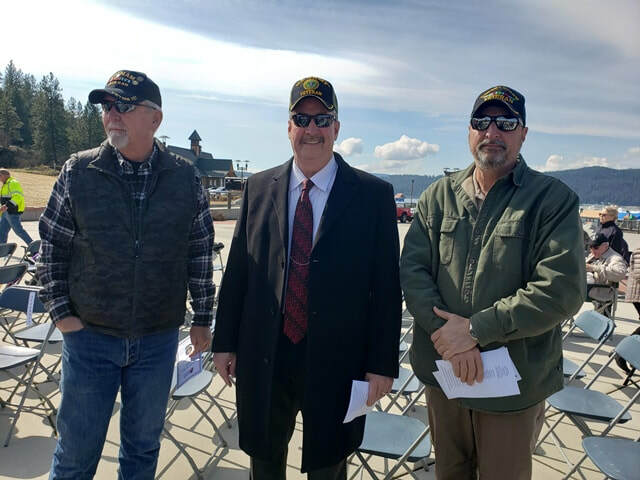 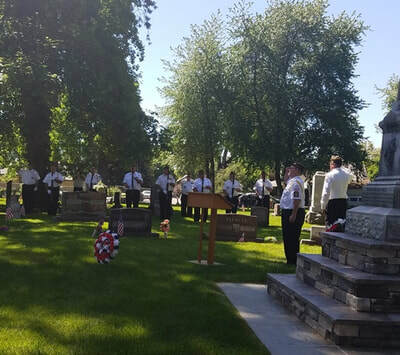 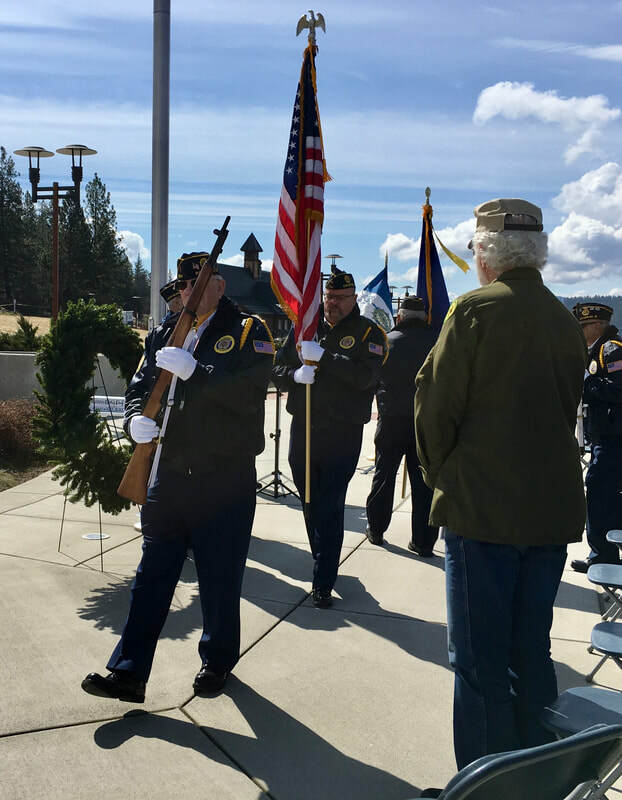 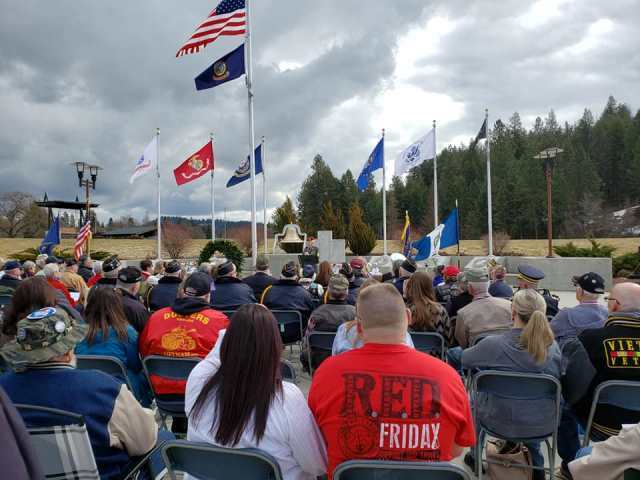 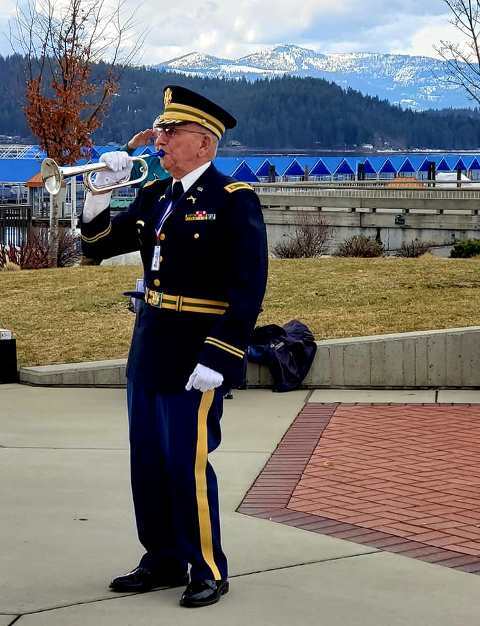 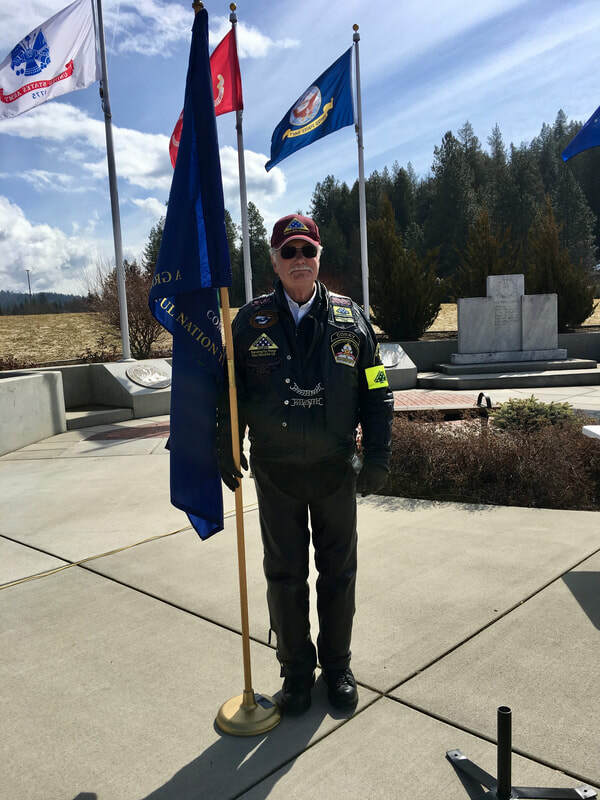 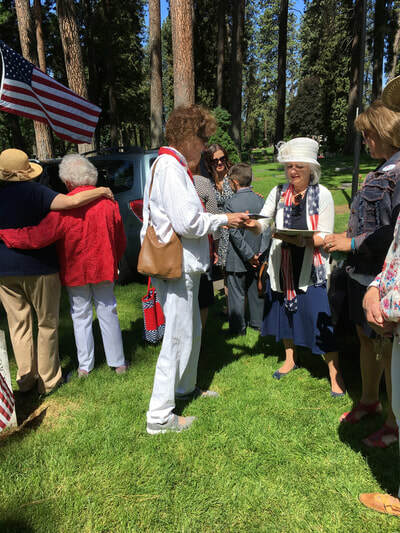 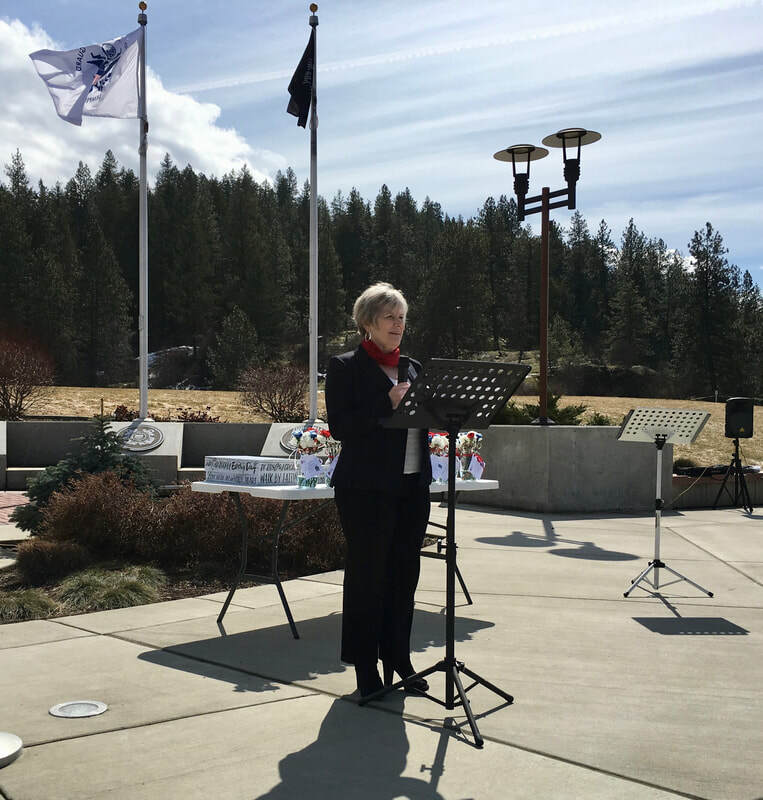 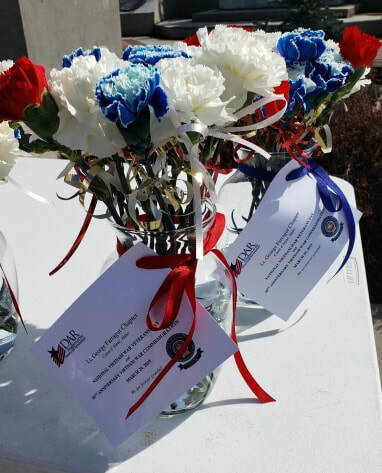 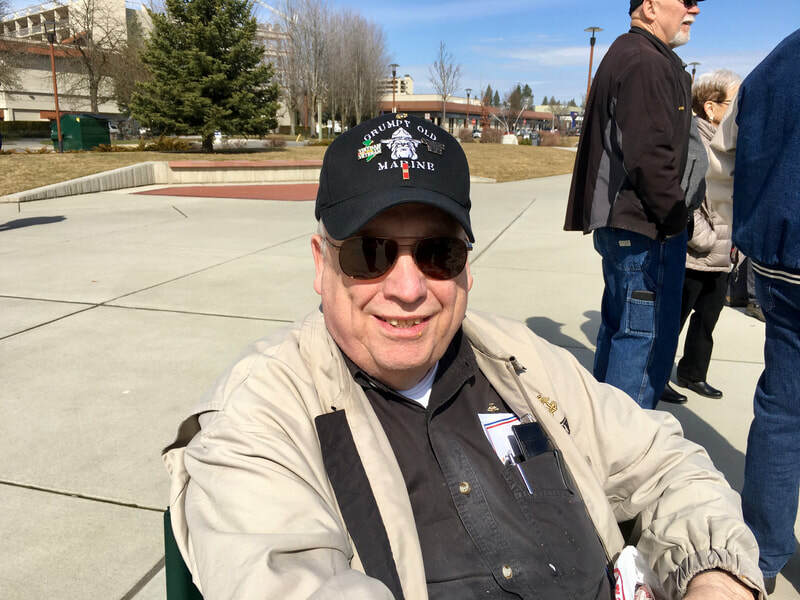 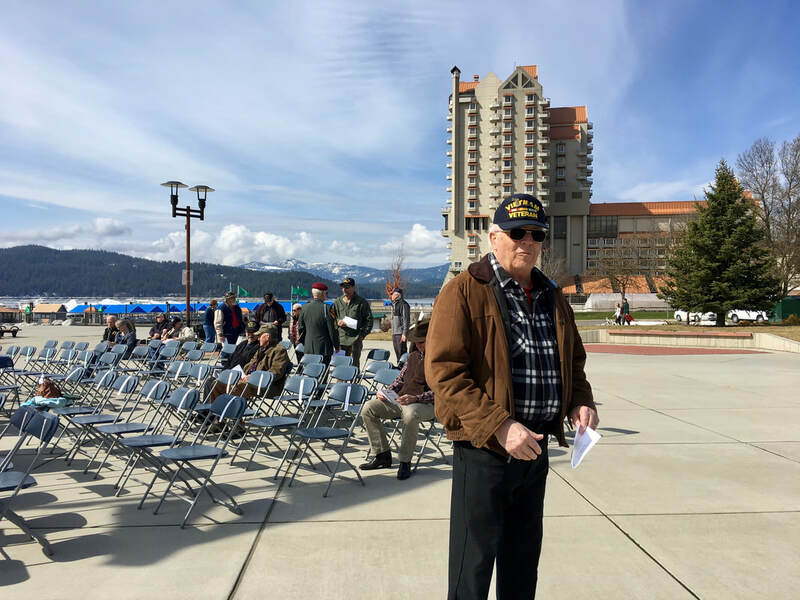 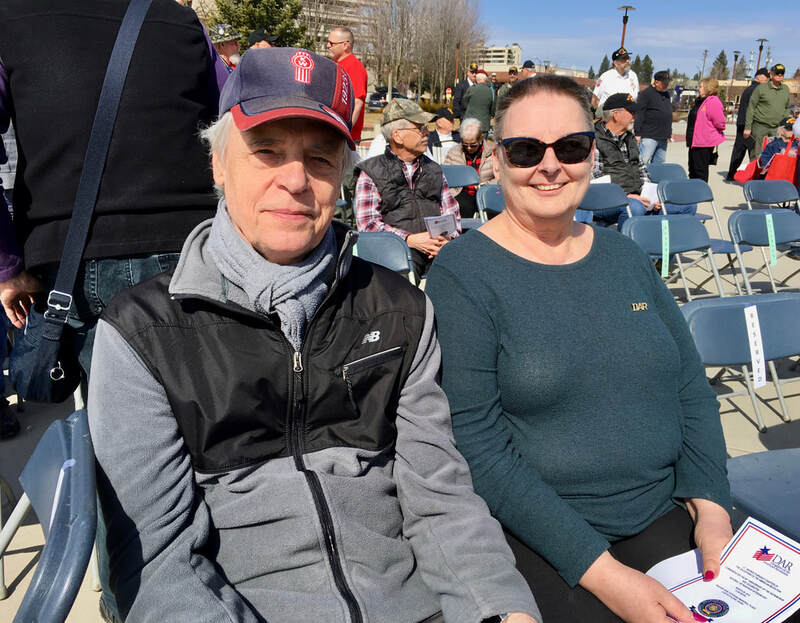 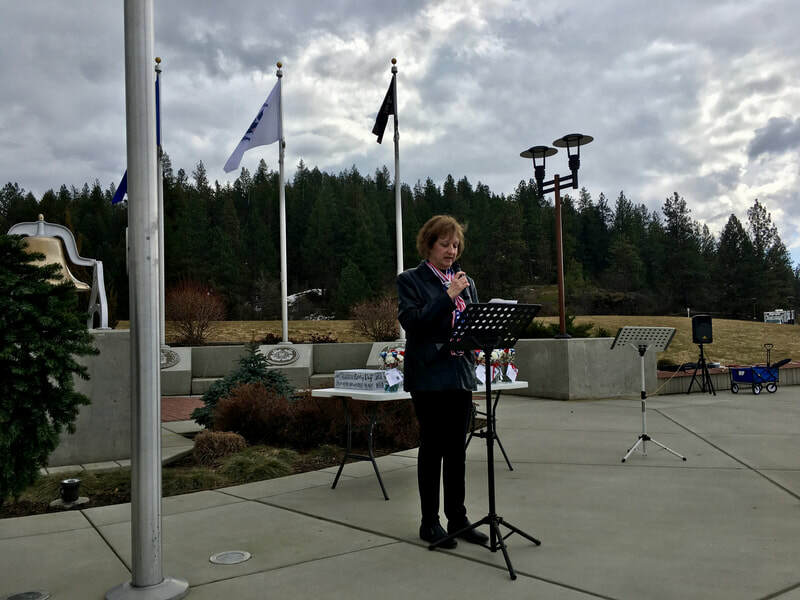 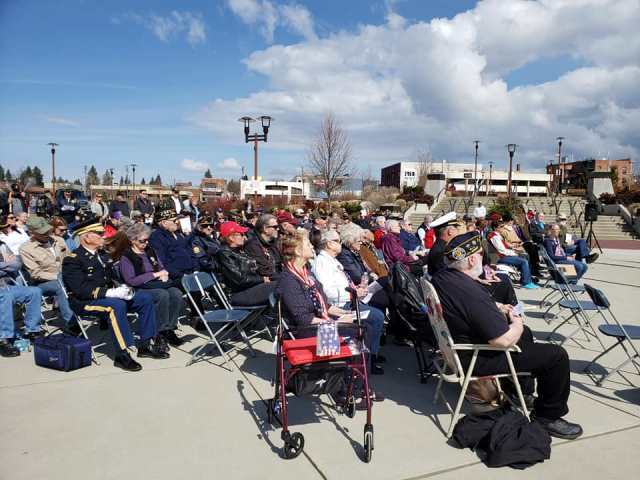 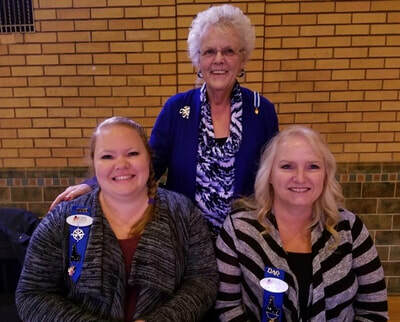 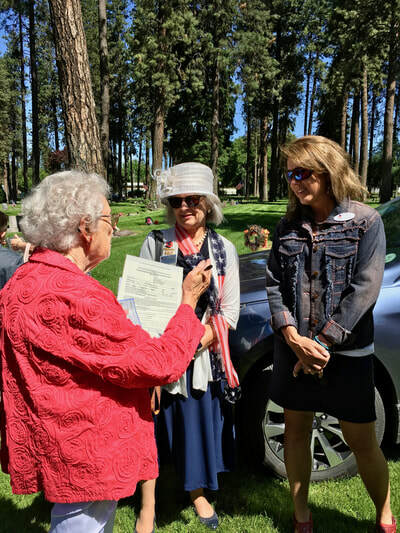 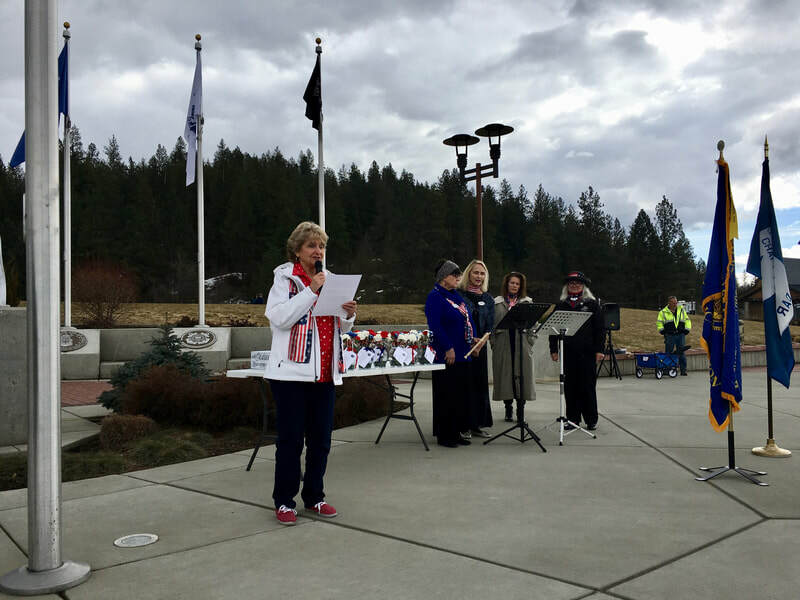 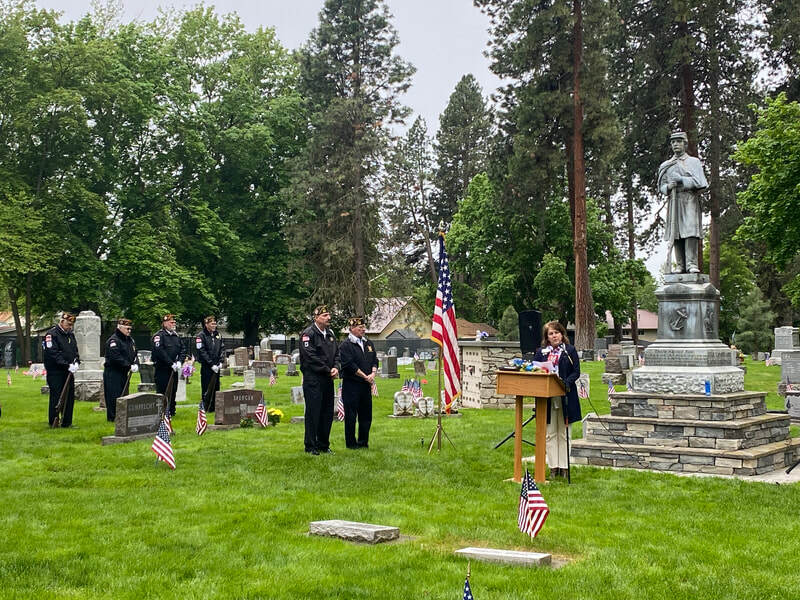 Lt. George Farragut Chapter donated $150 to the program and encouraged Daughters to participate in one of two local ceremonies--at Coeur d'Alene Memorial Gardens or Pinegrove Cemetery in Rathdrum. 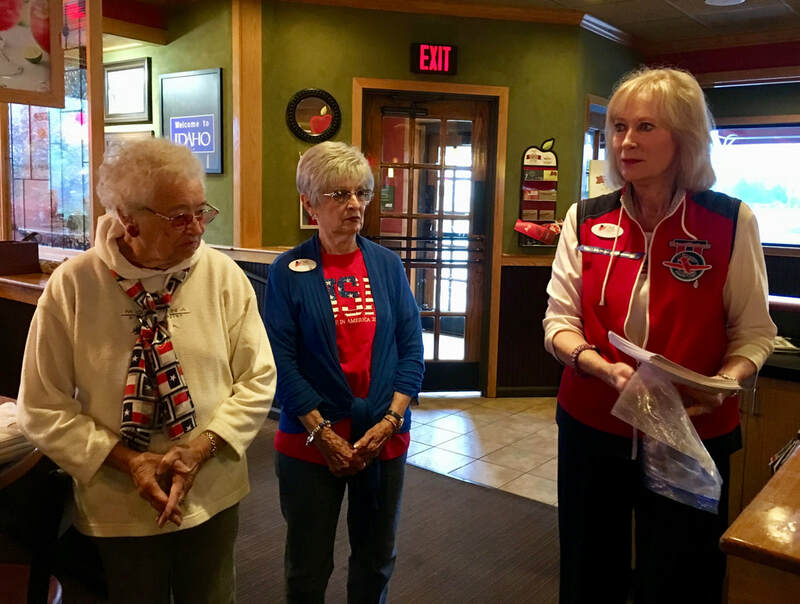 After being contacted by a local 5th grade teacher wanting support with a unit study on the colonies, up rose "Liberty Ladies," our chapter's Community Classroom Committee. 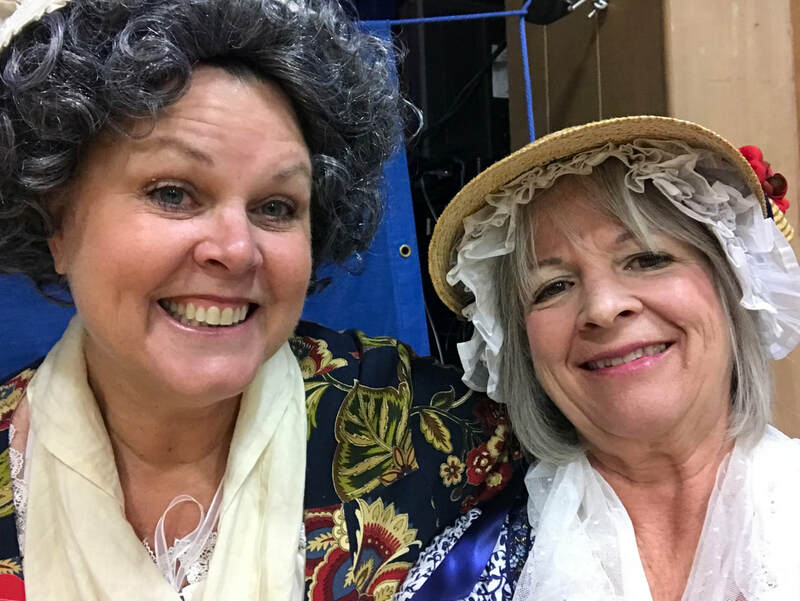 Honorary State Regent Liz Jones and Chapter Regent Catherine McClintick dressed as colonial ladies to share about our nation's birth. 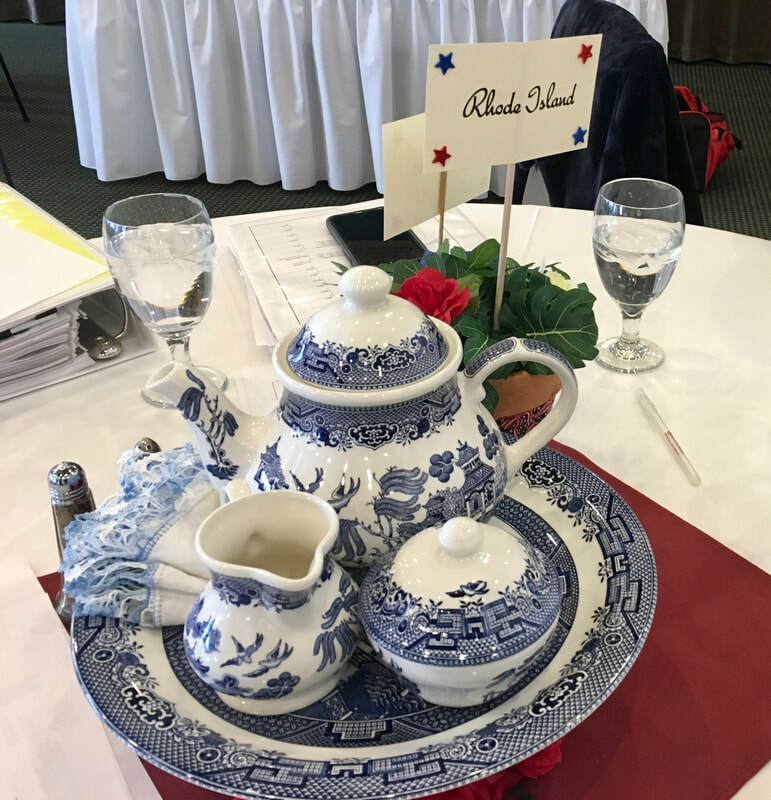 The rambunctious students participated in a fun Stamp Tax activity where the students were taxed for simply having blue eyes, having shoes with ties, using paper or pencils at school, wearing green, etc. 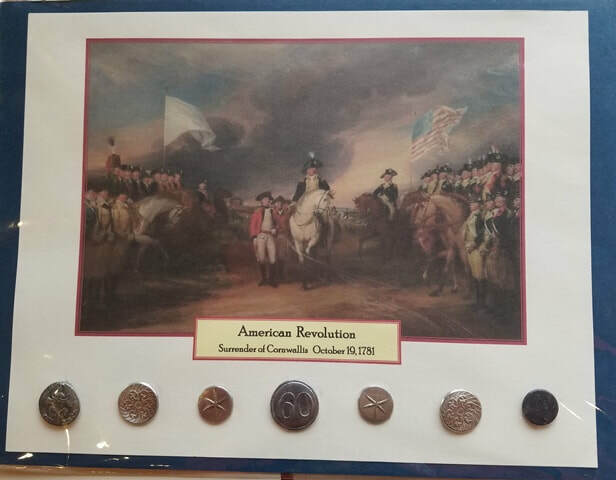 The students soon saw the correlation of how ridiculous some of the taxes were that King George imposed. Word has it that the Liberty Ladies have been invited back next year! 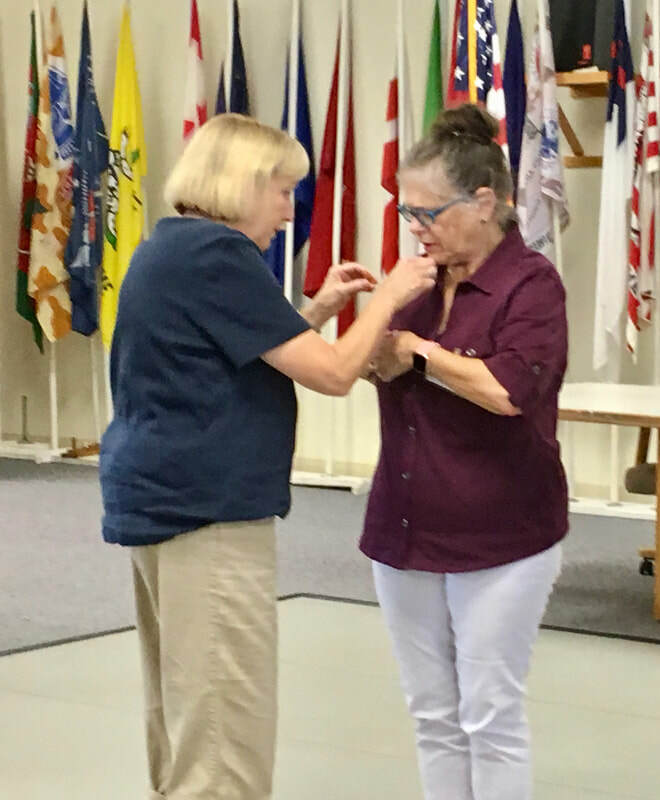 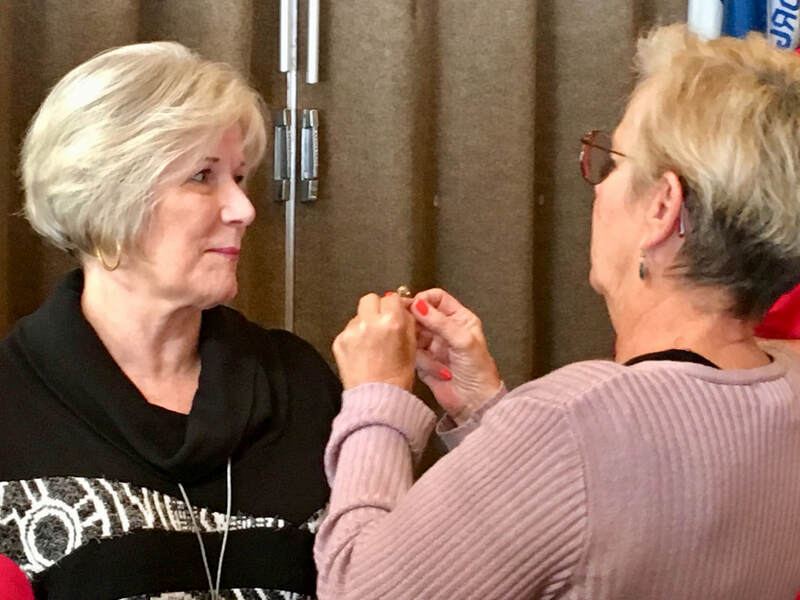 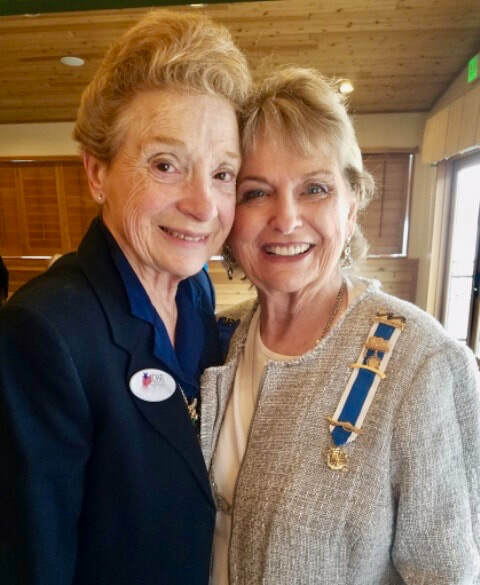 Friendships are kindled during our Meet and Greet time before our chapter meeting.During our meeting we were privileged to witness new member Daisy take the Oath of Membership in a ceremony presided over by Chaplain Helen B. Daisy's husband participated by pinning her. 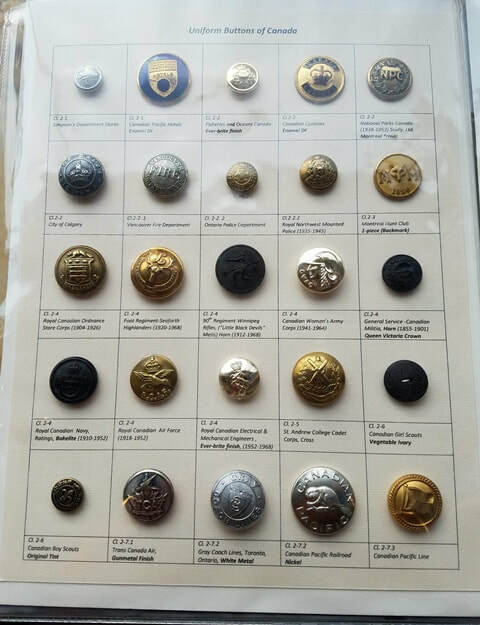 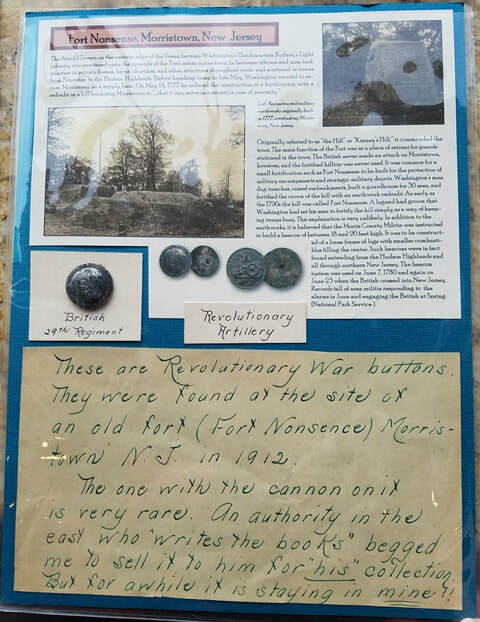 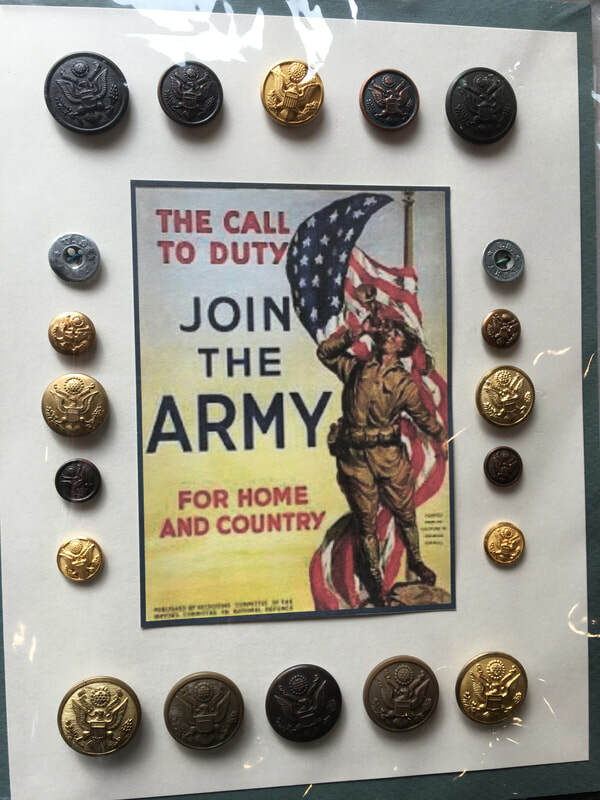 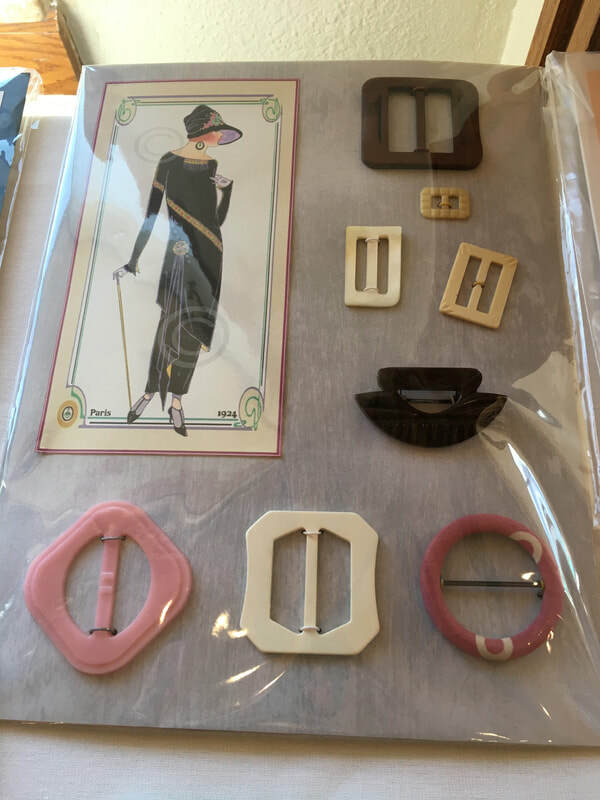 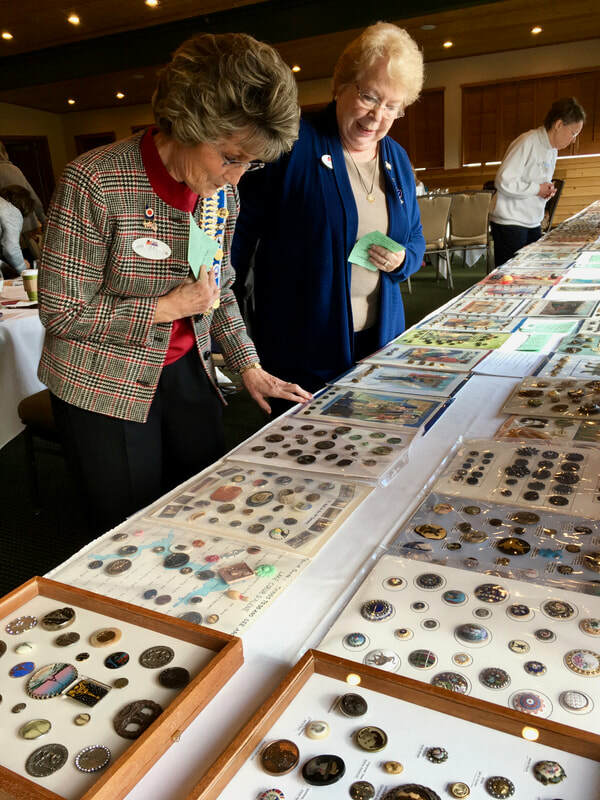 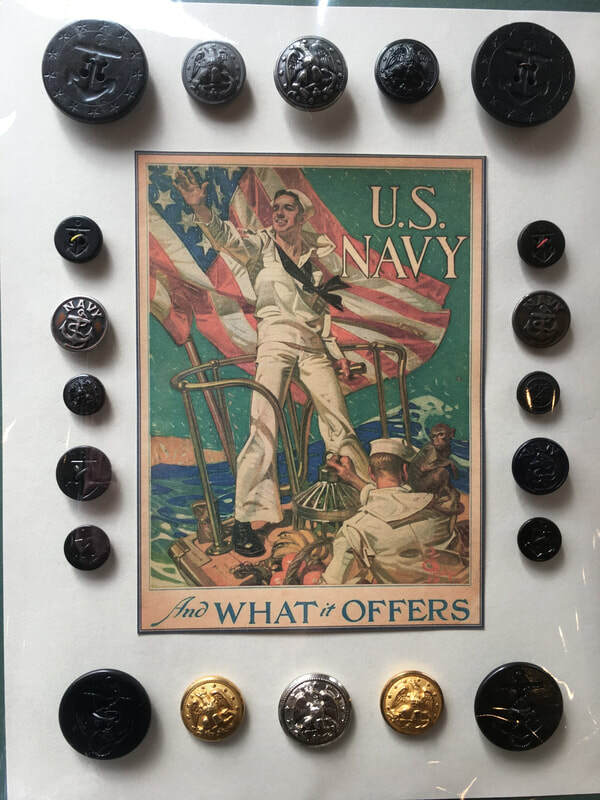 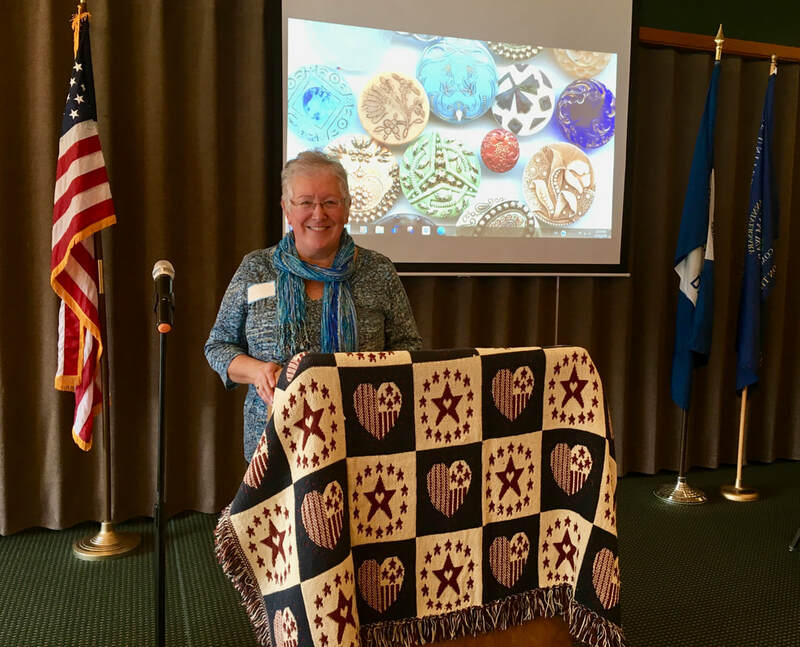 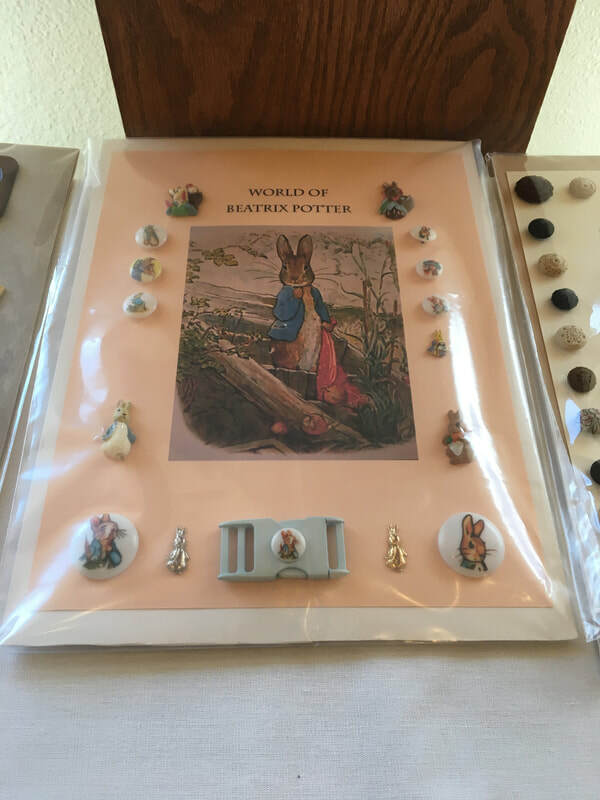 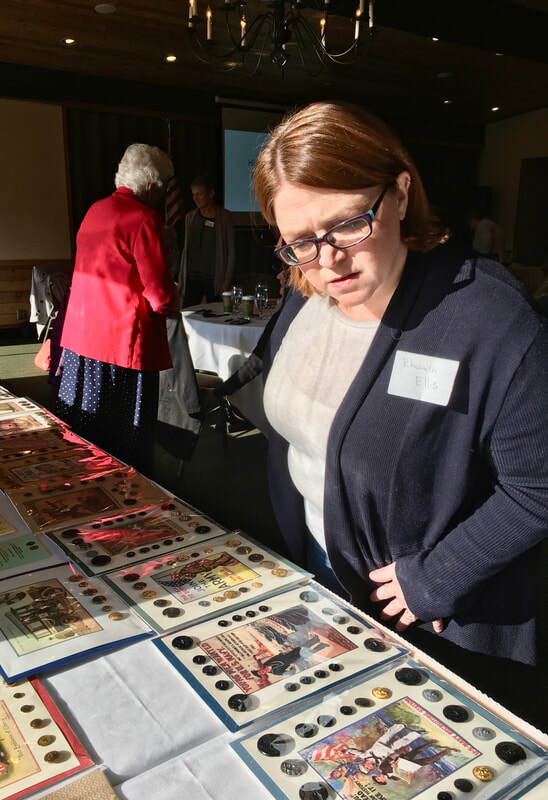 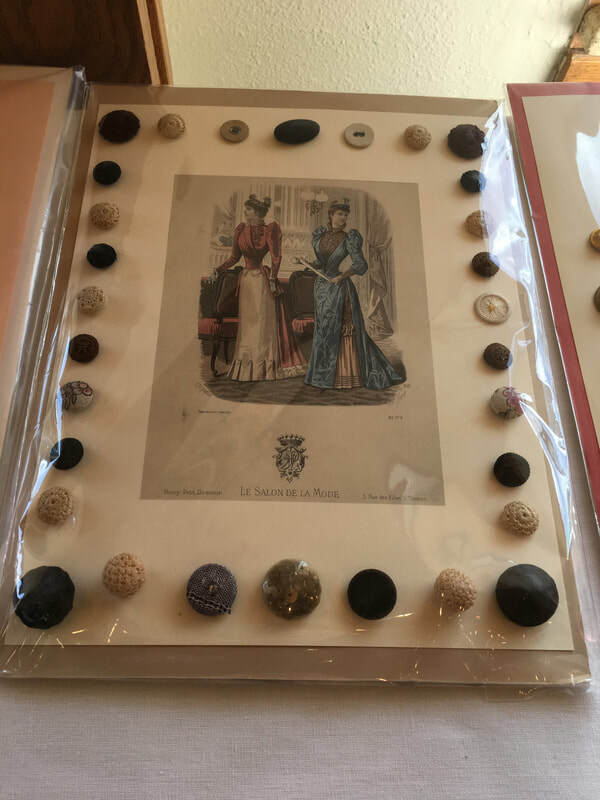 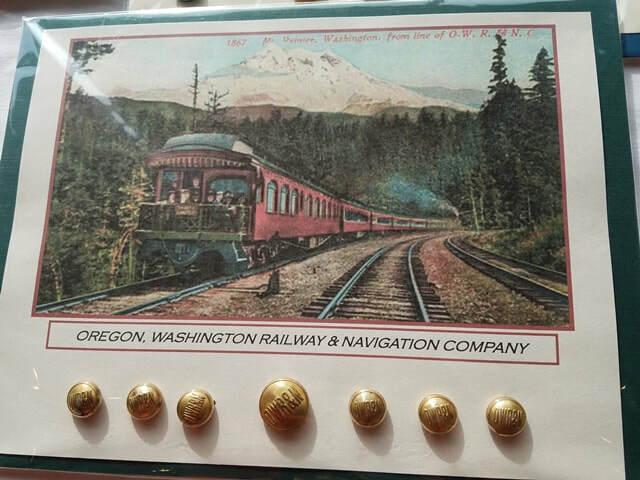 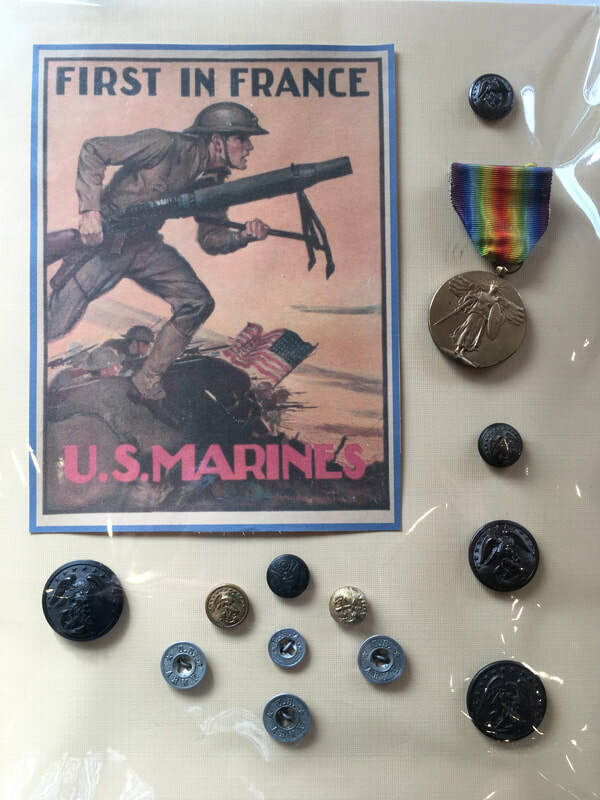 Simone Kincaid from the Idaho State Button Society shared her passion for historical buttons. 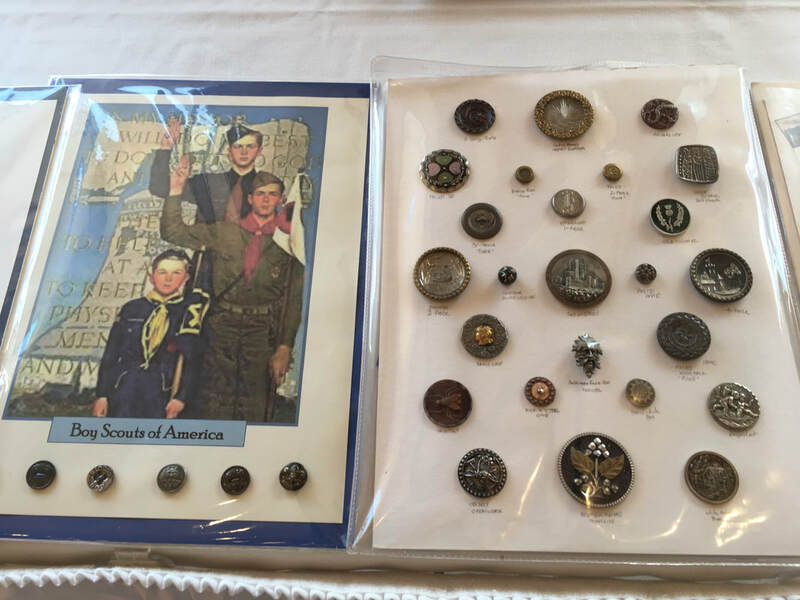 She displayed an extensive collection of buttons and shared how we can learn about culture, history, art and society from a button. 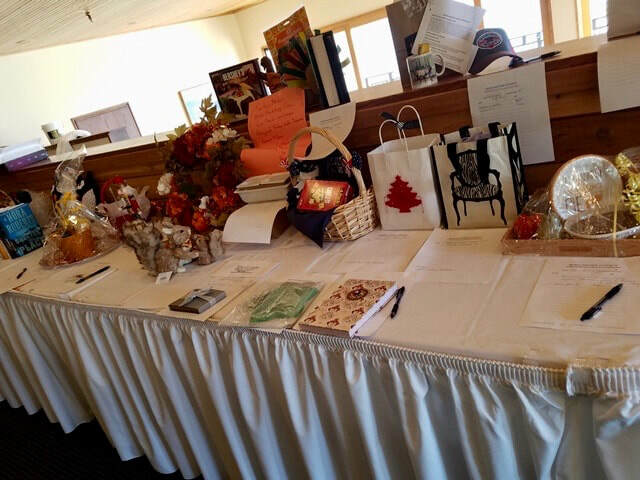 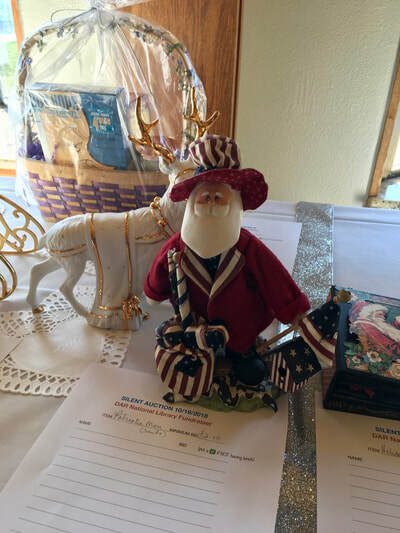 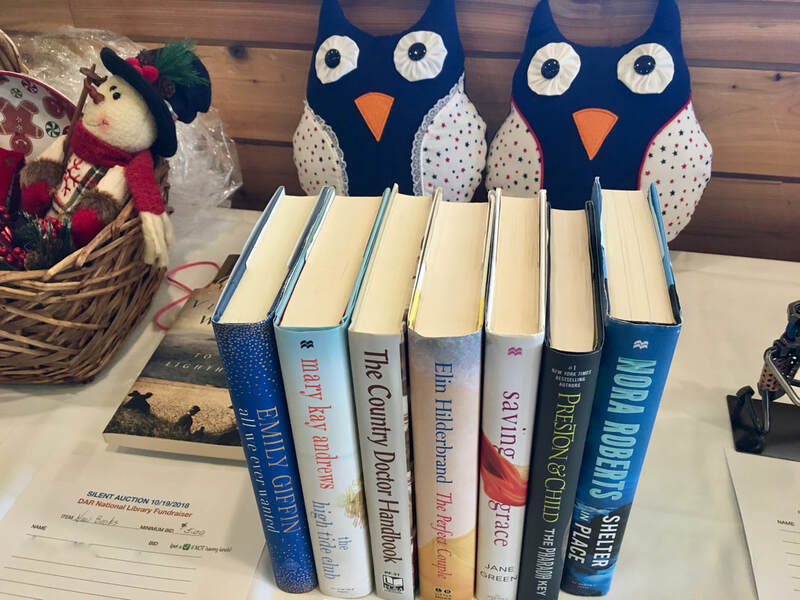 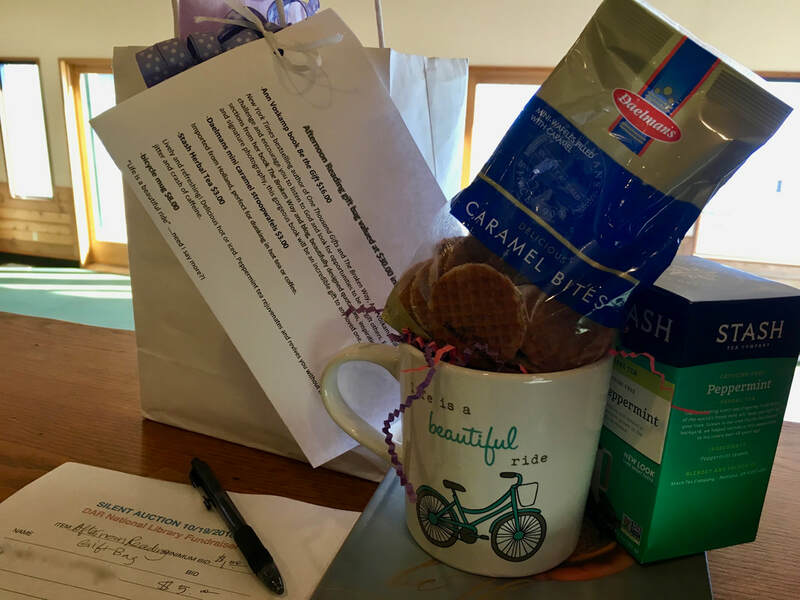 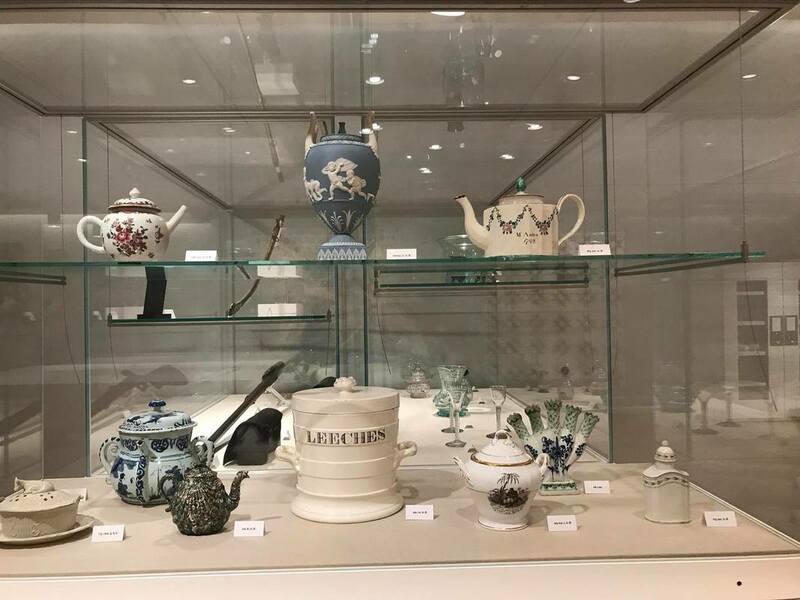 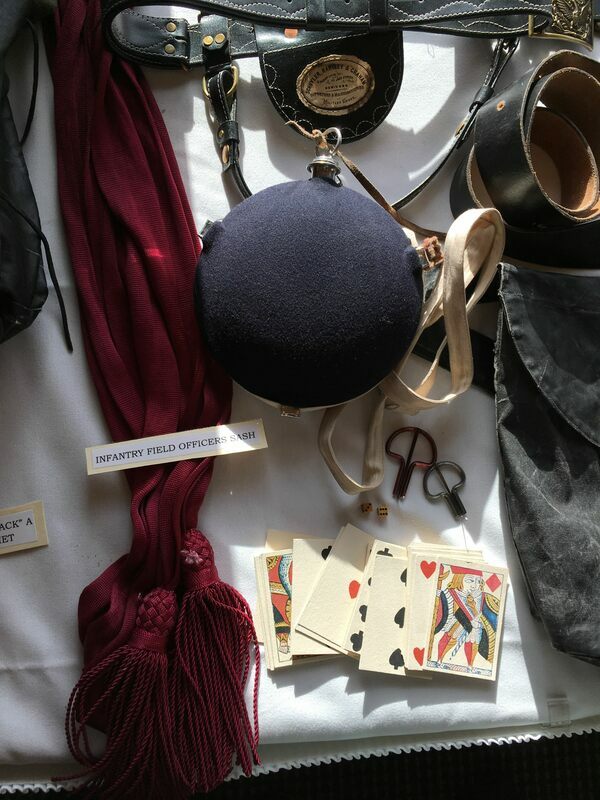 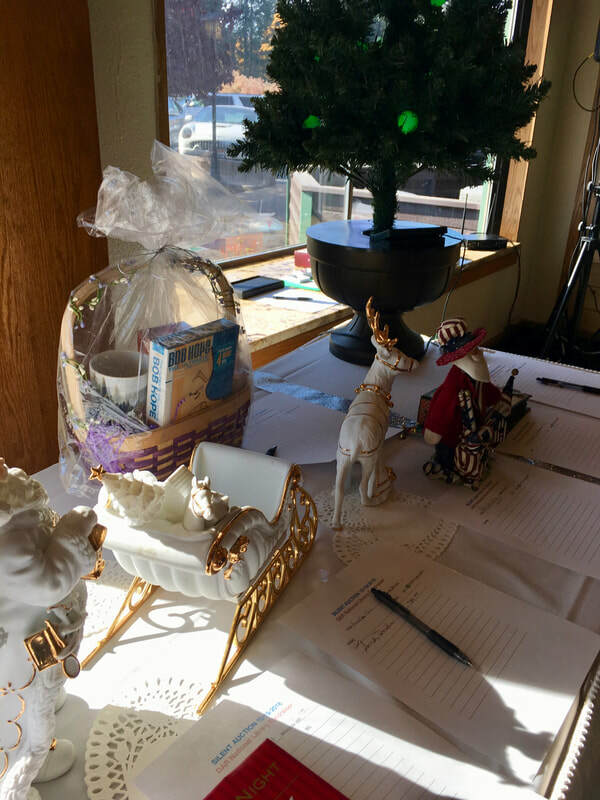 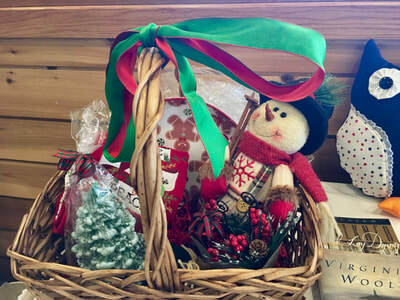 Lt. George Farragut Chapter members brought a wonderful assortment of items for our silent auction hosted by chapter Librarian Kathi J and her team. 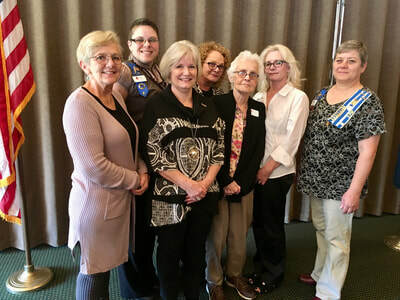 By the end of our meeting we had raised $1,500 for the NSDAR library in Washington, D.C.
We were privileged to witness five new members take the Oath of Membership: Trisha B., Renee E., Linda L., Donna S. and Kathy S. New member Trisha had family from Alice Whitman Chapter join us along with her sister who had the honor of pinning her. 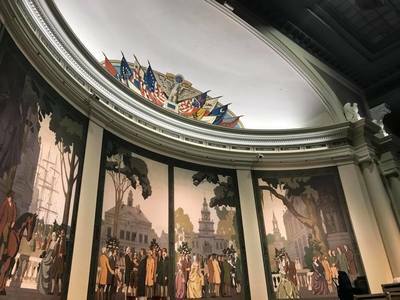 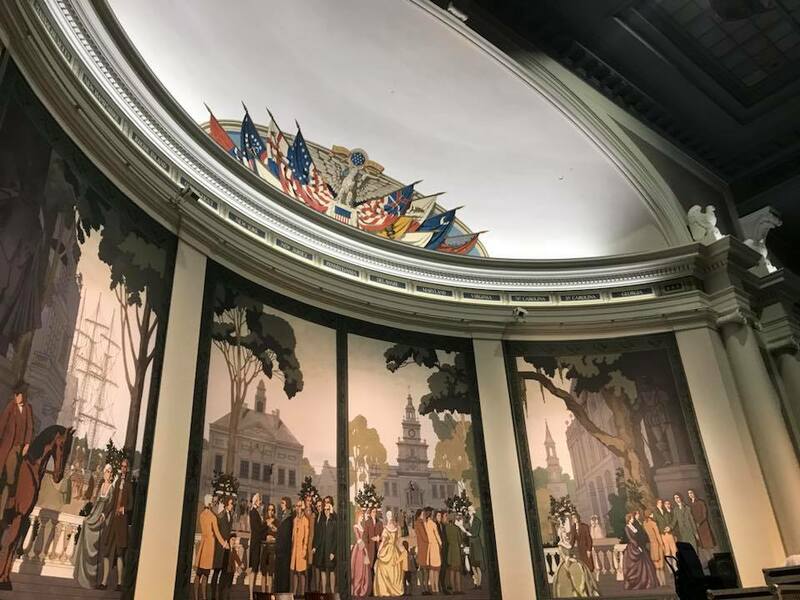 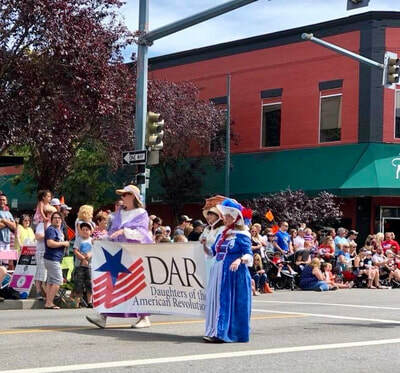 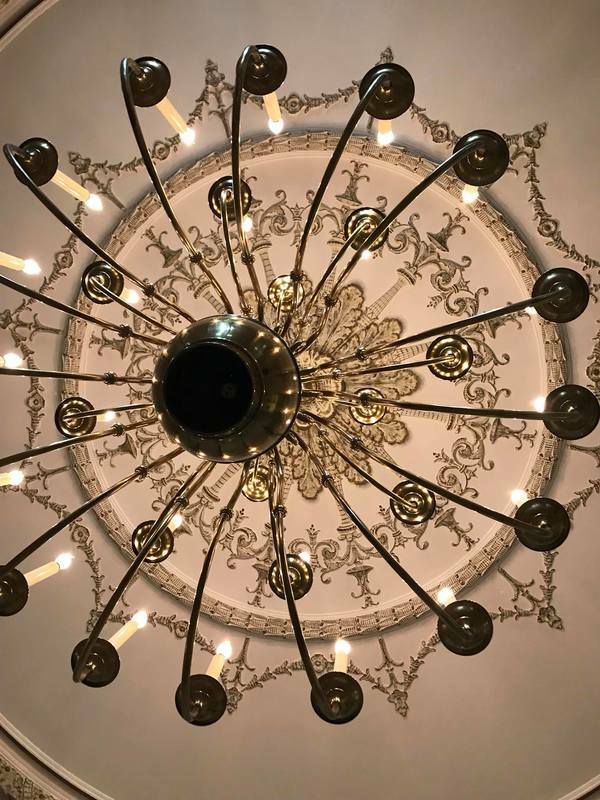 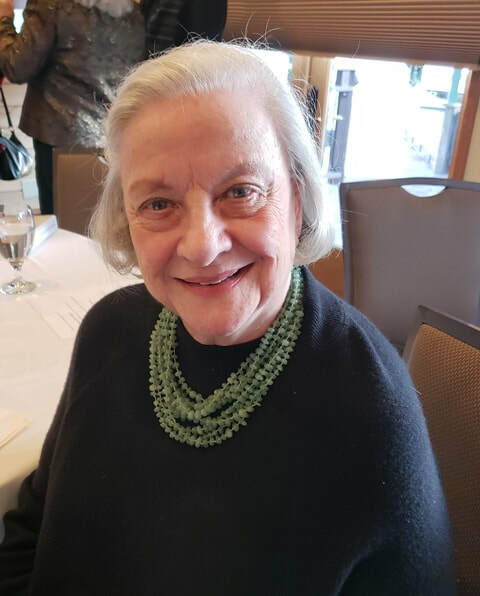 We are fortunate to have a regent and chapter members who are passionate about DAR's objectives of historic preservation, patriotism and education. 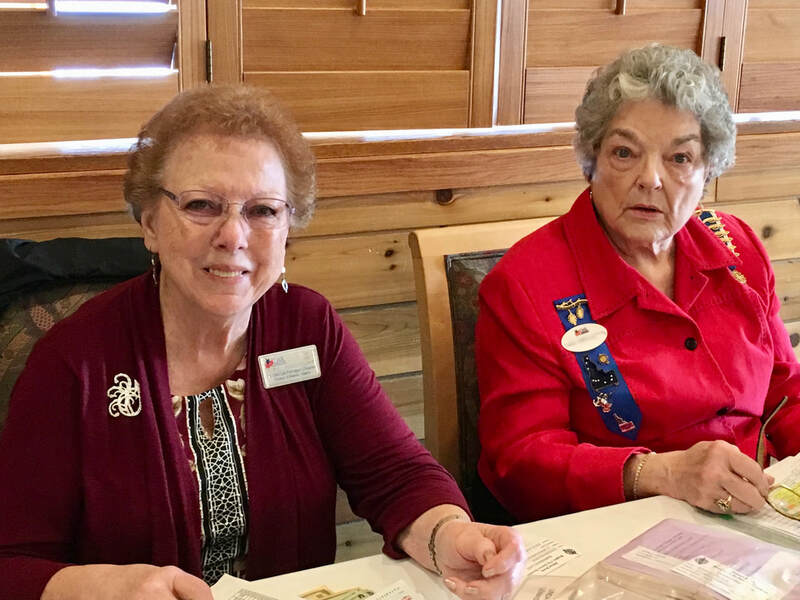 Here are a few of our members sharing news with us. 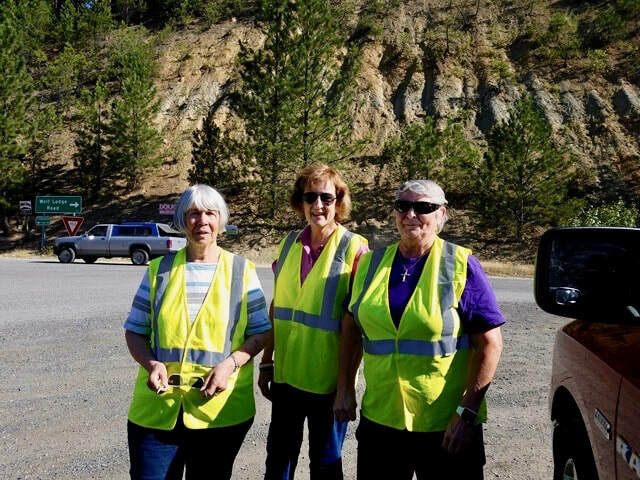 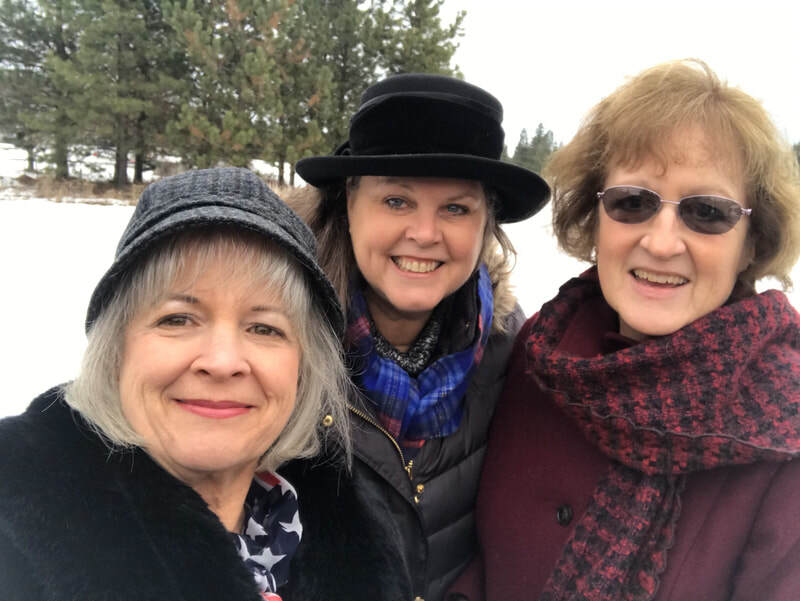 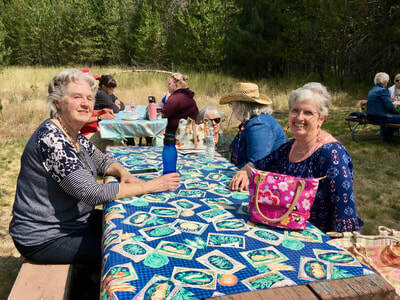 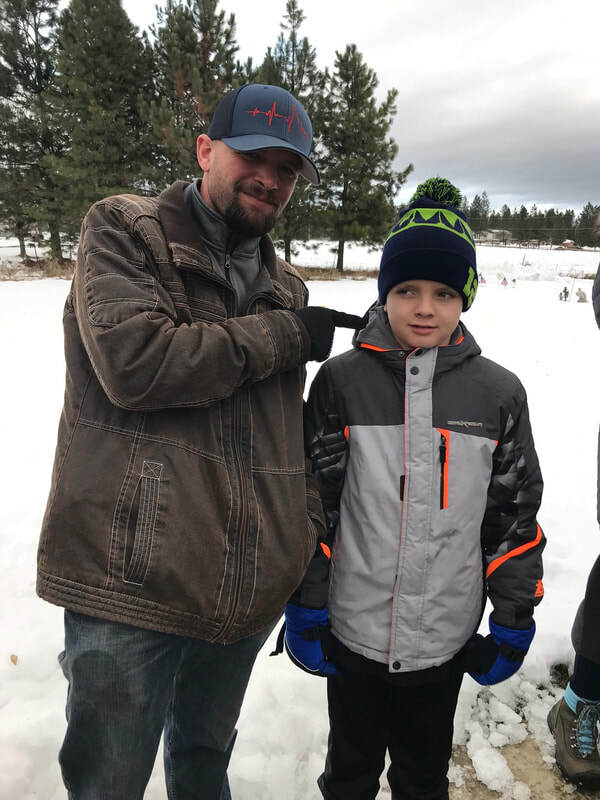 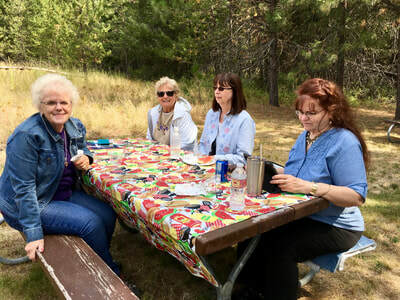 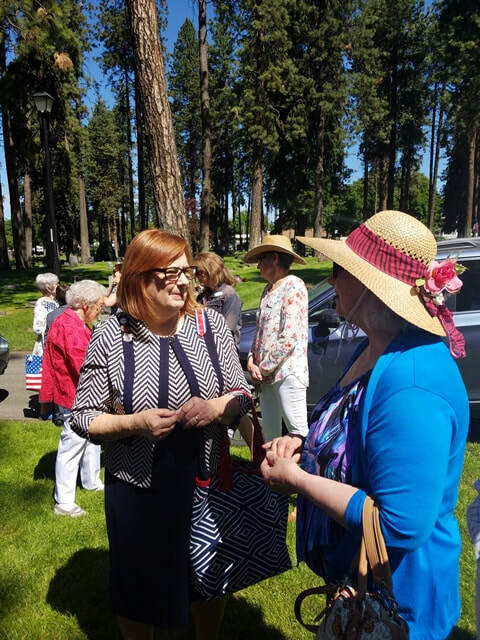 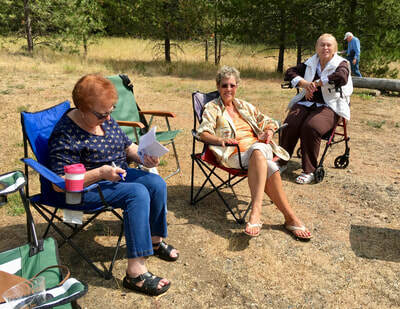 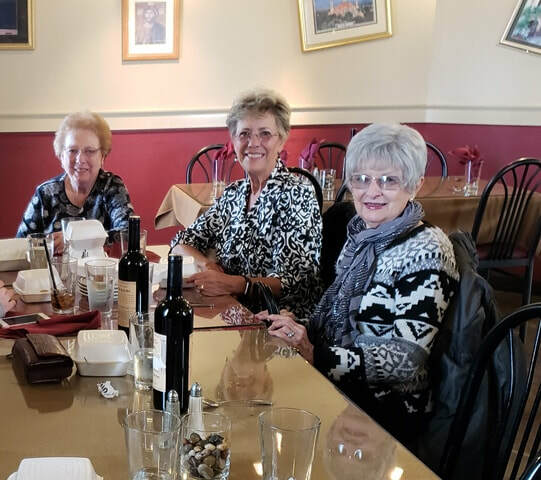 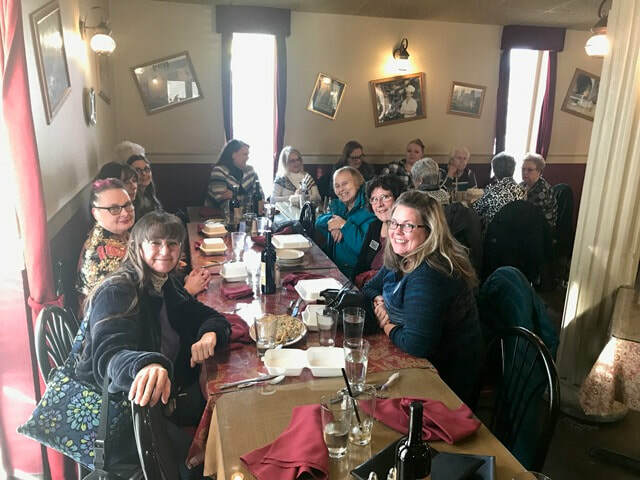 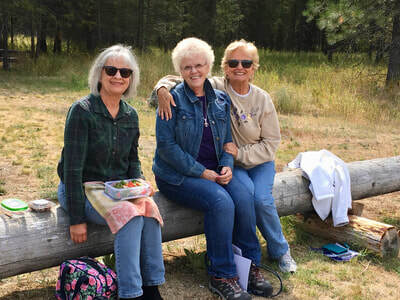 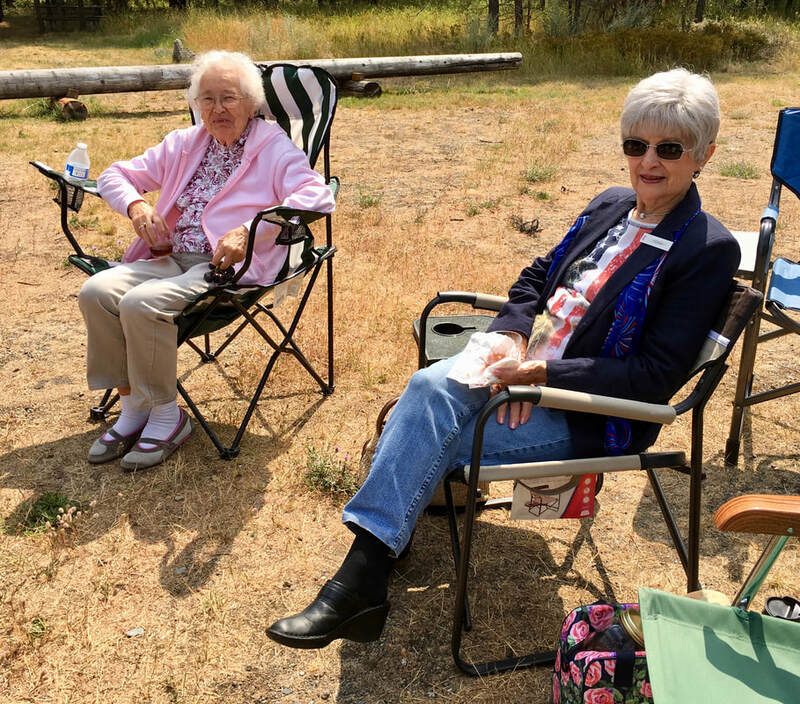 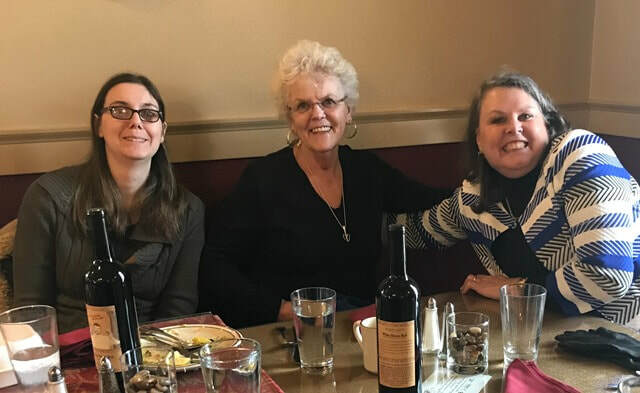 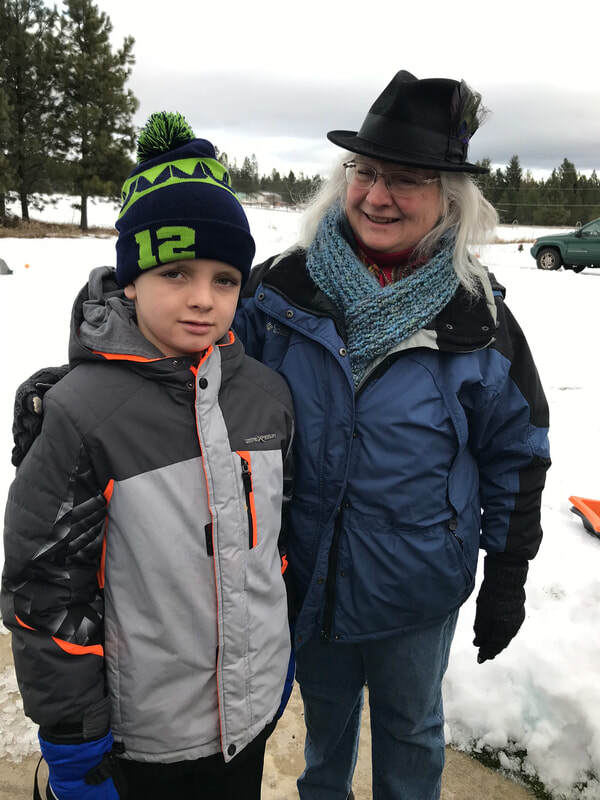 The May Hutton Chapter in Spokane, Washington, invited us to join them for a field trip to Hutton Settlement in Spokane. The Hutton Settlement was established in 1917 by Levi Hutton (widower of May Hutton) to be a "happy home" for children who are orphaned, abandoned or abused. 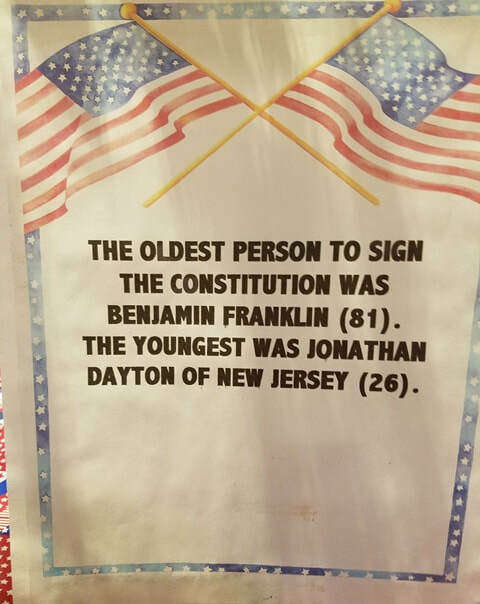 That remains the mission of the facility today. 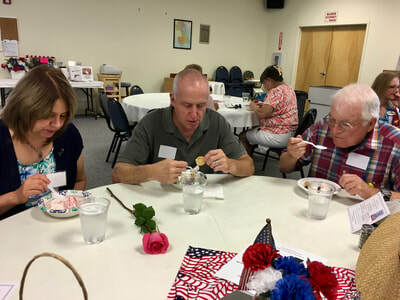 Those attending enjoyed a tour of the facility, an informative program and a potluck brunch. 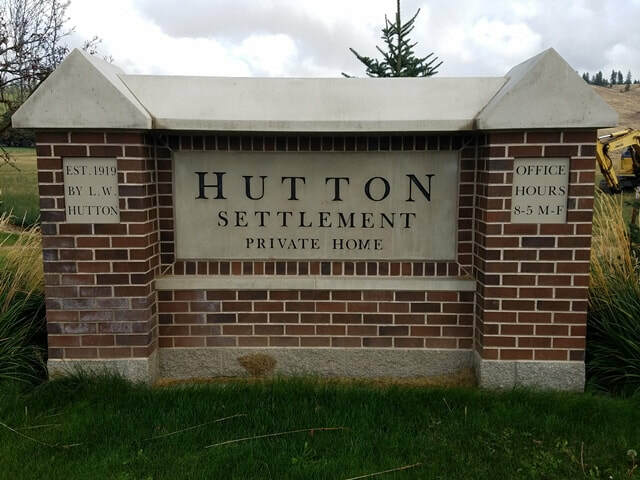 For more information on Hutton Settlement, visit this website. 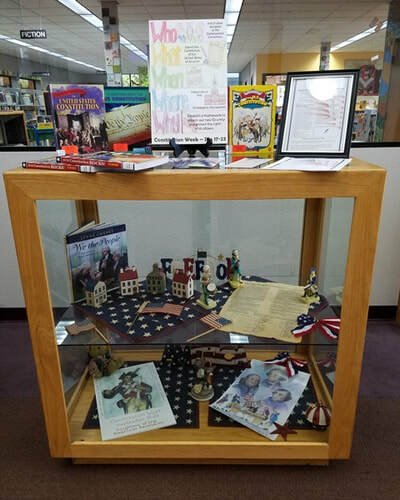 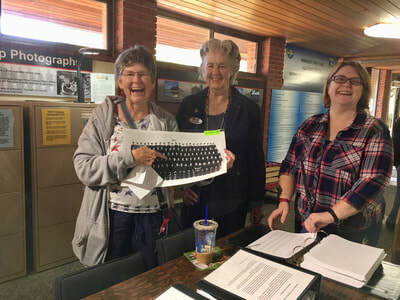 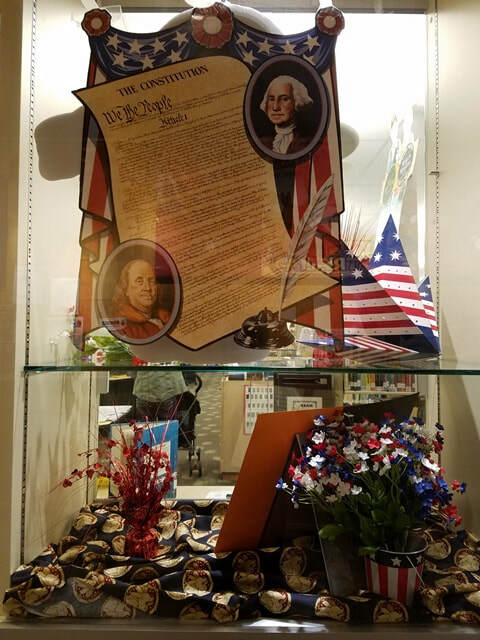 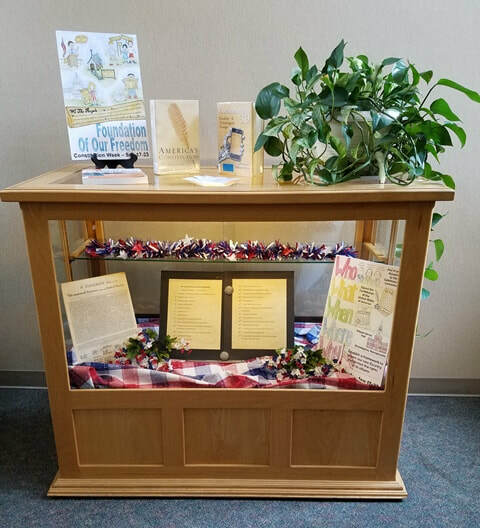 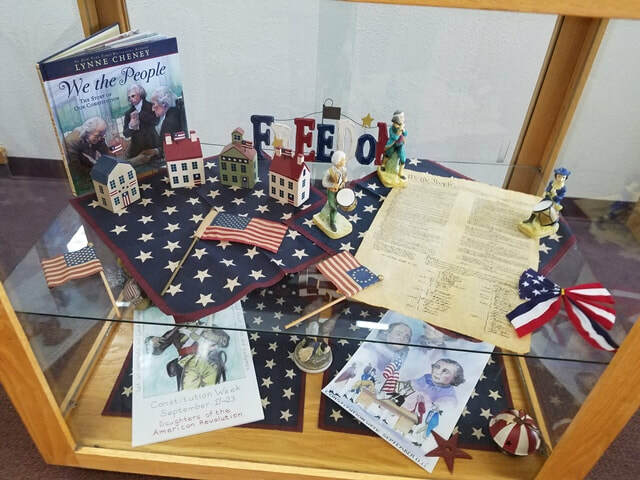 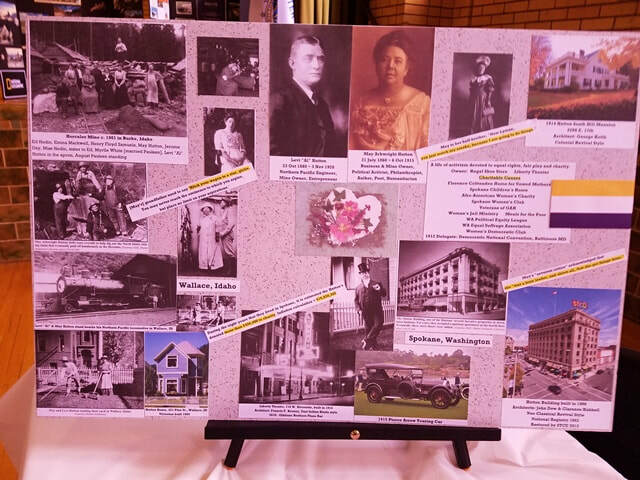 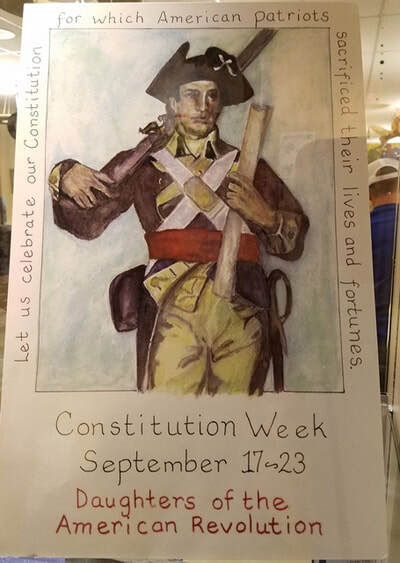 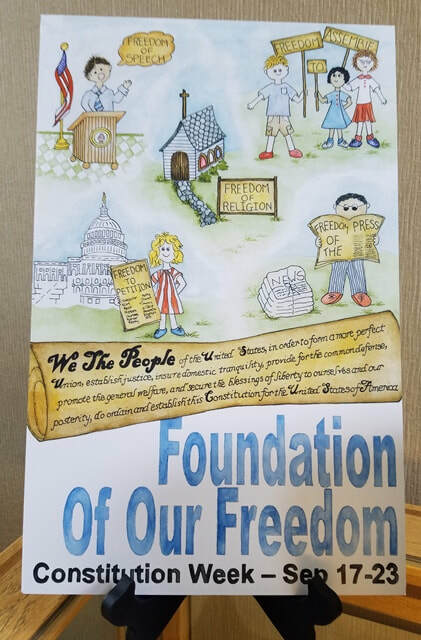 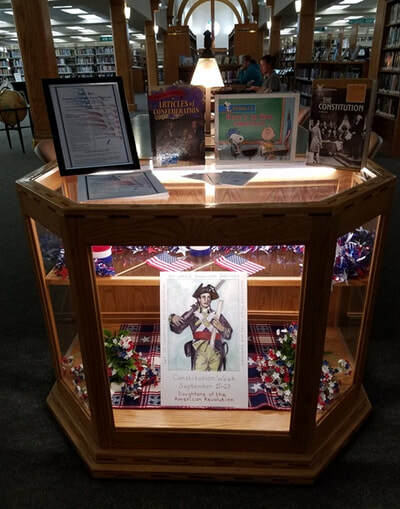 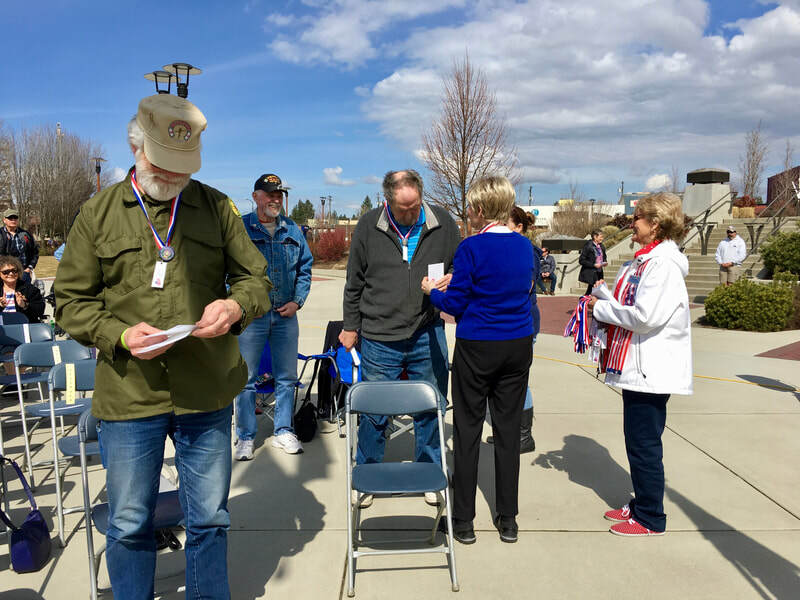 To commemorate Constitution Week, our chapter once again provided displays at three local libraries (Coeur d'Alene, Hayden and Post Falls) and posters at other nearby libraries. 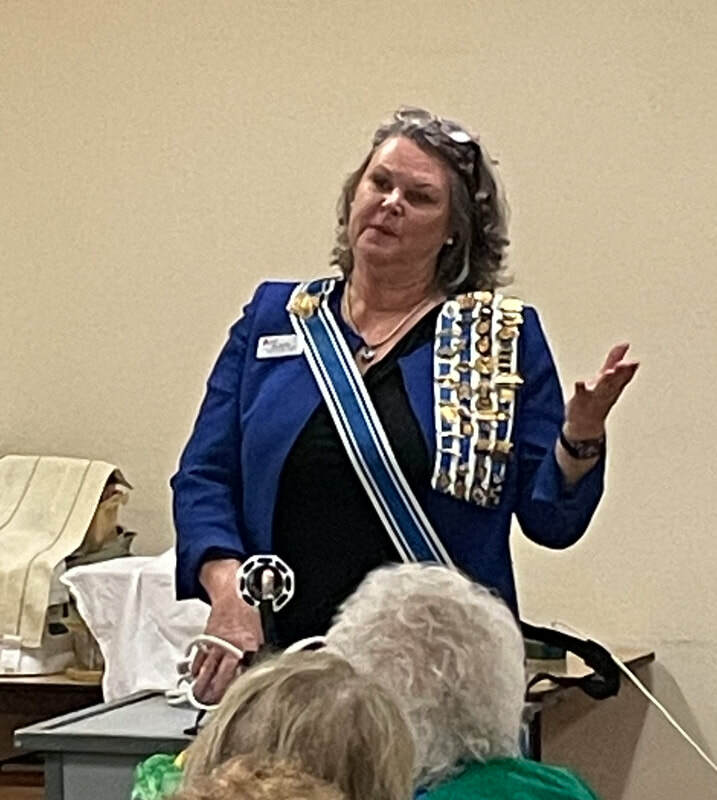 Over 50 ladies turned out for our first meeting of the 2018-2019 DAR year led by Regent Catherine McClintick. 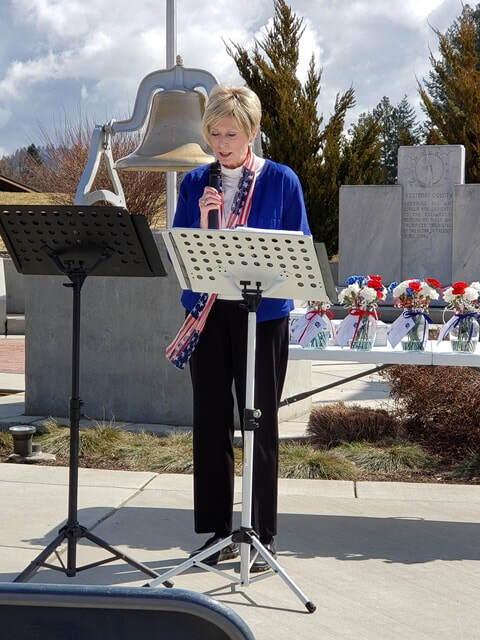 Constitution Week Chairman Cindy Lou led the group in ringing bells to celebrate Constitution Week. 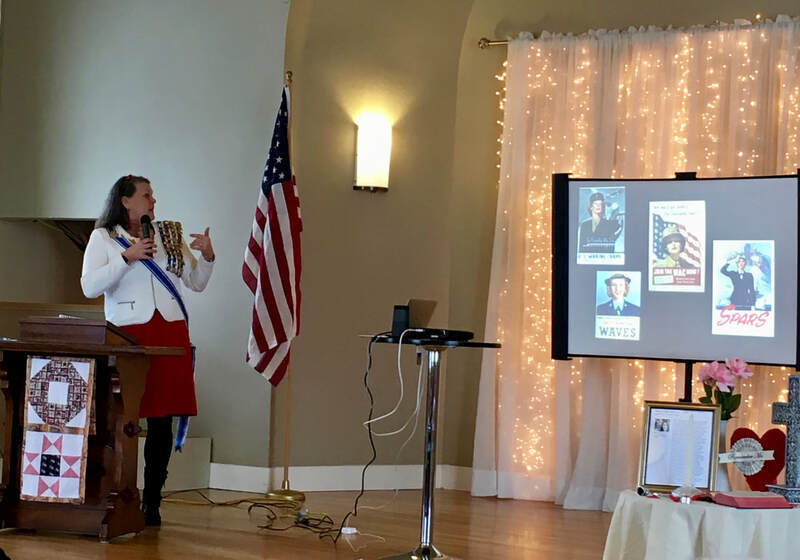 We learned about a project of the Skitswish Society (Children of the American Revolution) to support Ryan's Case for Smiles, a group founded in 2007 to bring comfort and support to young patients and their families in hospitals around the world. 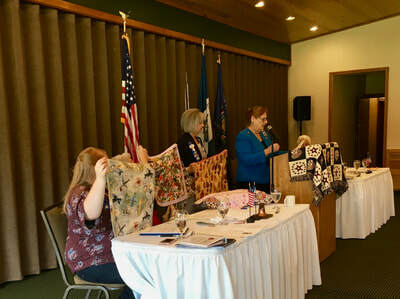 Members were encouraged to get on board by making whimsical pillow cases or donating to the project. 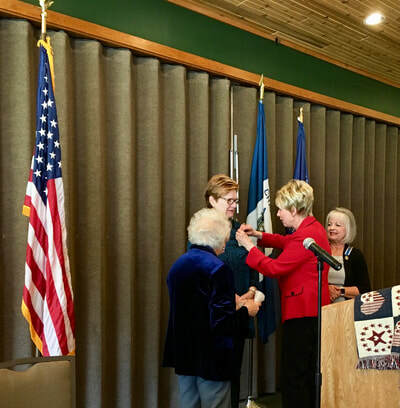 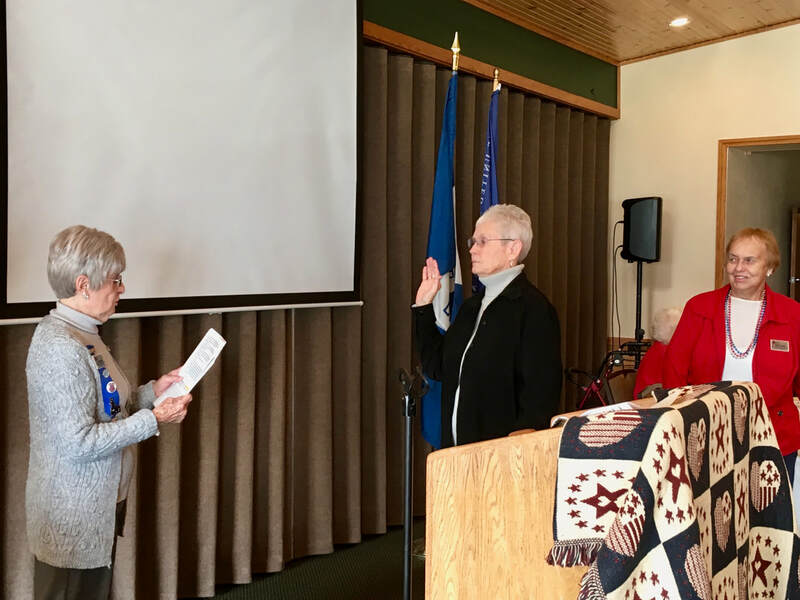 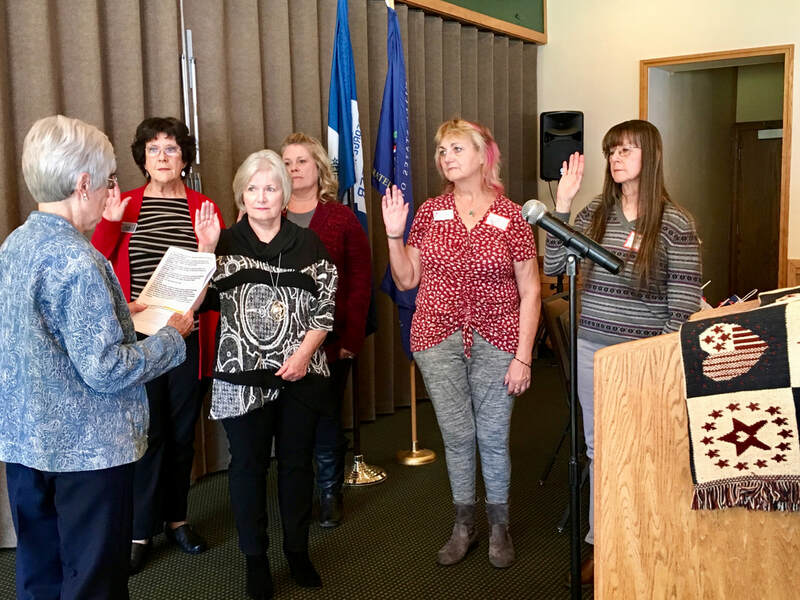 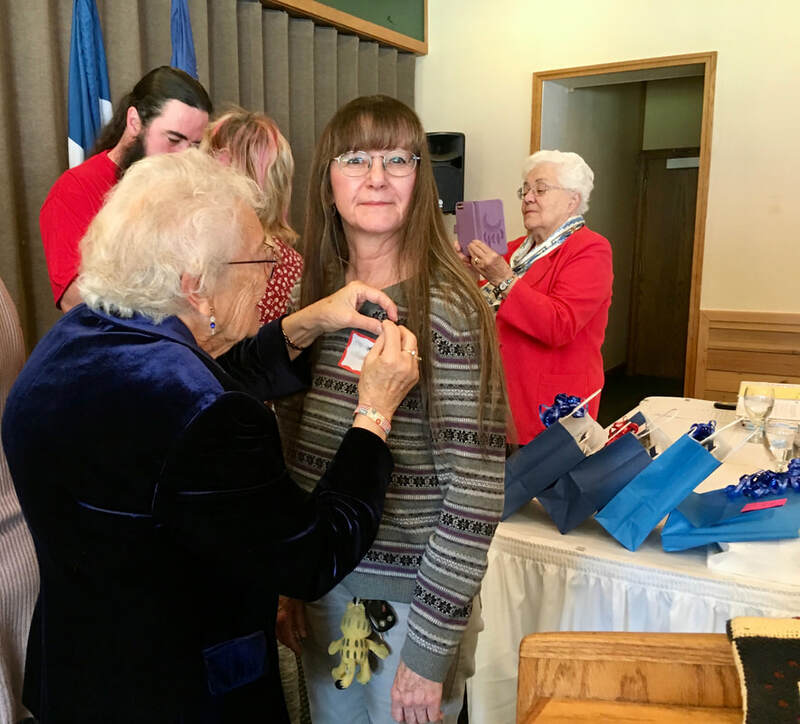 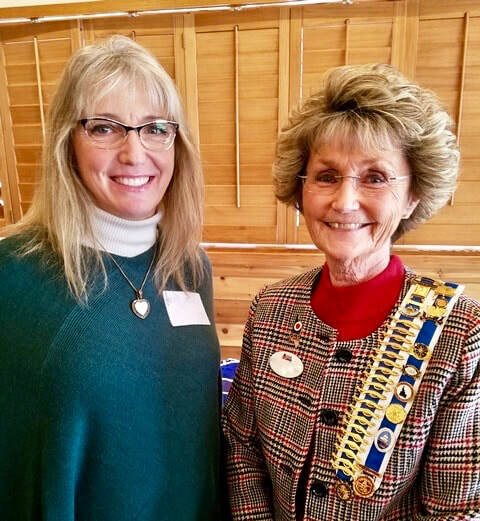 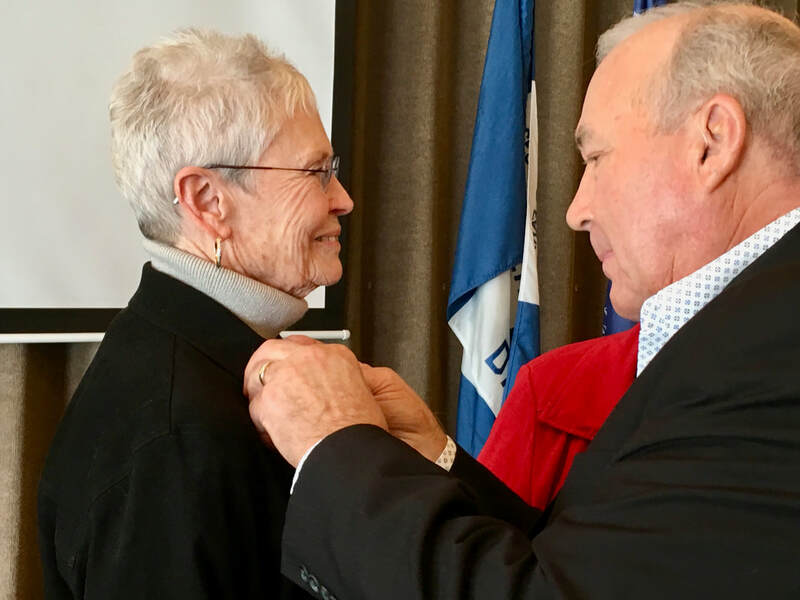 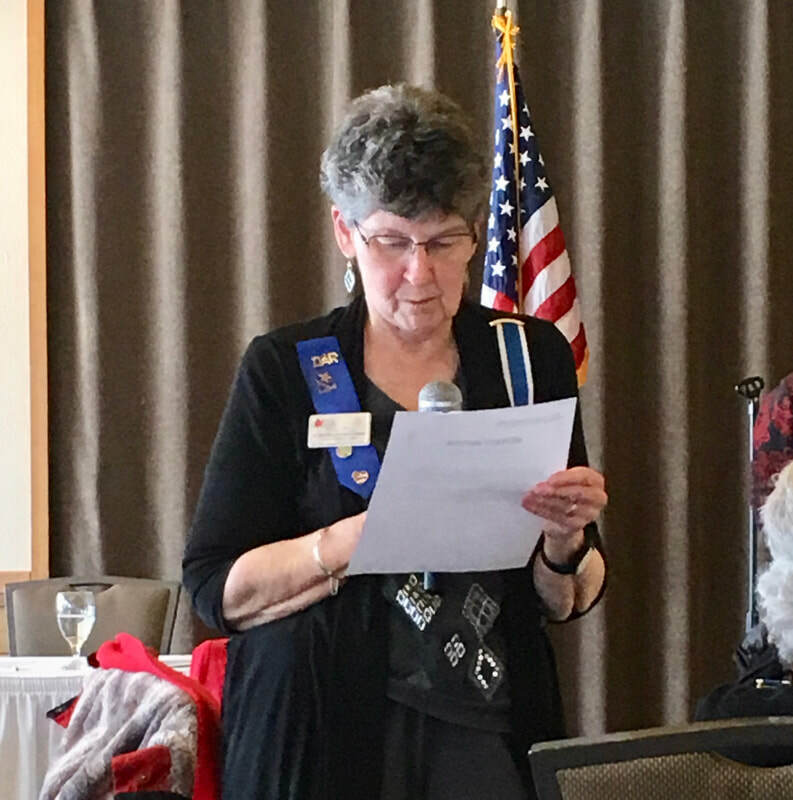 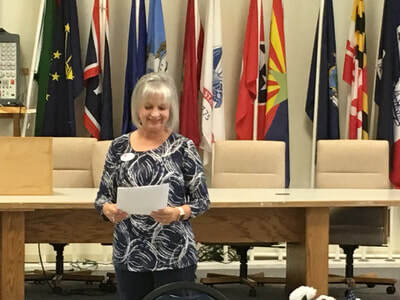 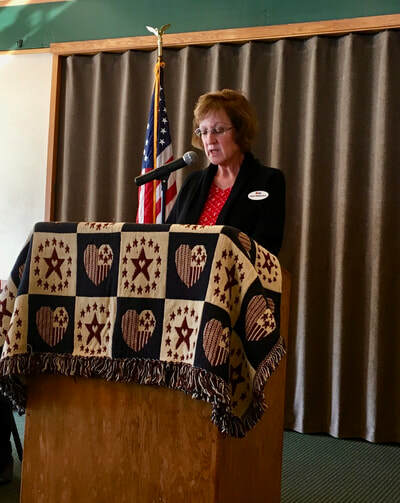 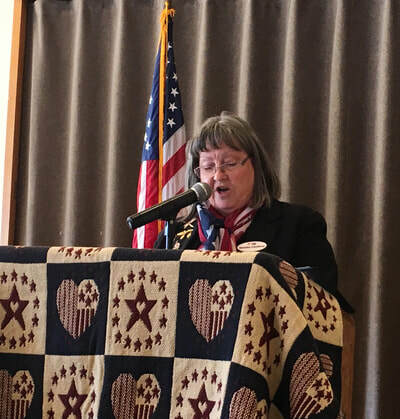 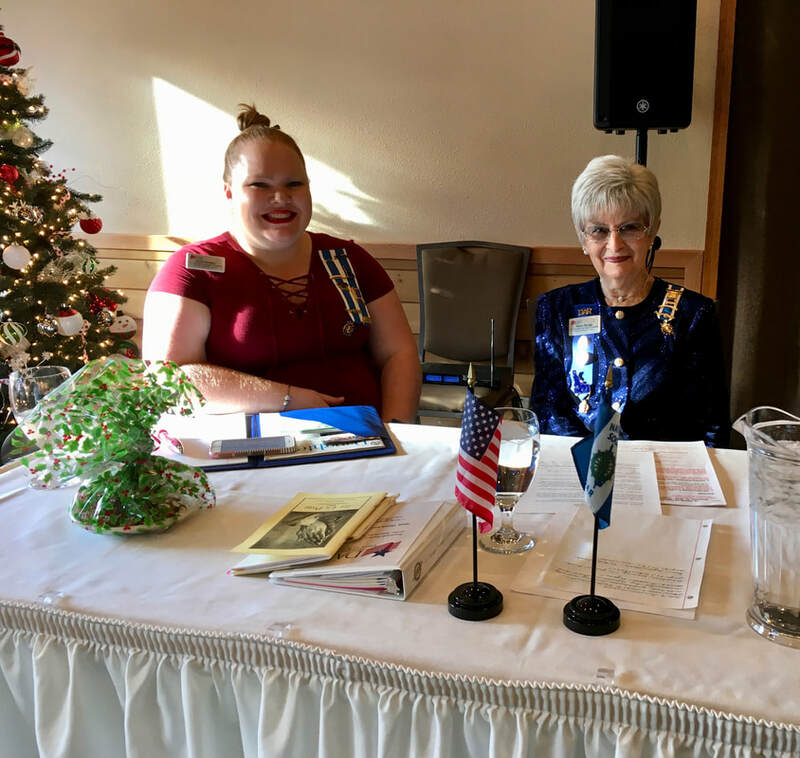 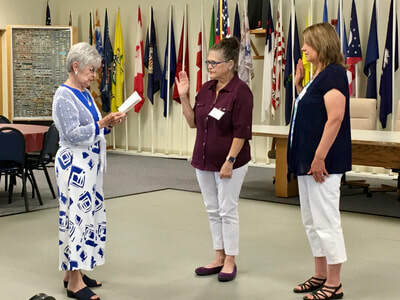 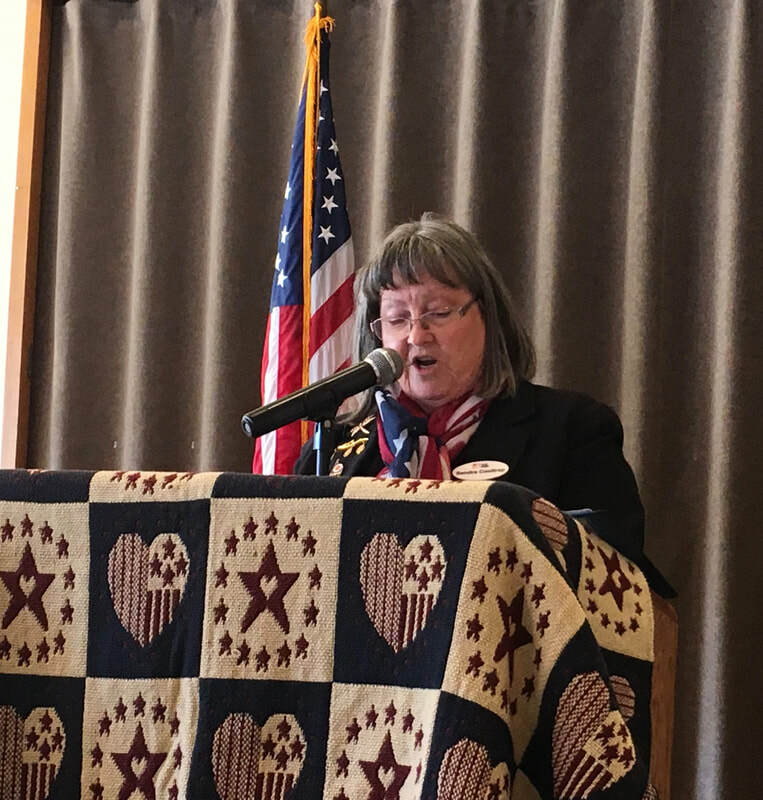 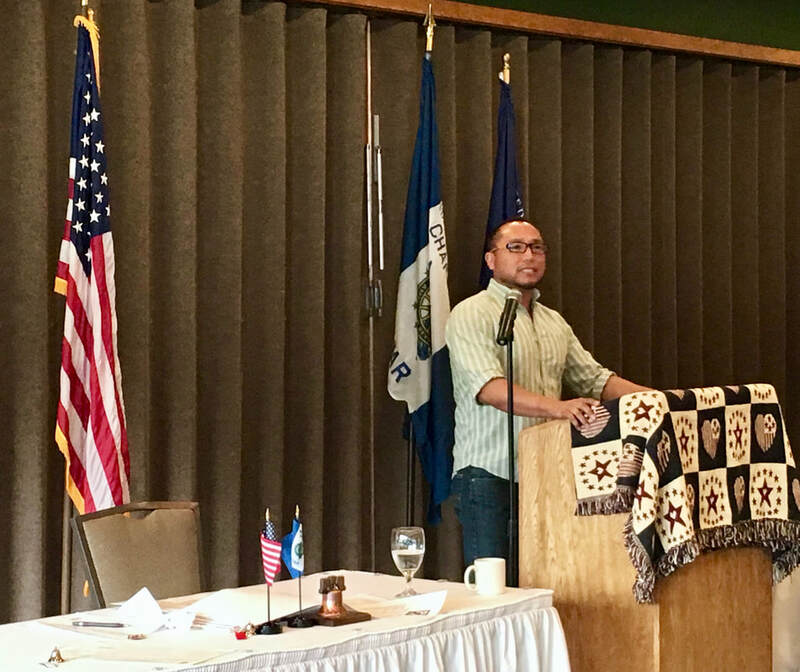 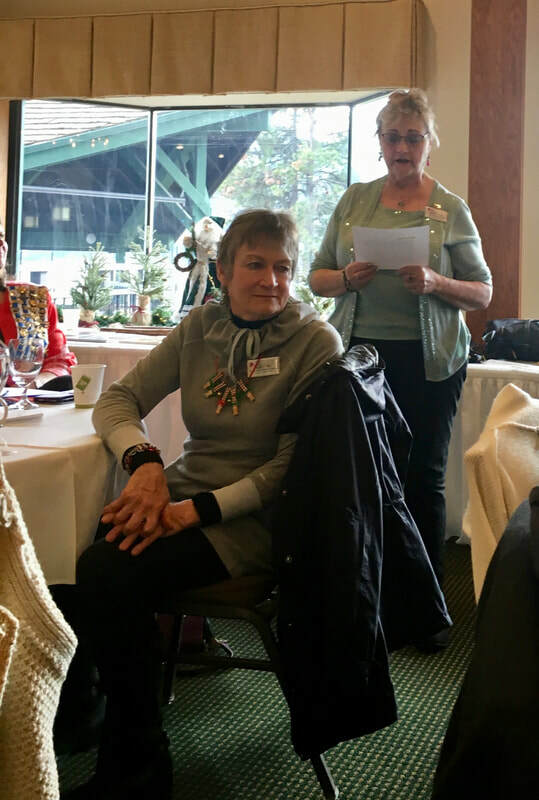 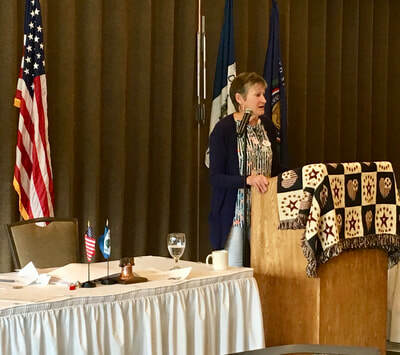 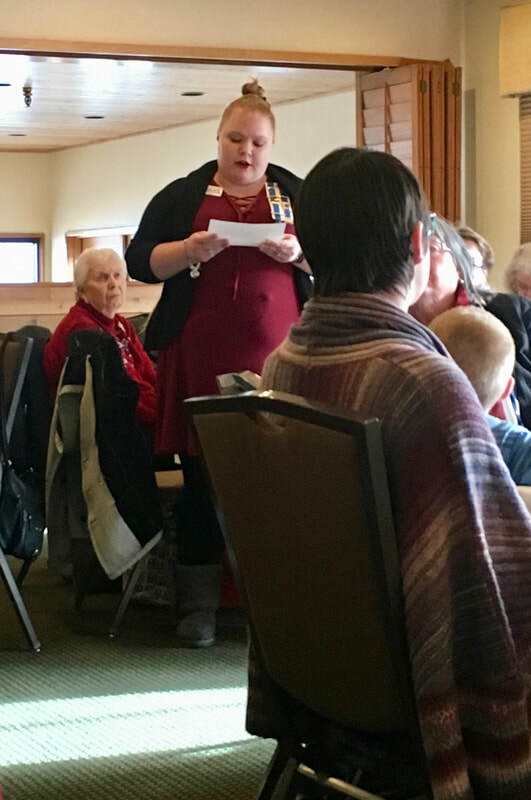 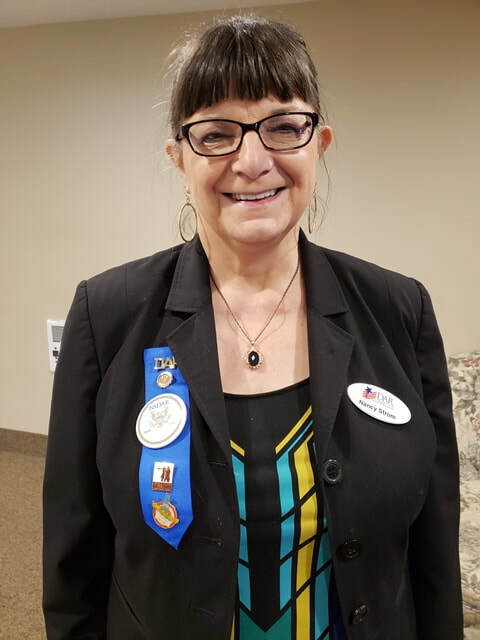 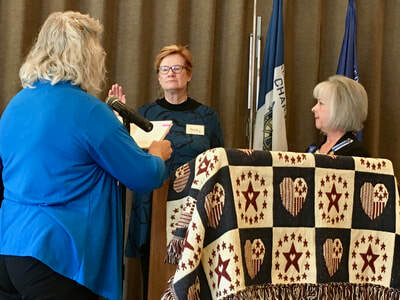 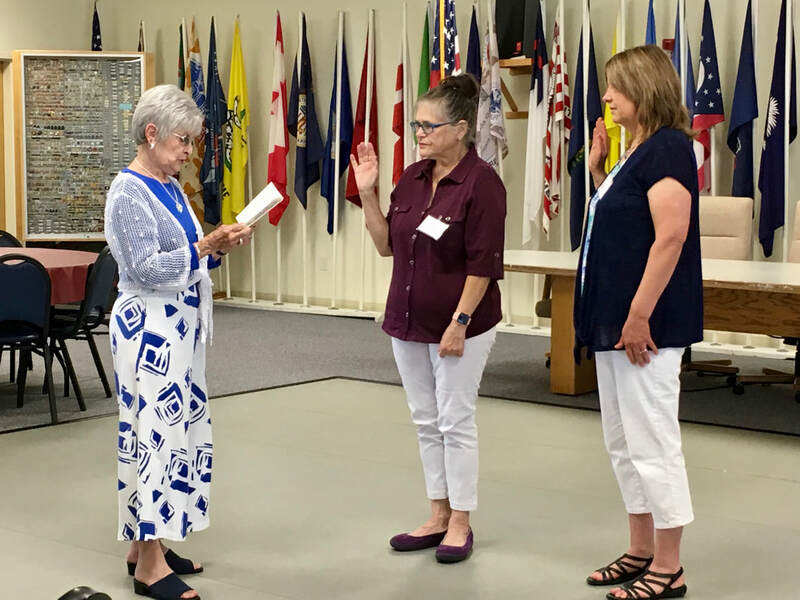 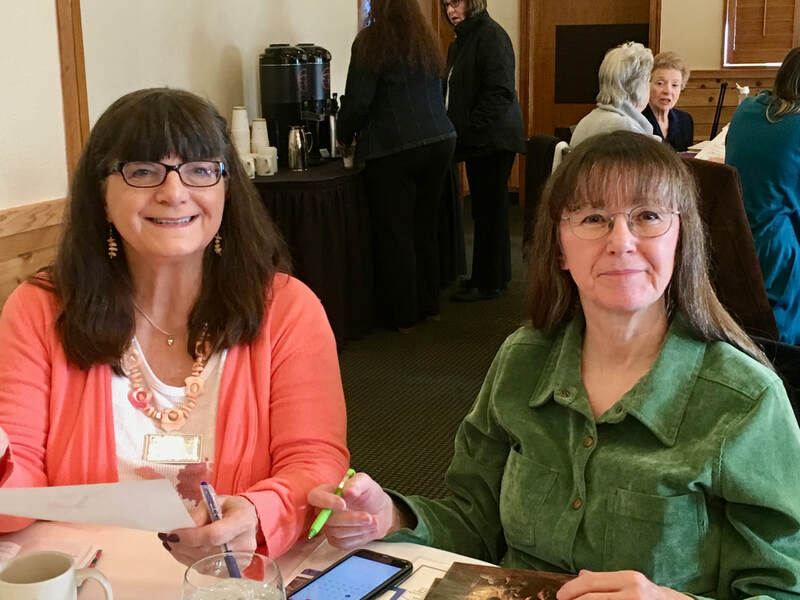 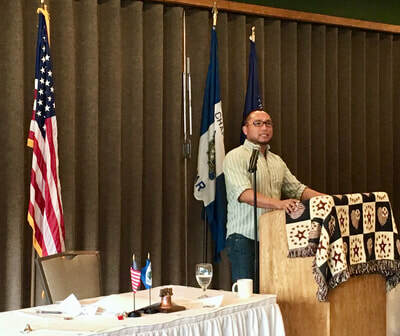 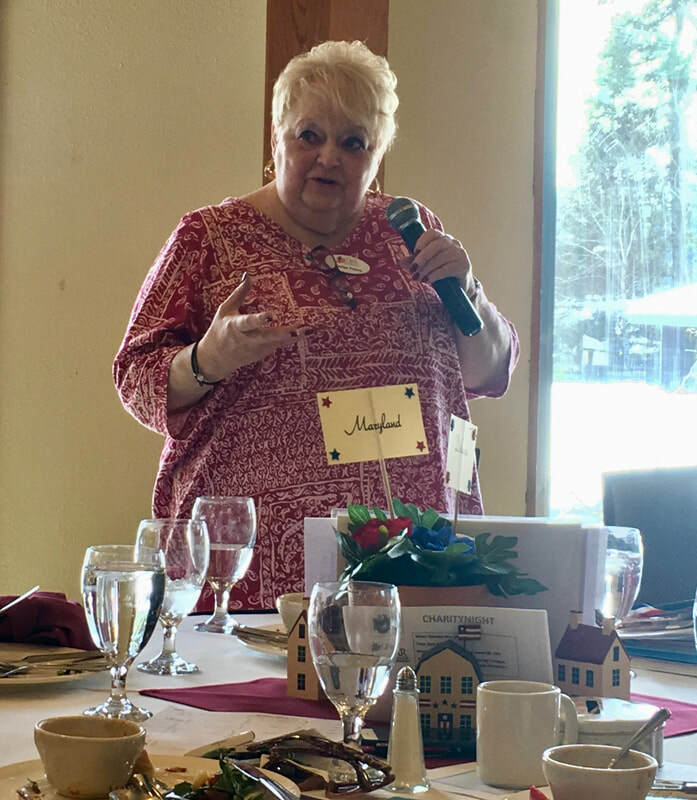 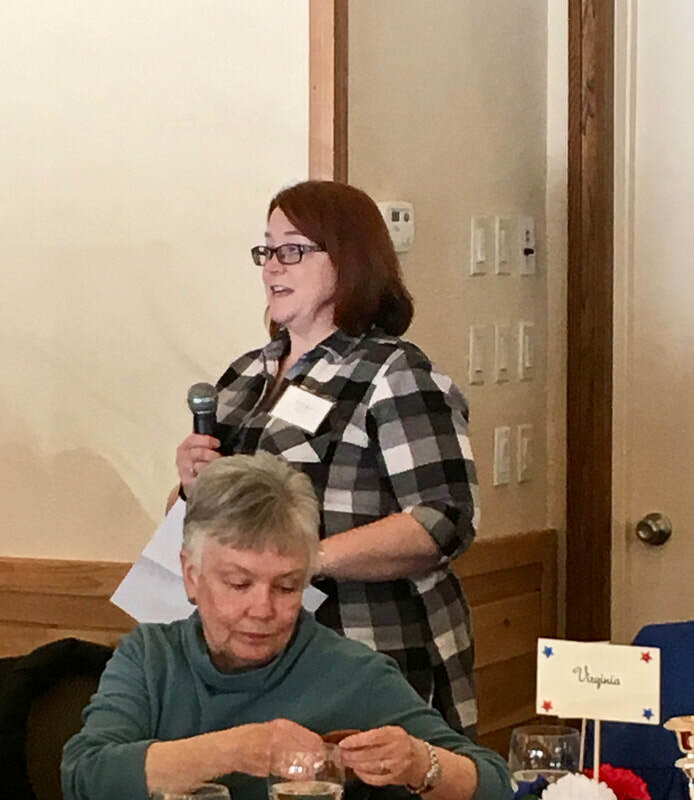 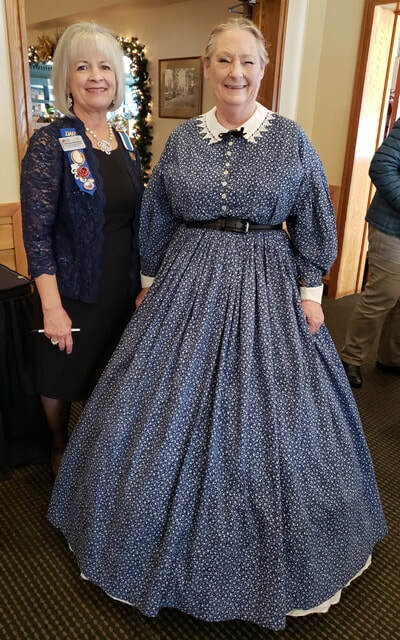 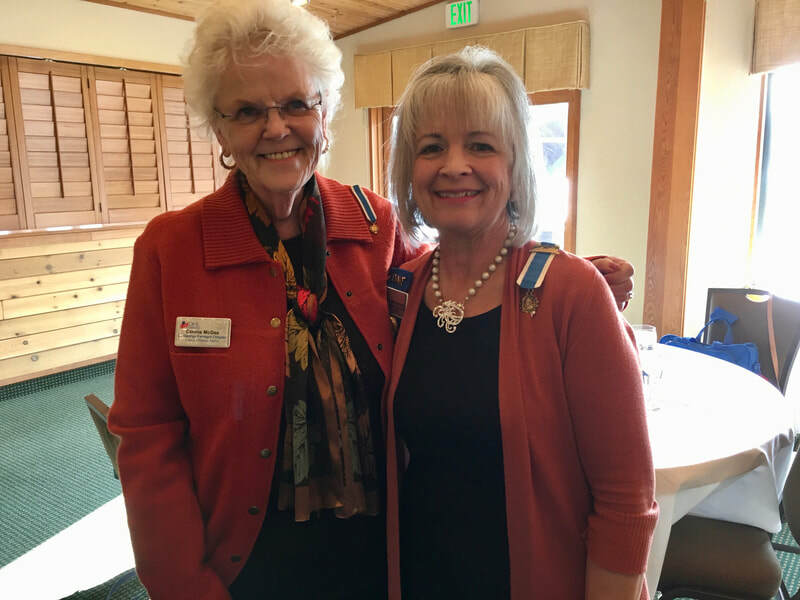 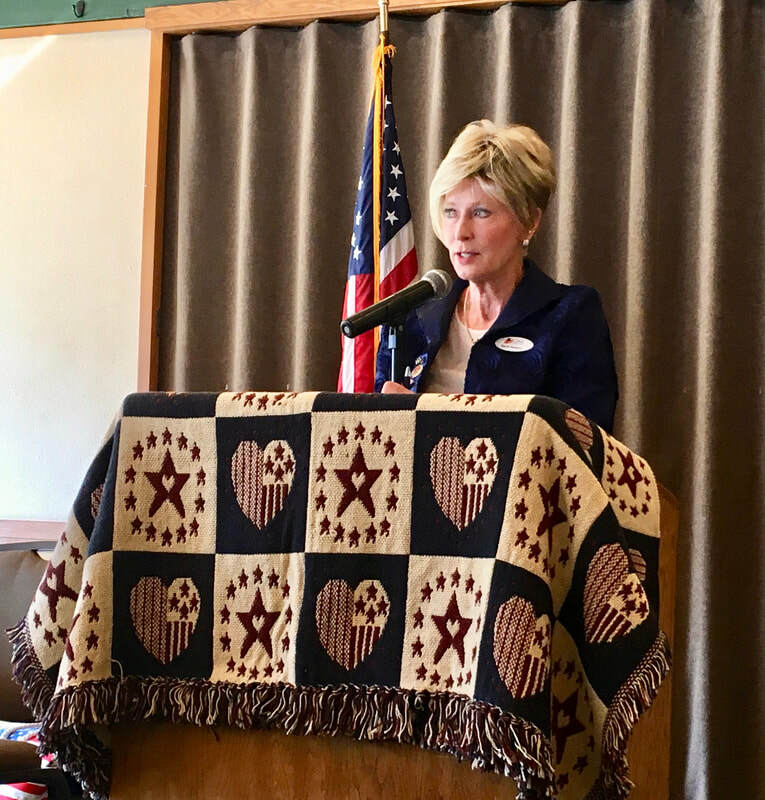 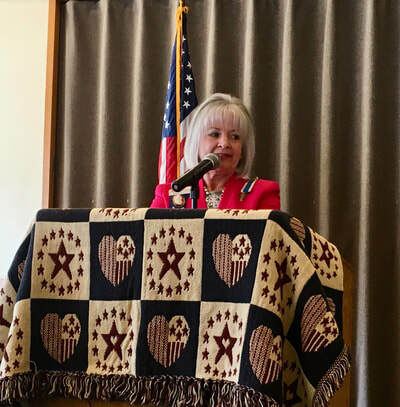 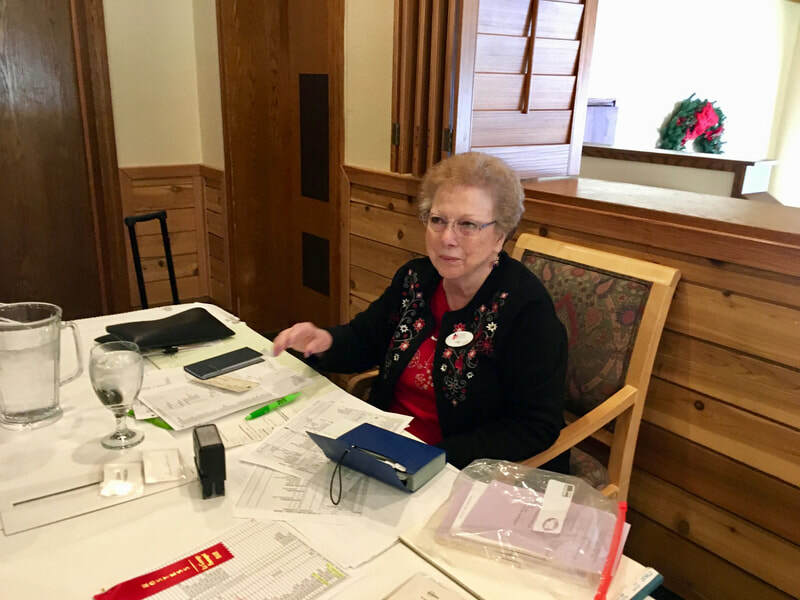 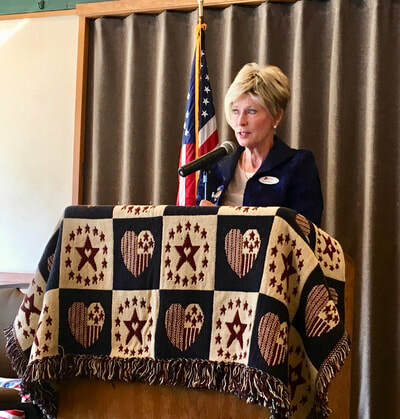 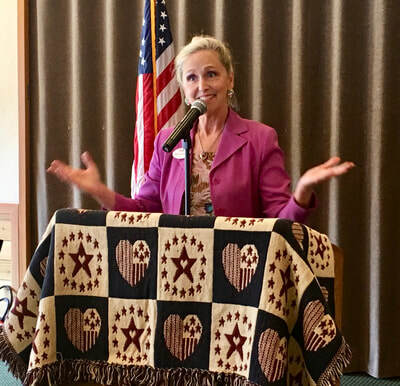 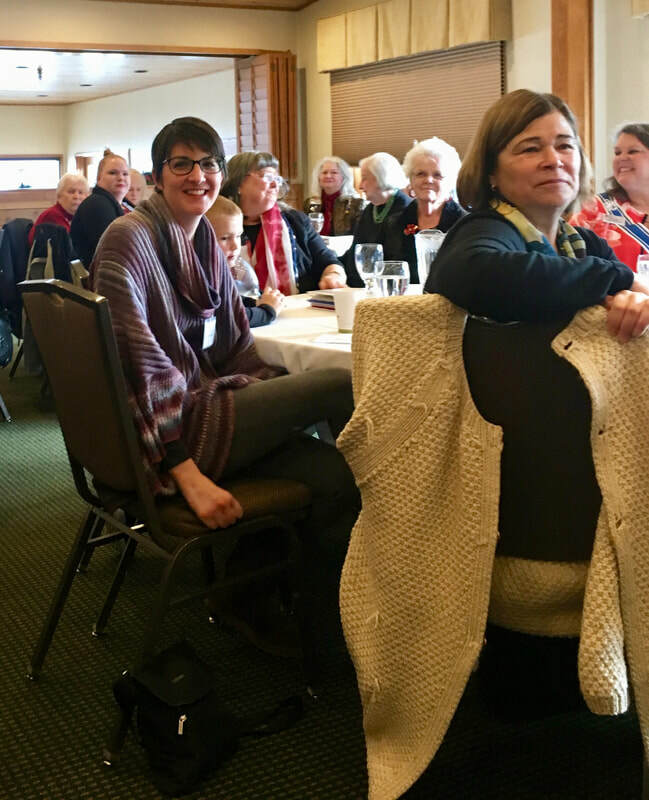 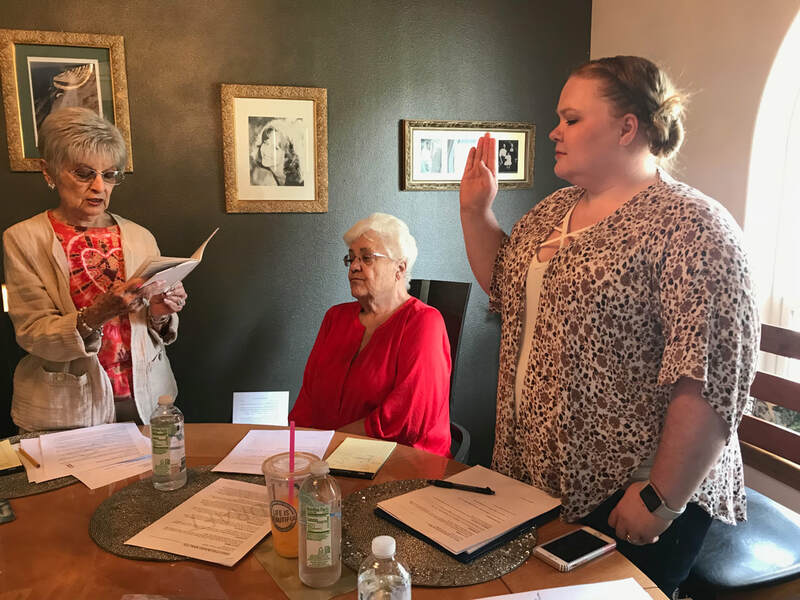 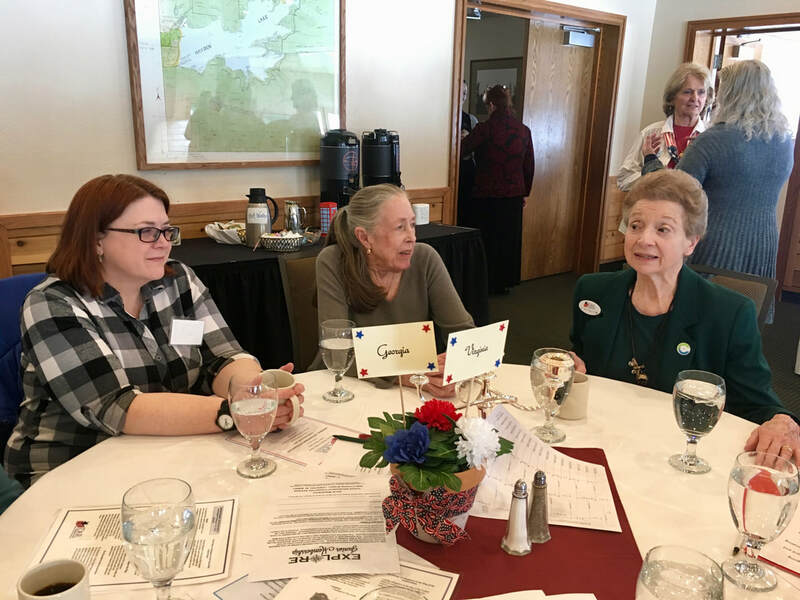 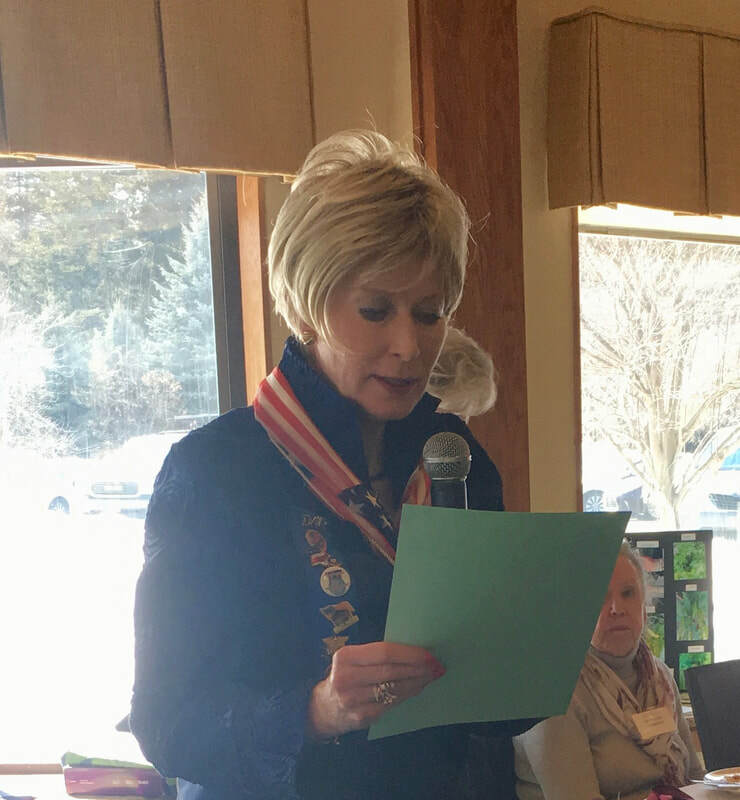 Connie A. took the oath of membership and was pinned by Barb N. Kim B, chapter member and also representing Post Falls Museum, introduced Quanah Matheson, Cultural Affairs Director for the Coeur d'Alene Casino, who gave an inspiring talk that wove history of our area with the present. 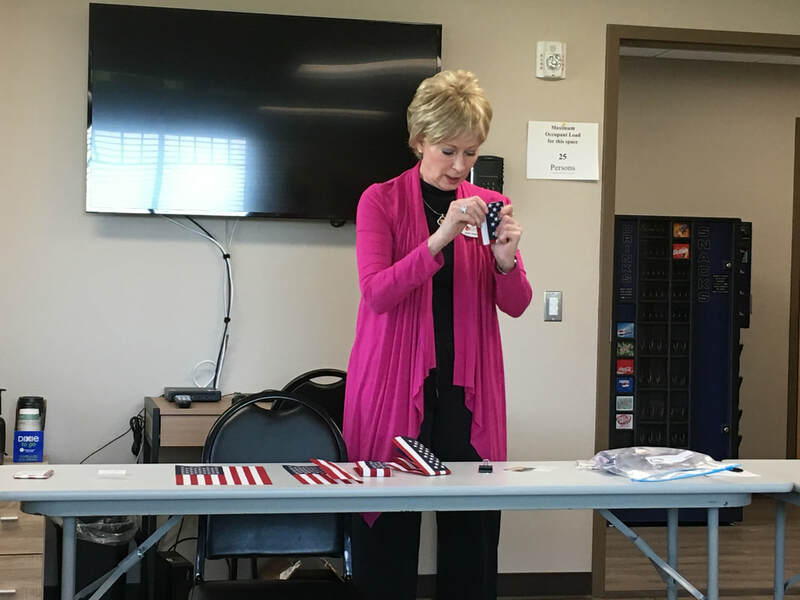 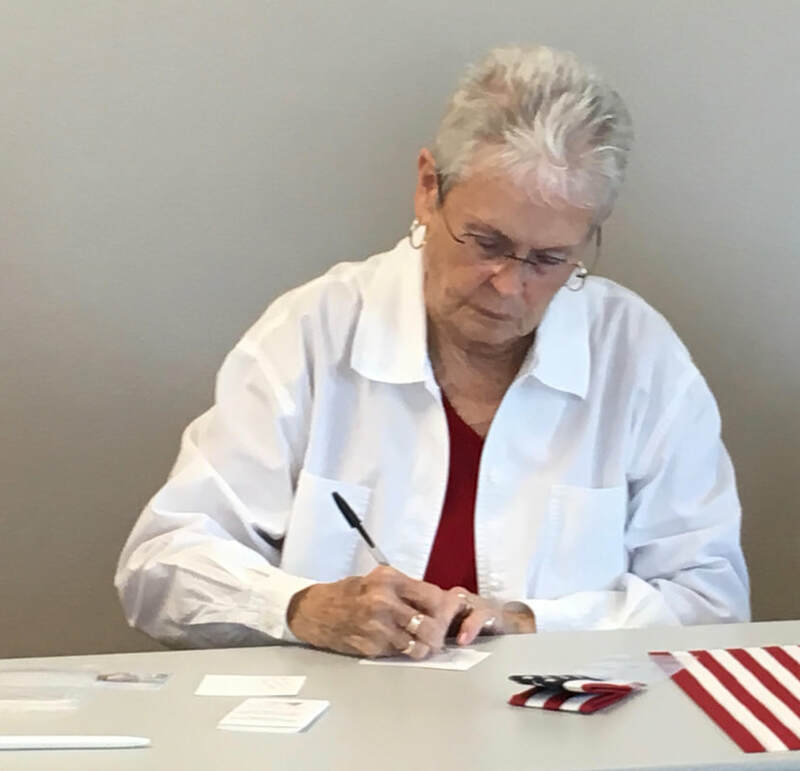 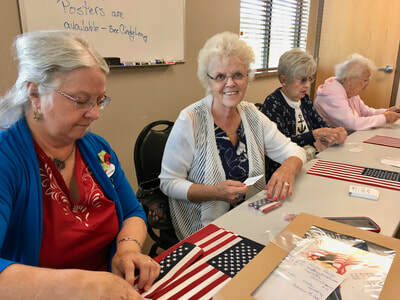 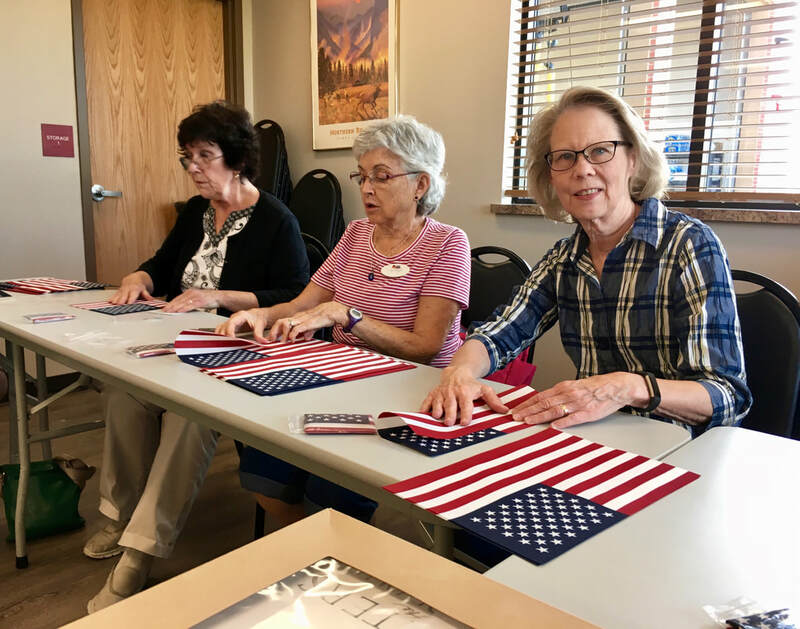 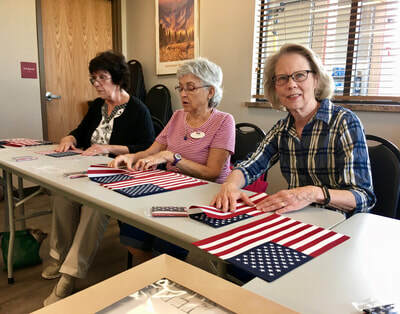 Led by Barb N., we gathered at a local fire station to fold flags for distribution to veterans and active service men and women. Personal notes were added to the backs of the cards that were inserted with each flag. 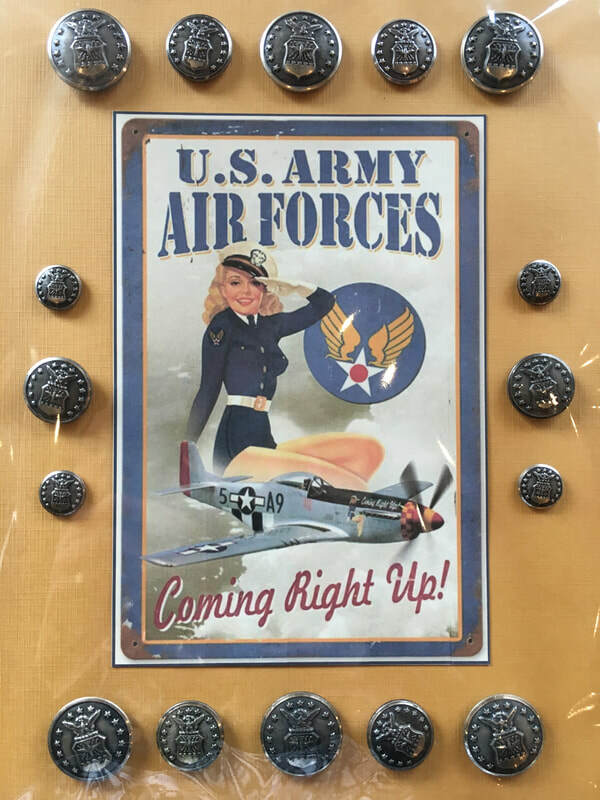 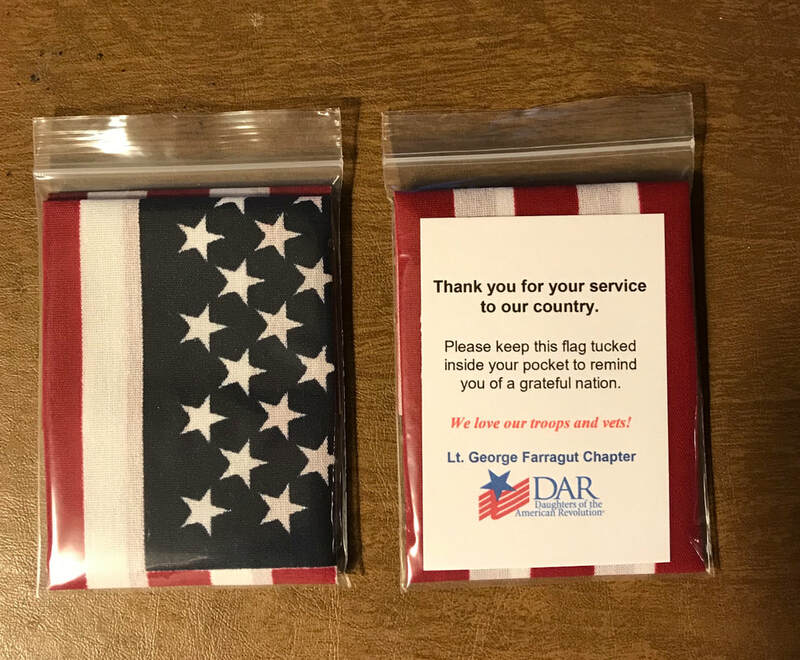 We love veterans and military folks! 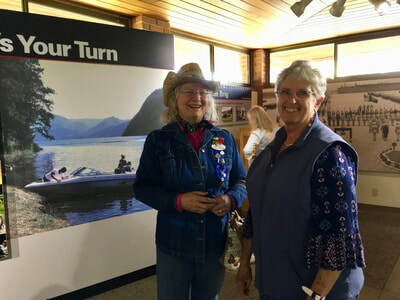 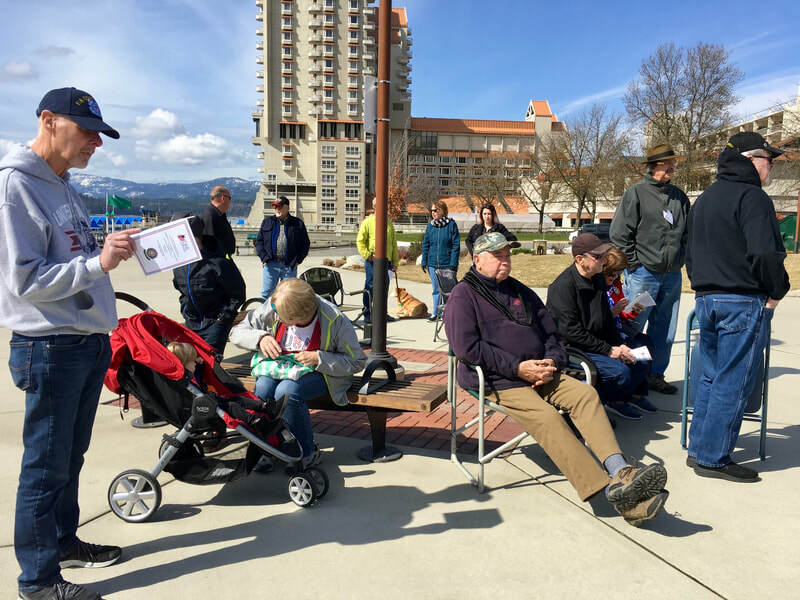 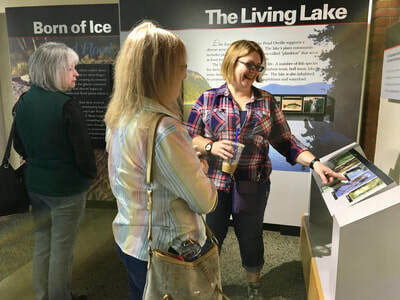 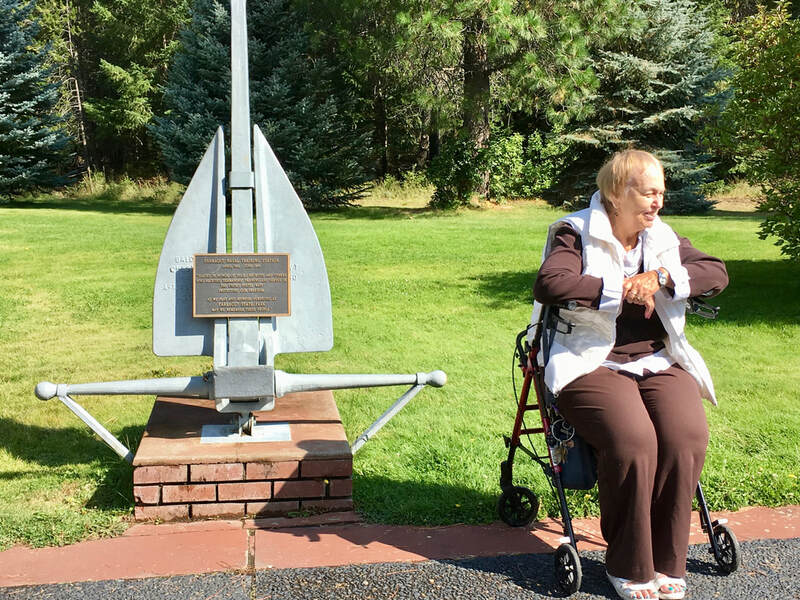 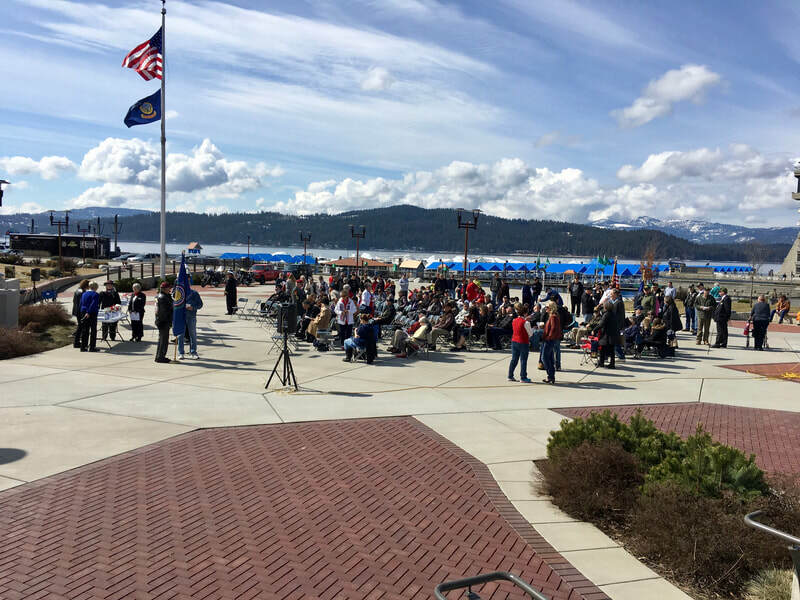 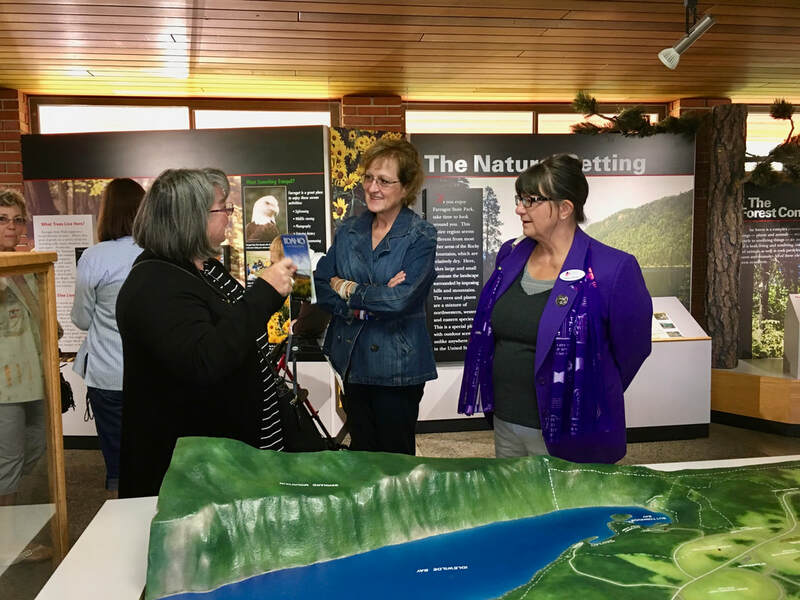 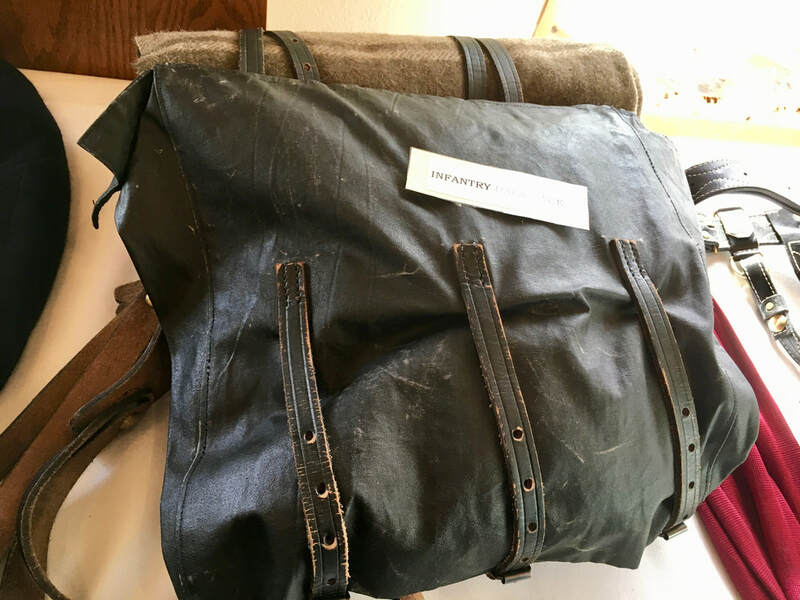 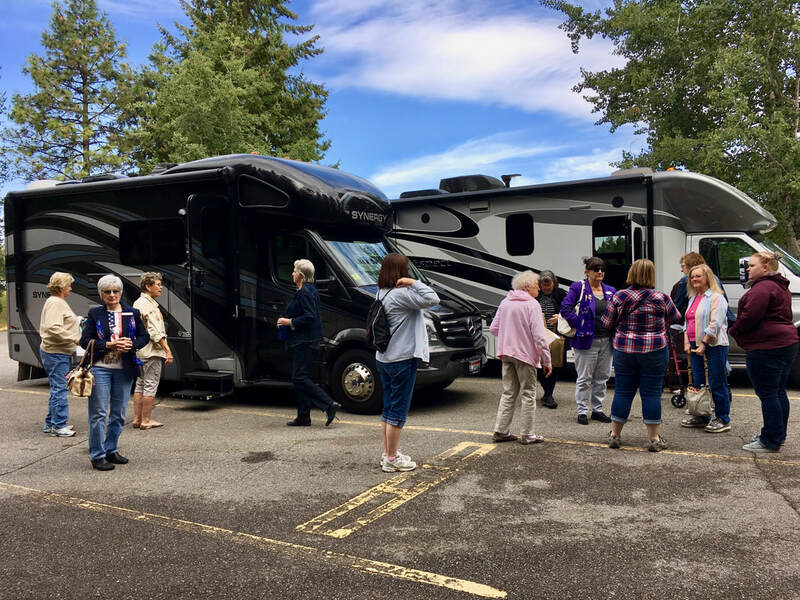 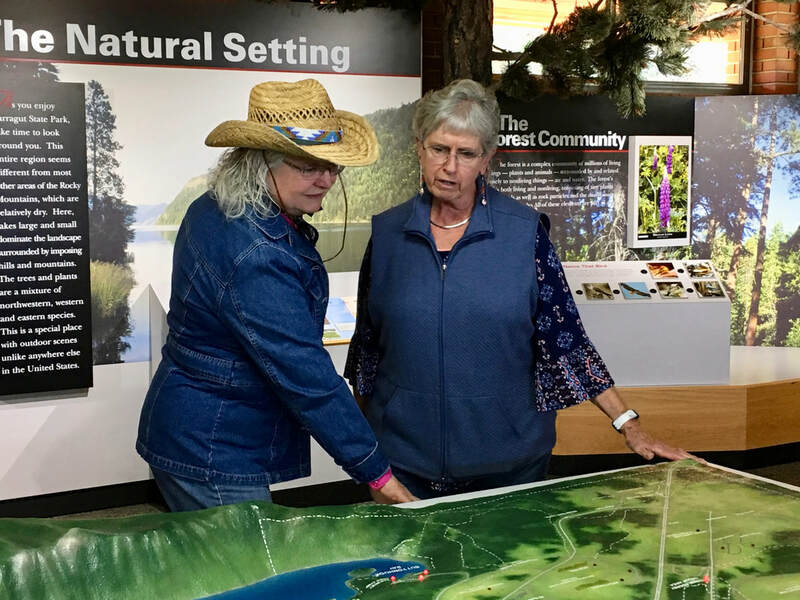 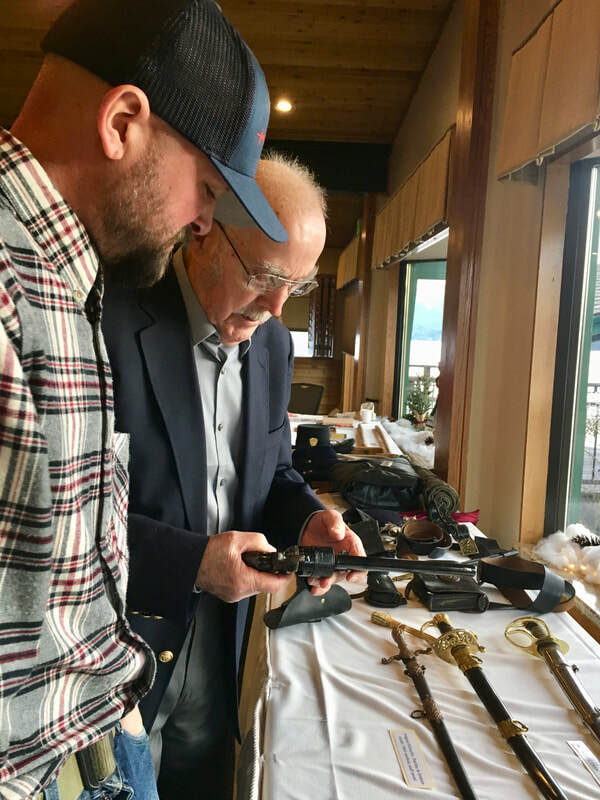 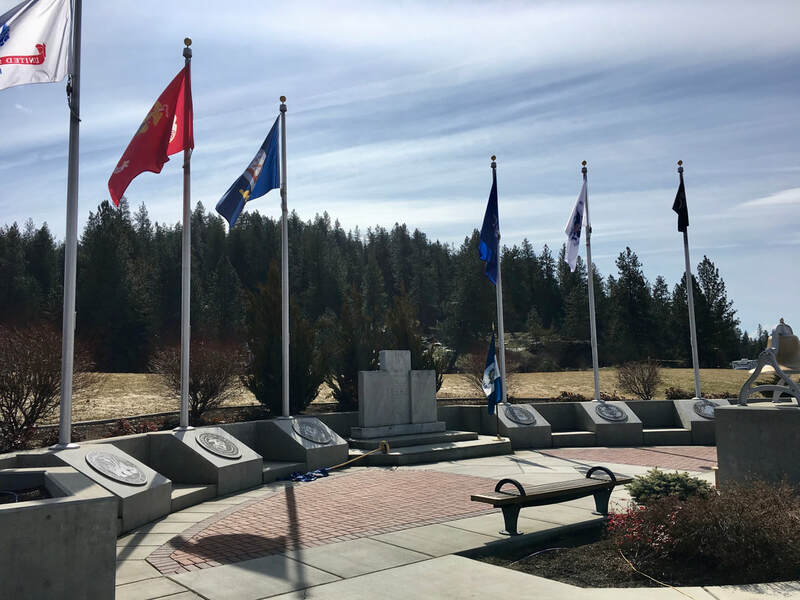 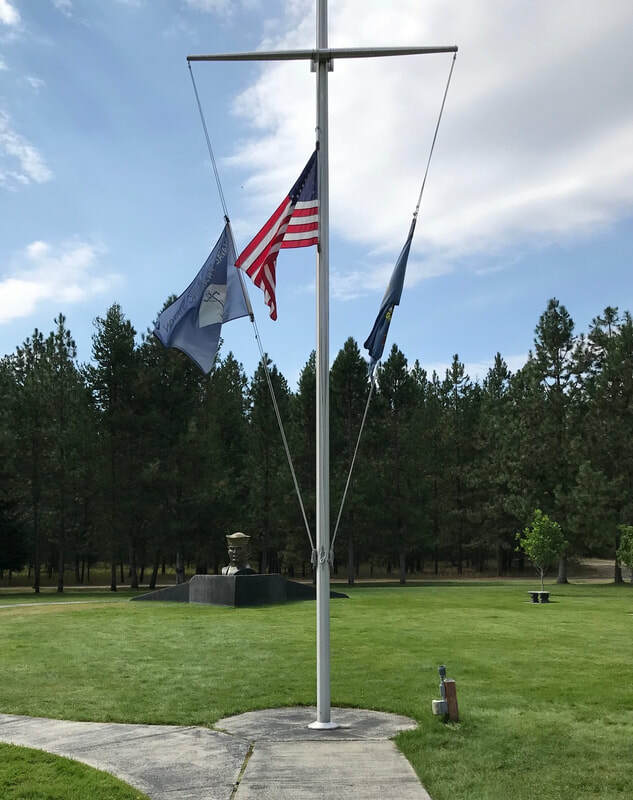 Twenty-four members and 4 HODARS from our chapter and Wild Horse Trail Chapter in Sandpoint converged at Farragut State Park to visit the historical Brig Museum from the World War II Farragut Naval Training Station (FNTS). 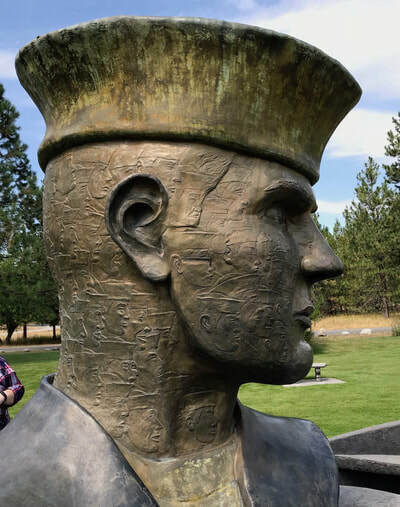 FNTS was a 4,000 acre land-locked naval training facility built in response to the December 7, 1941, bombing of Pearl Harbor. 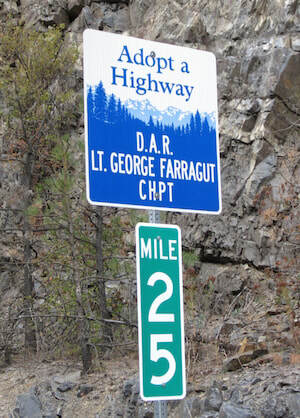 Nearly 300,000 recruits received their basic training at FNTS. Some of our ladies rode in one of two RVs making the trip. Hostesses Jane and Cheryl provided a lovely picnic lunch. 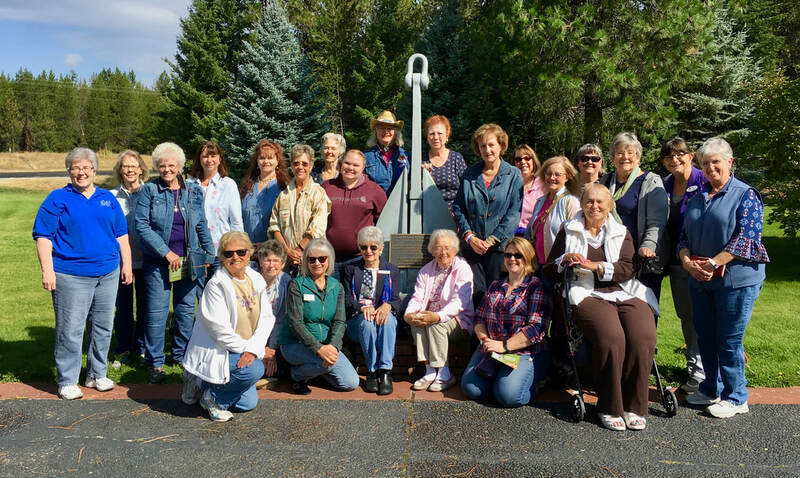 After lunch several ladies hiked to the site of the 1965 Girl Scout Roundup and the 1967 Boy Scout World Jamboree. 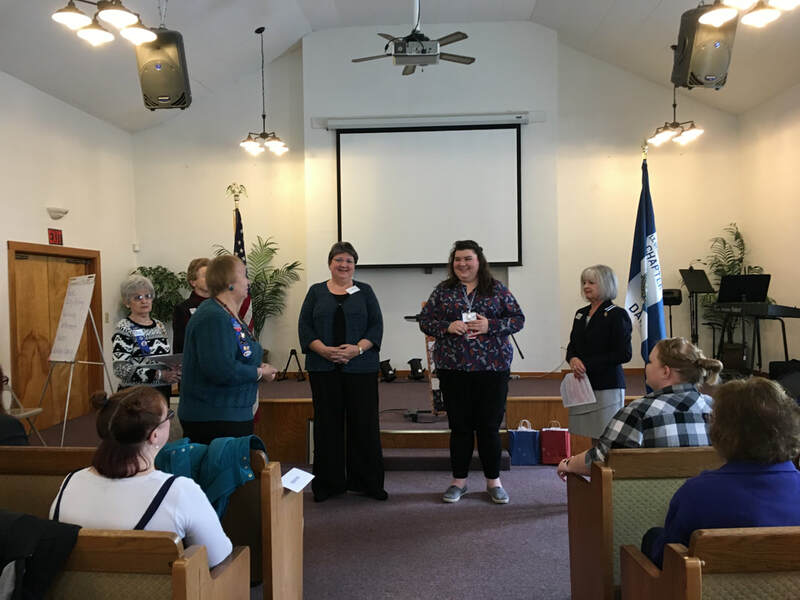 Sara H. was installed as chapter corresponding secretary at a meeting of the executive board. 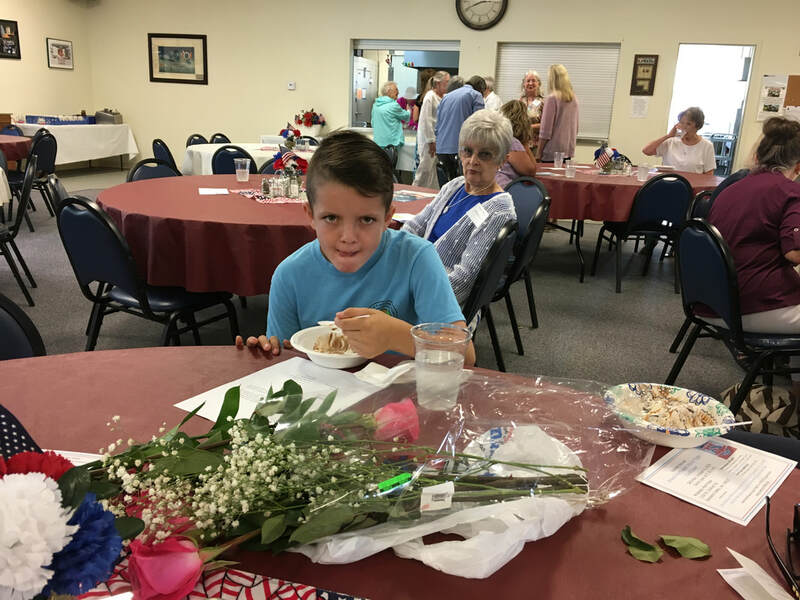 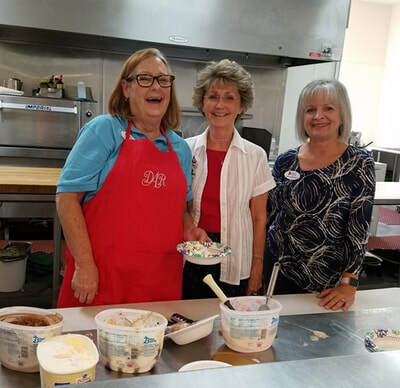 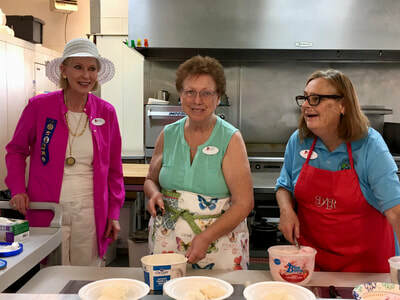 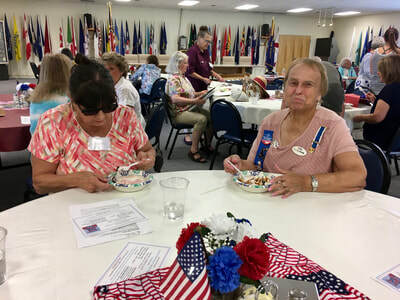 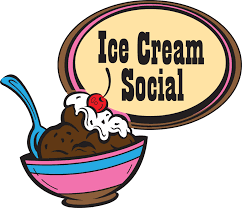 Lots of scoops of ice cream were dished up at our 4th Annual Ice Cream Social. 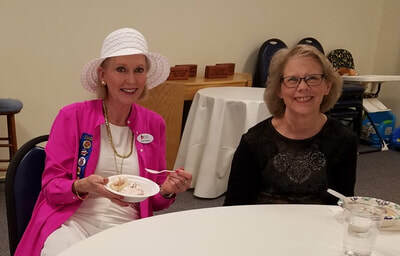 We were delighted to see members and prospective members who can't attend our regular Friday meetings. 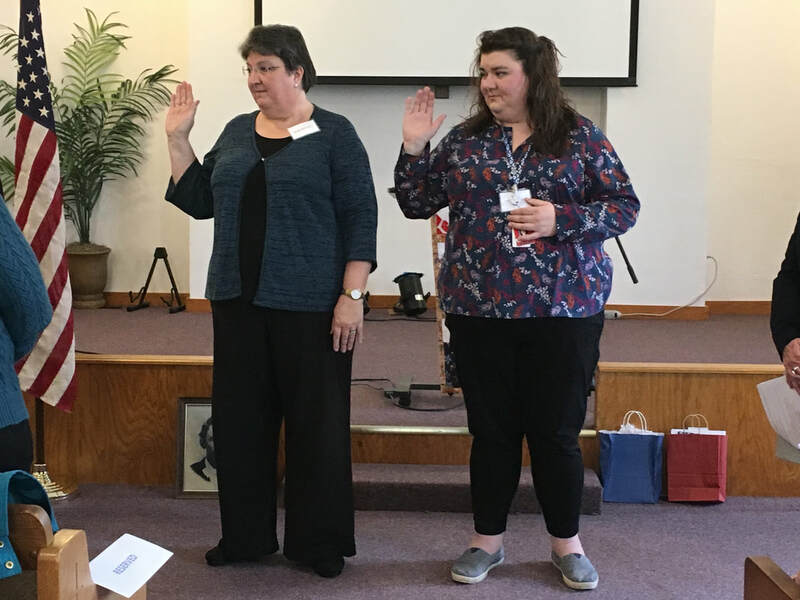 Two new members, Debby G. and Catherine M., took the oath of membership. 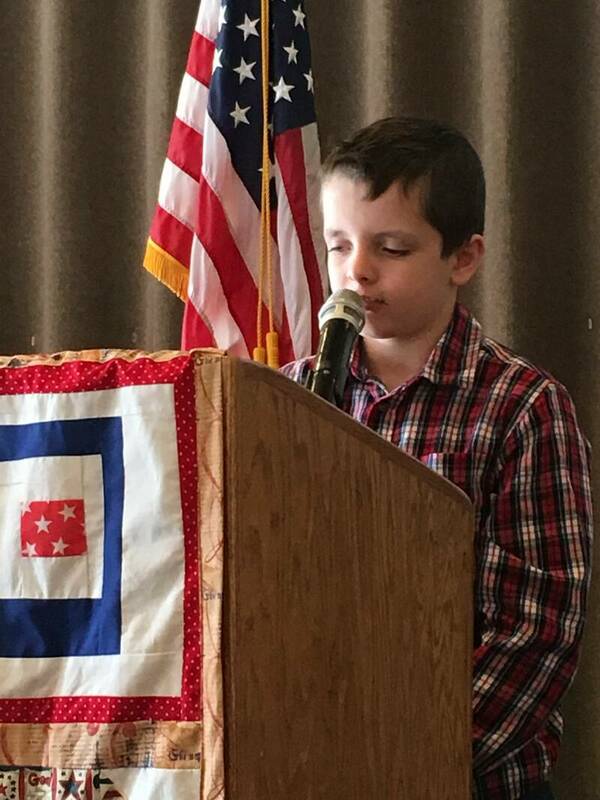 Jacob, Idaho State President of Children of the American Revolution shared his state project. 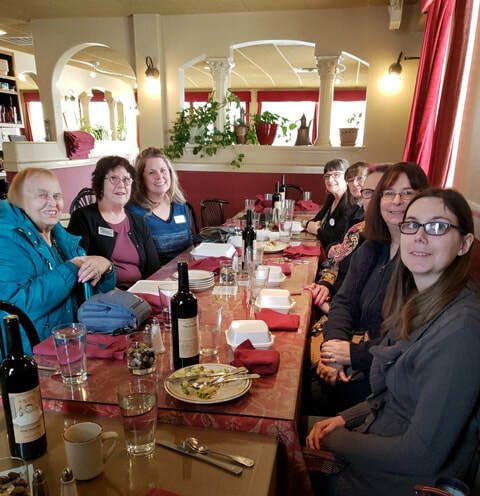 What do you get when you add 6 chapter members + 1 HODAR + 1 guest? 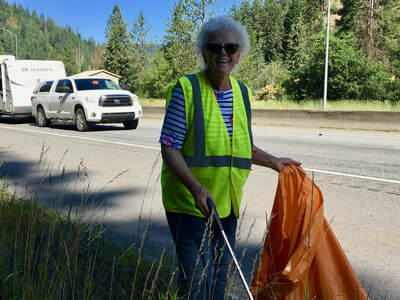 An Adopt-A-Highway crew that spent several hours picking up trash along a two-mile stretch of I-90. We are proud of the signs that recognize our chapter. 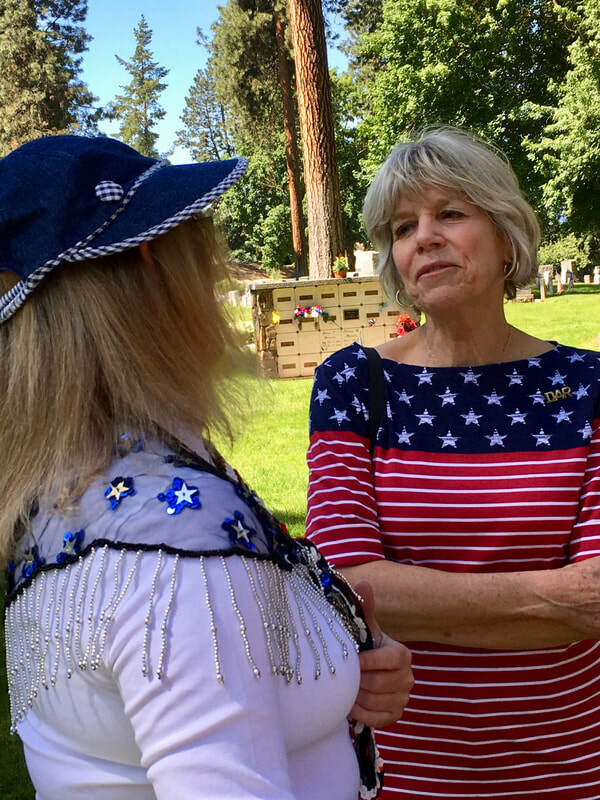 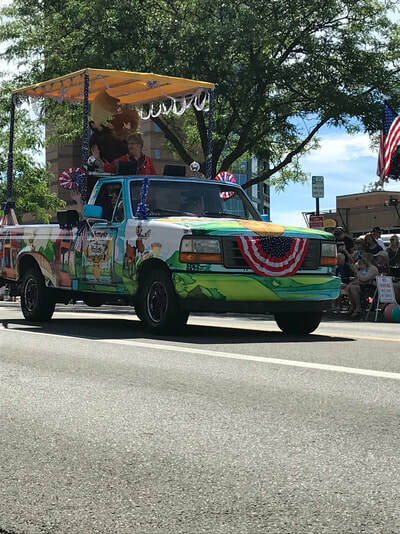 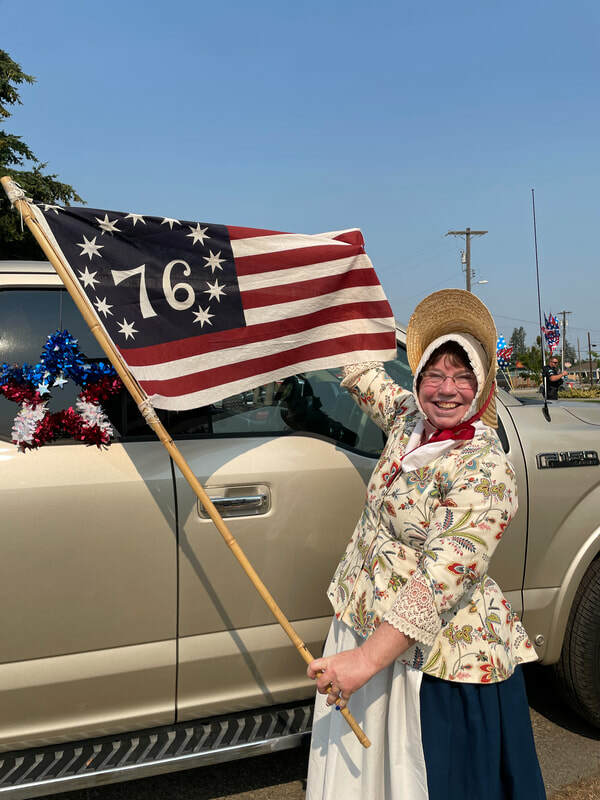 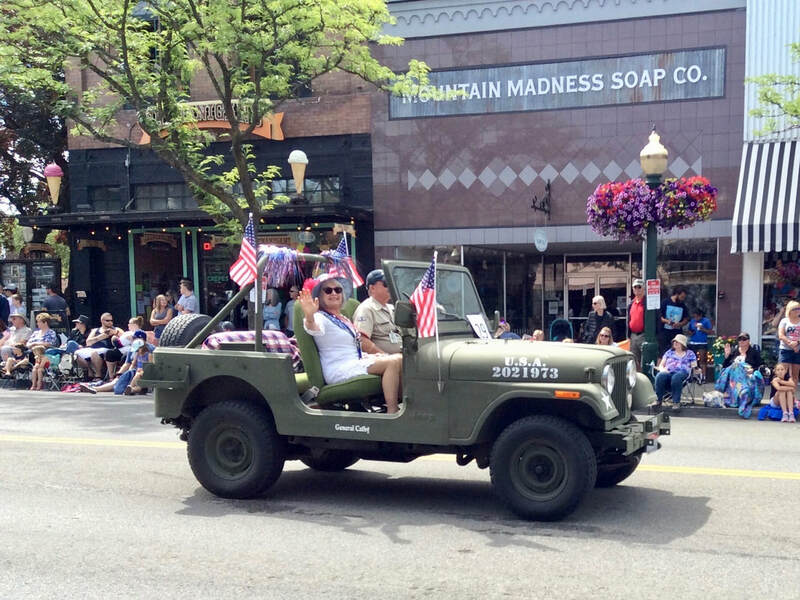 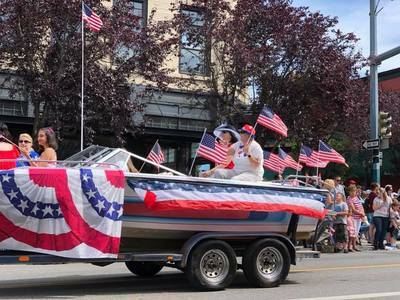 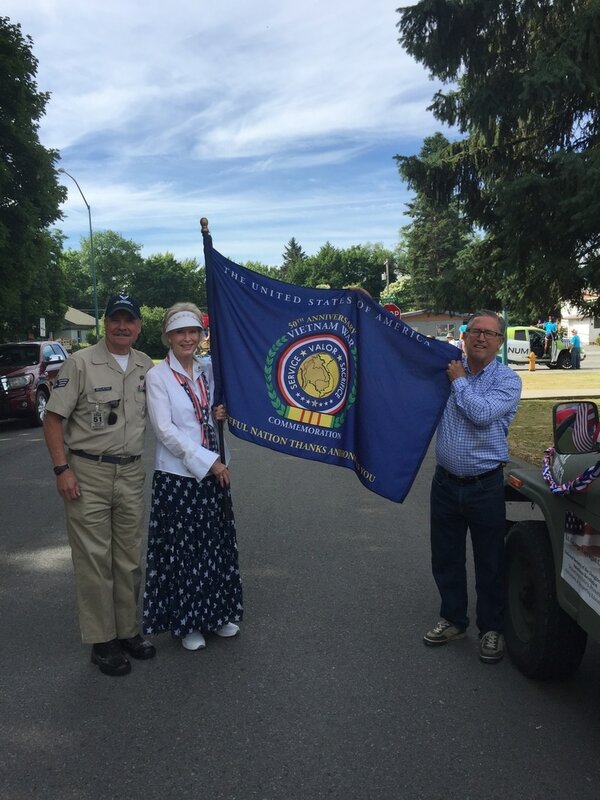 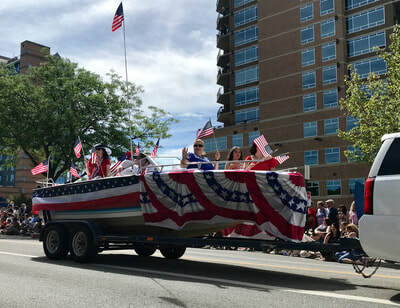 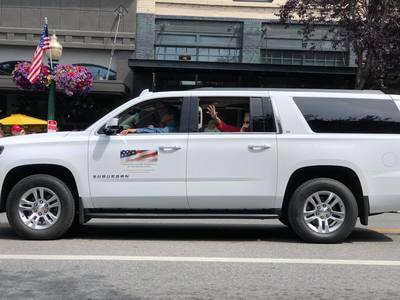 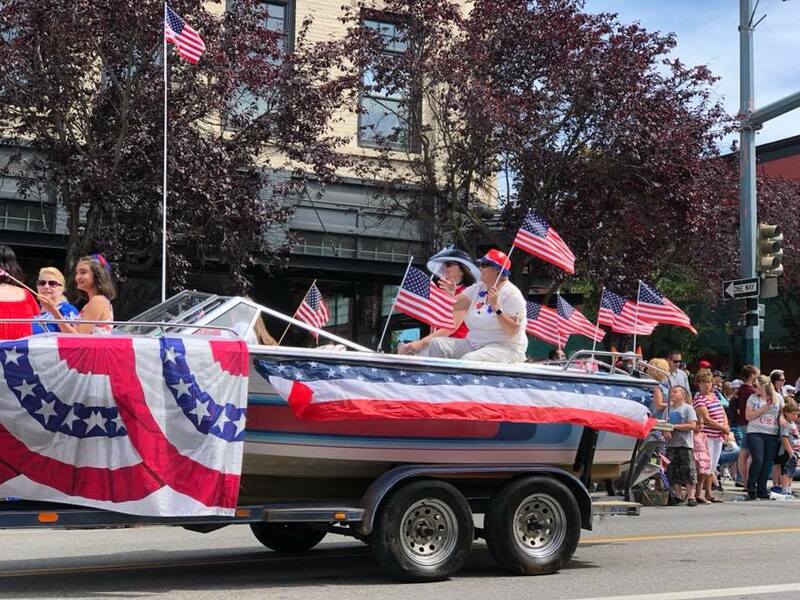 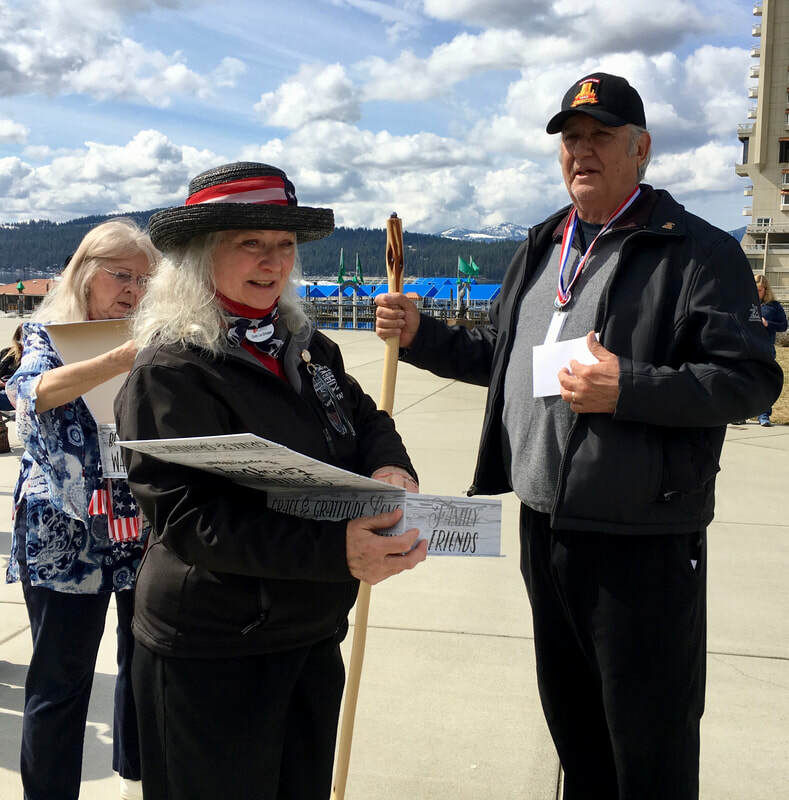 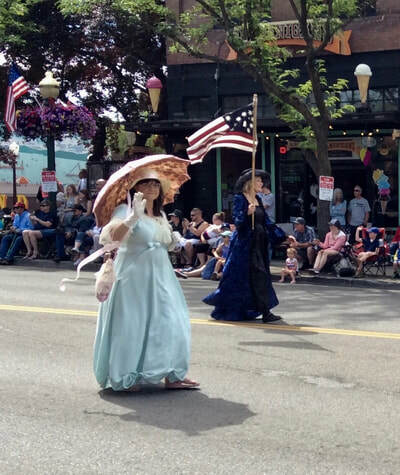 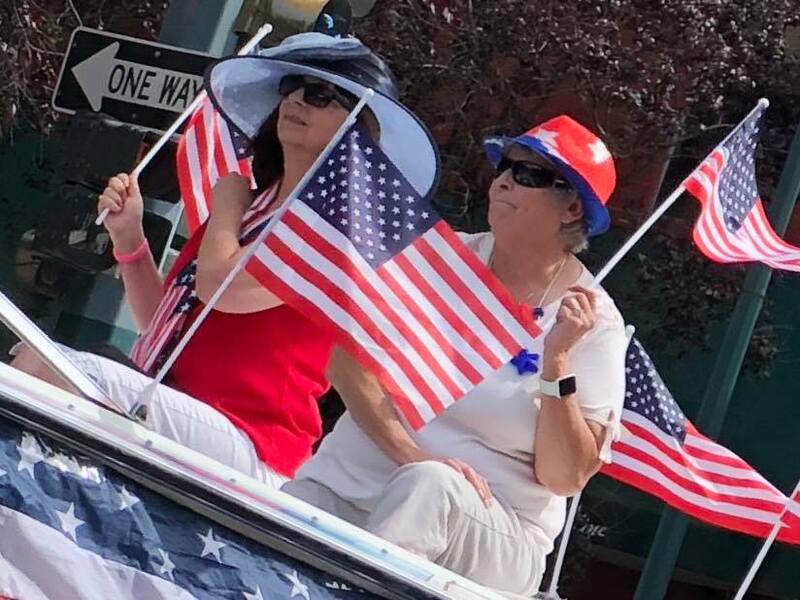 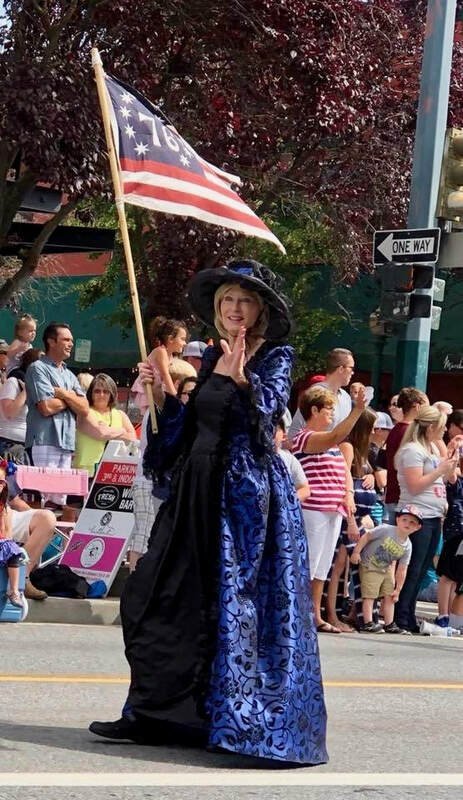 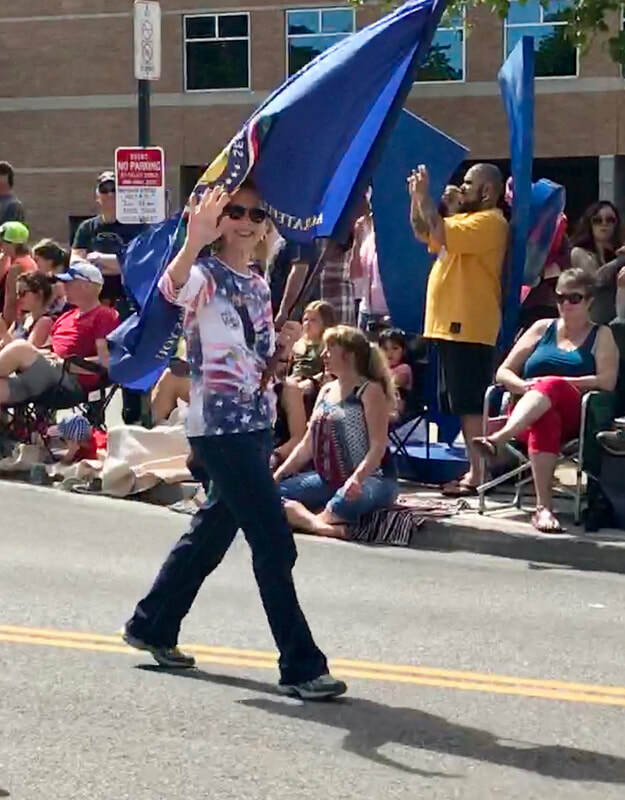 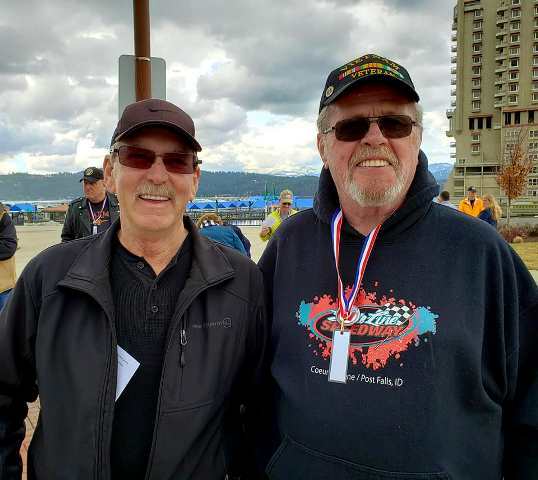 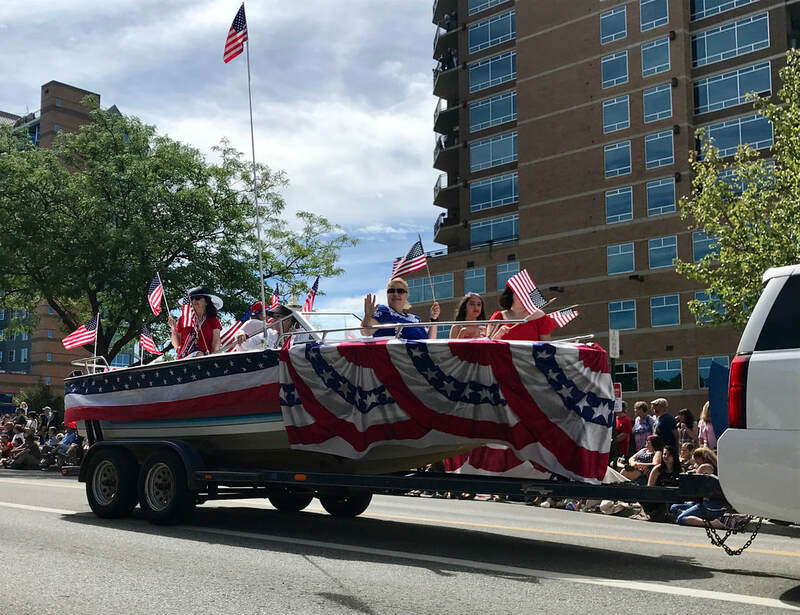 The weather was perfect for Coeur d'Alene's Independence parade featuring Susan Nipp of Mudgy and Millie fame as Grand Marshall. 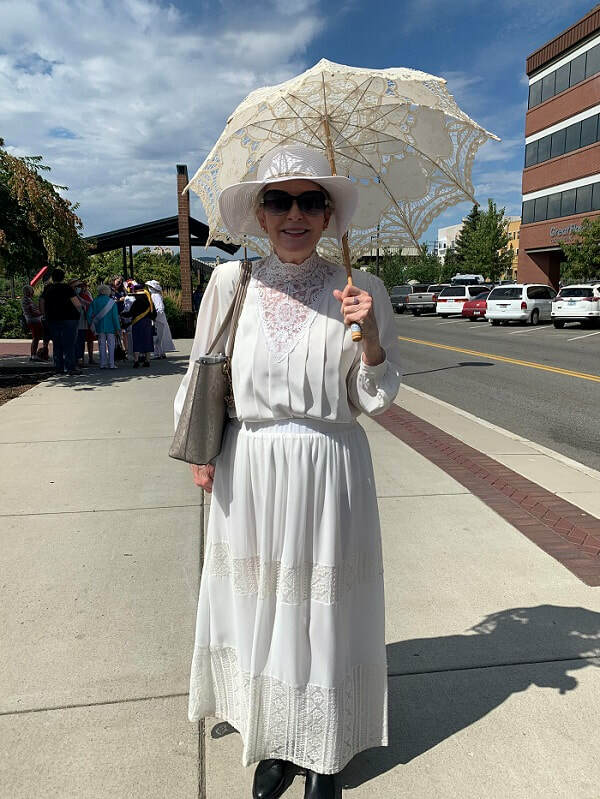 Lt. George Farragut members and guests walked and rode in style with some wearing period costumes and others sporting red, white and blue. 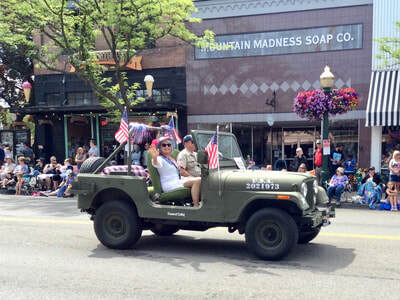 Regent Catherine McClintick rode in a Jeep driven by her HODAR. 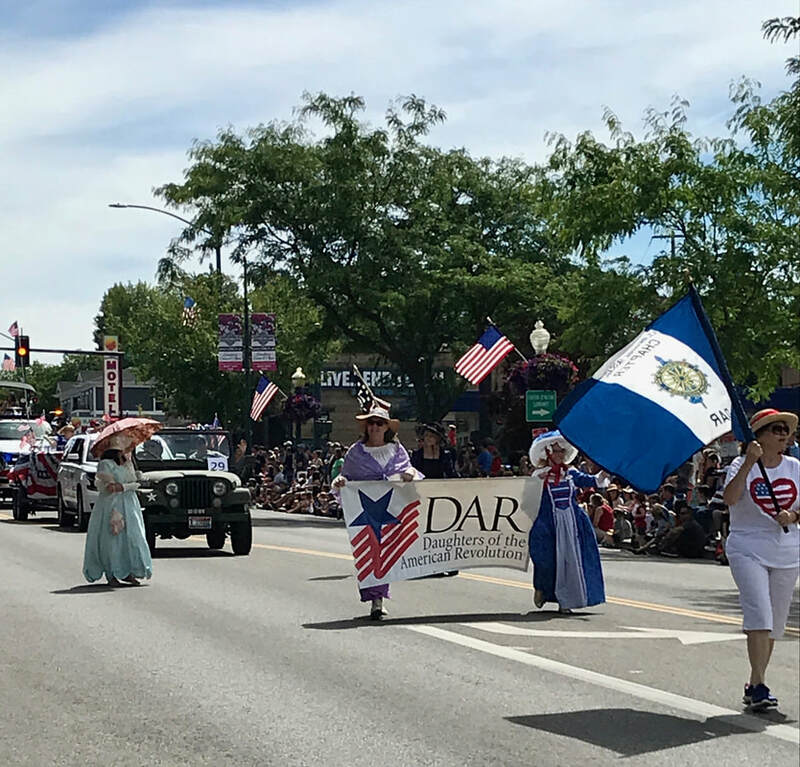 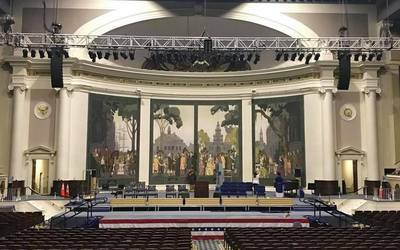 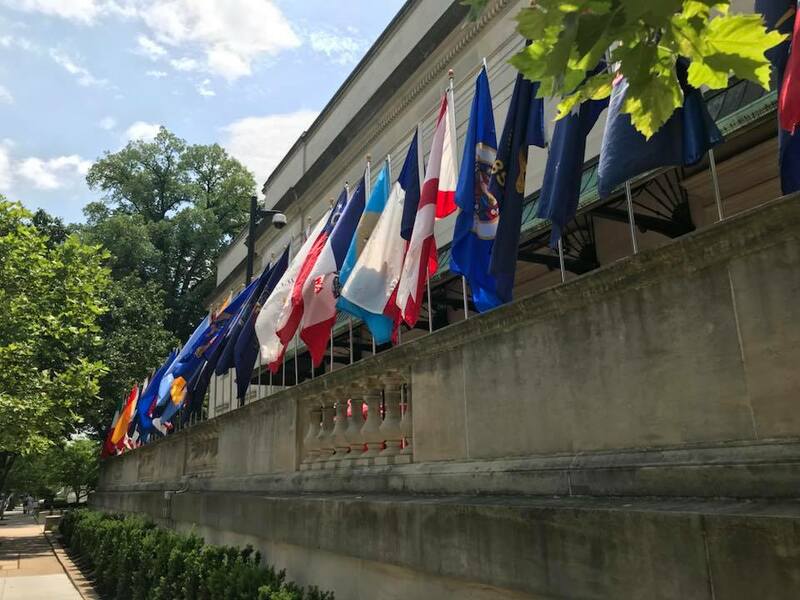 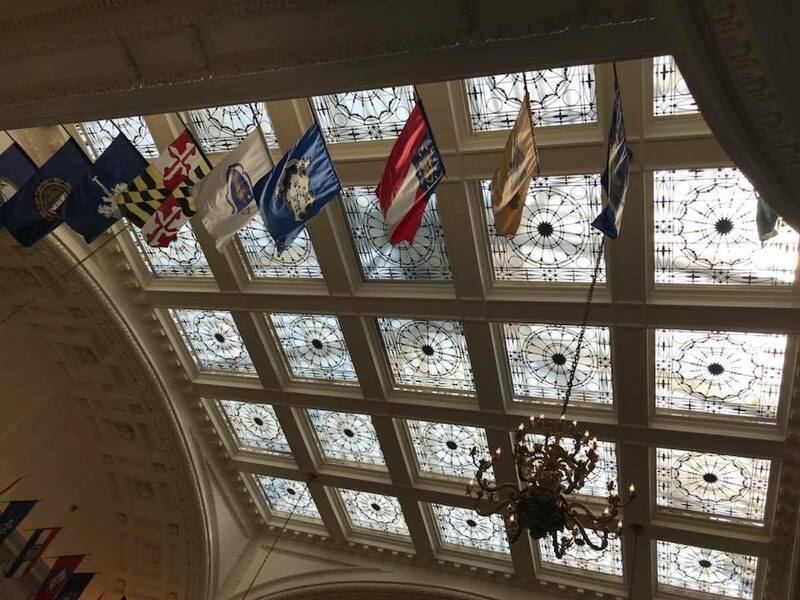 Daughters from every state and from DAR's overseas chapters gathered in Washington, D.C. for the 127th Continental Congress. 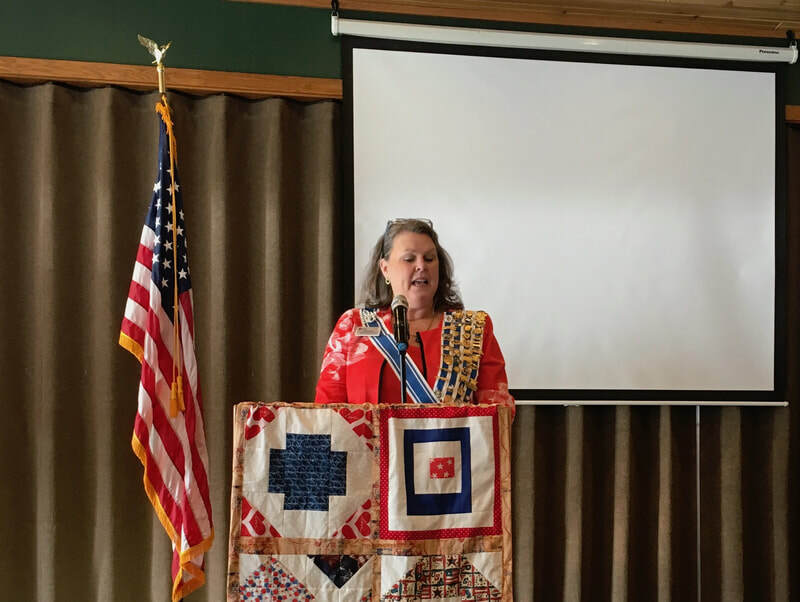 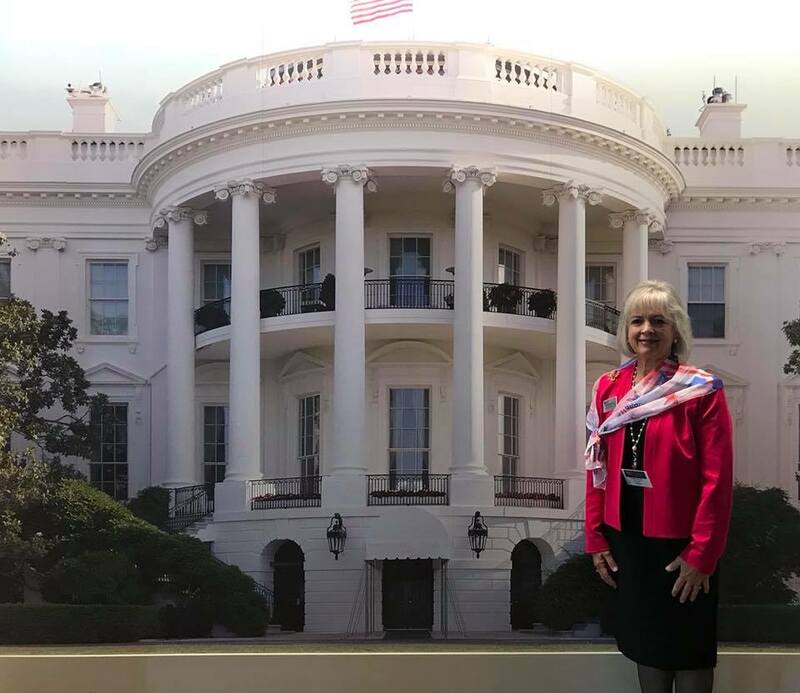 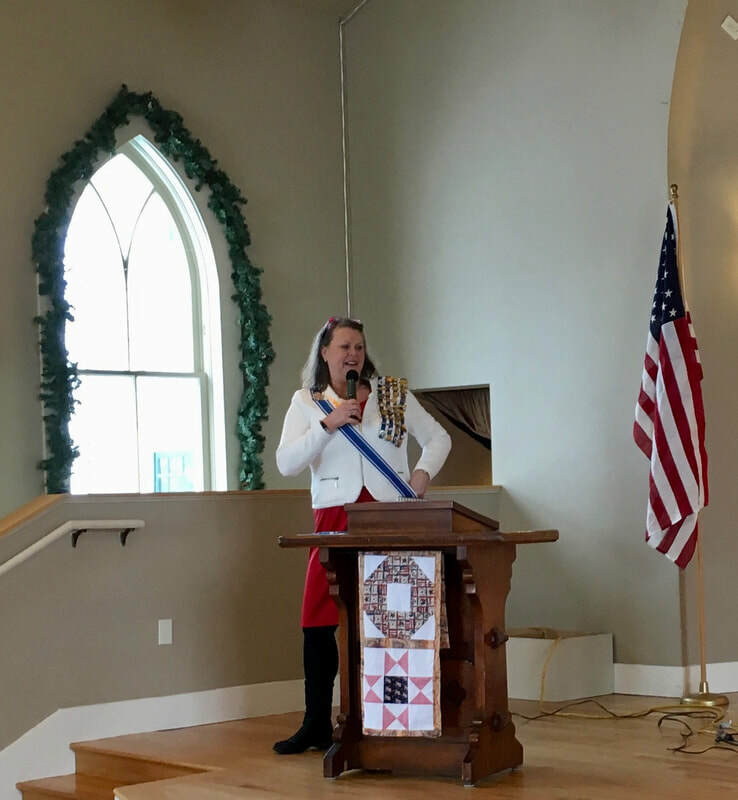 Regent Catherine McClintick represented Lt. George Farragut Chapter. 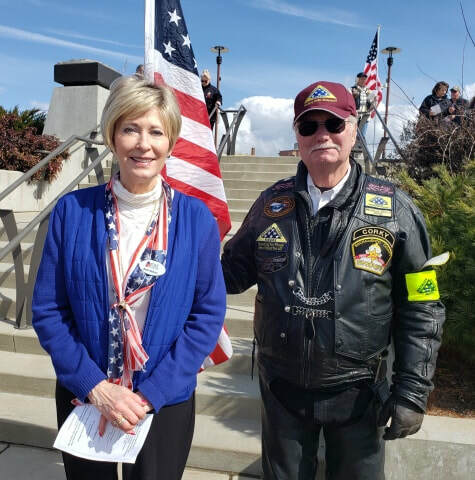 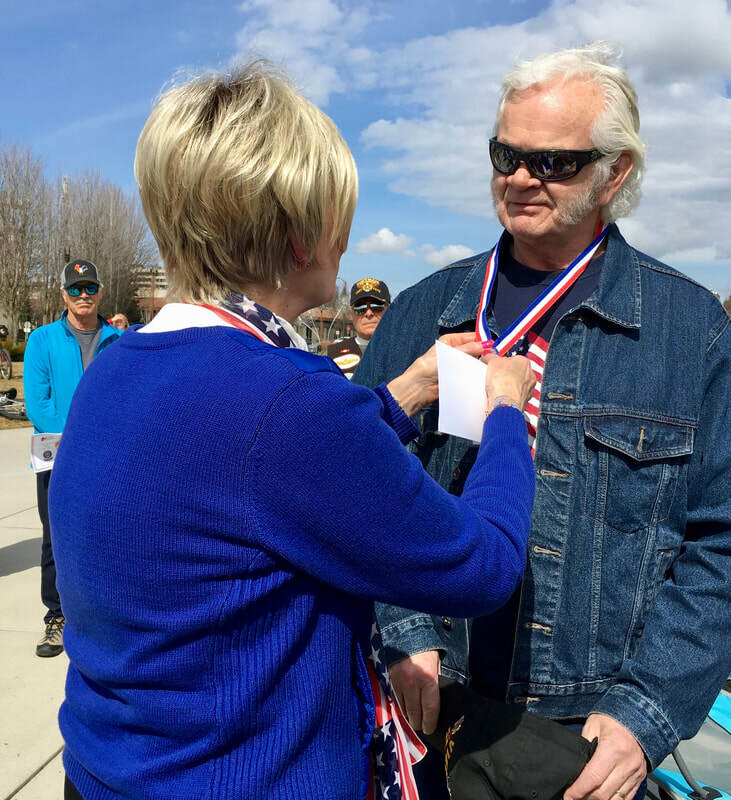 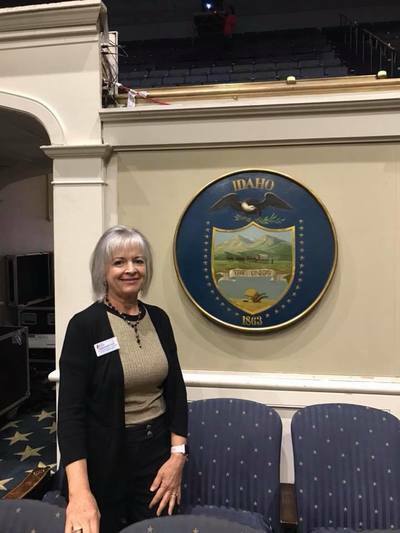 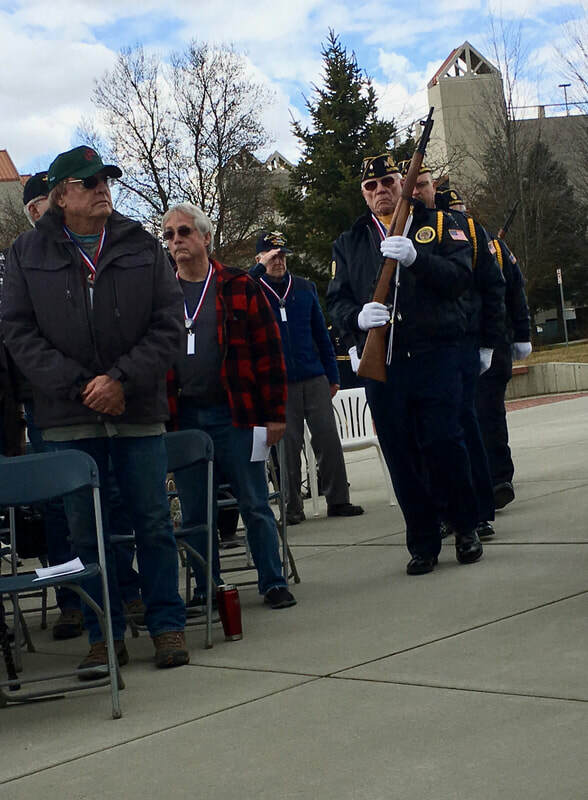 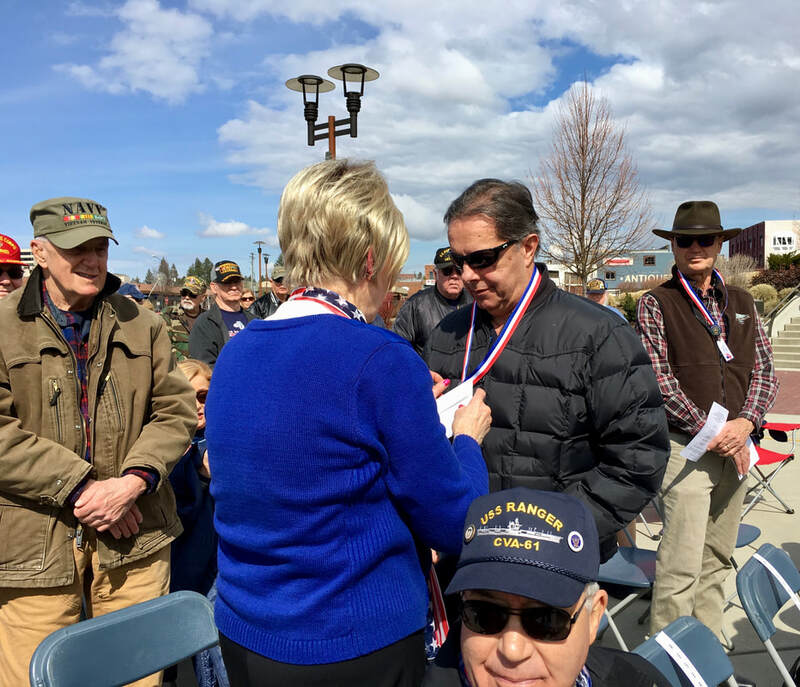 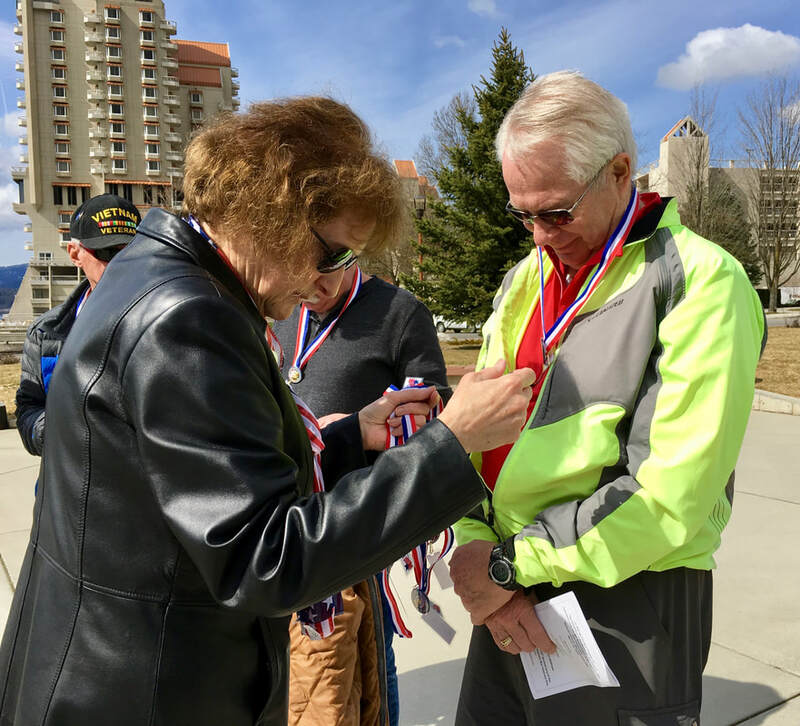 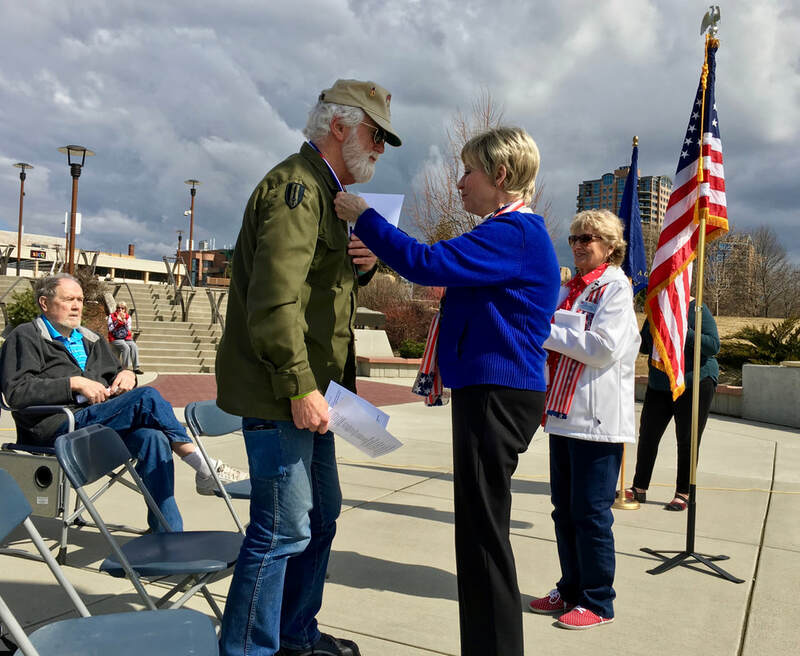 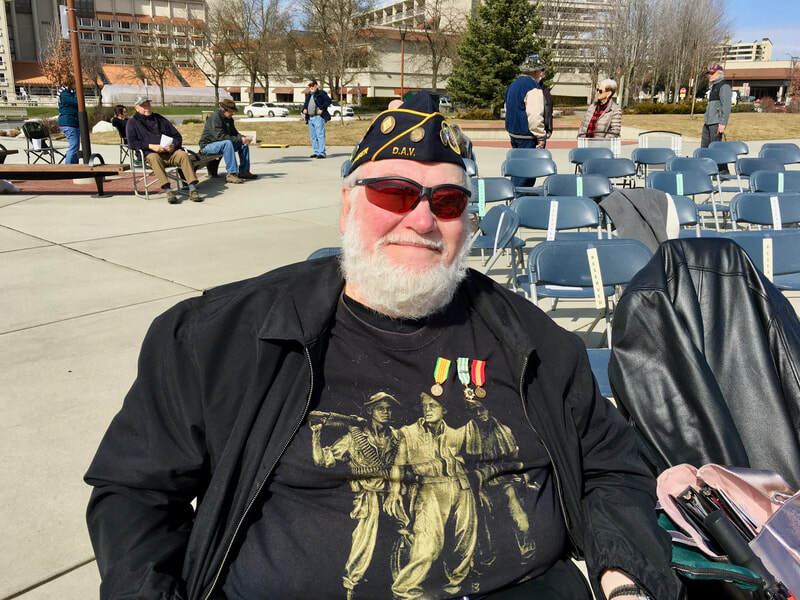 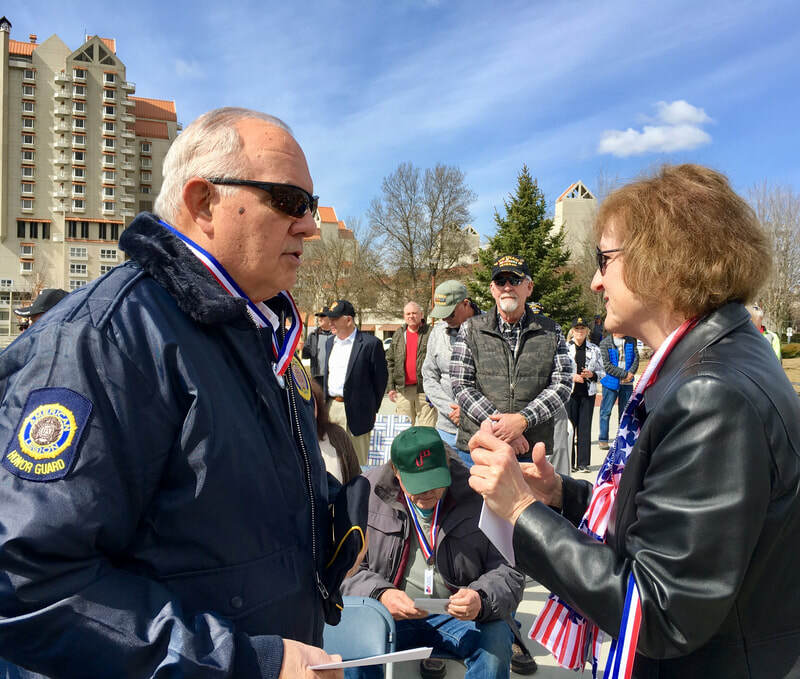 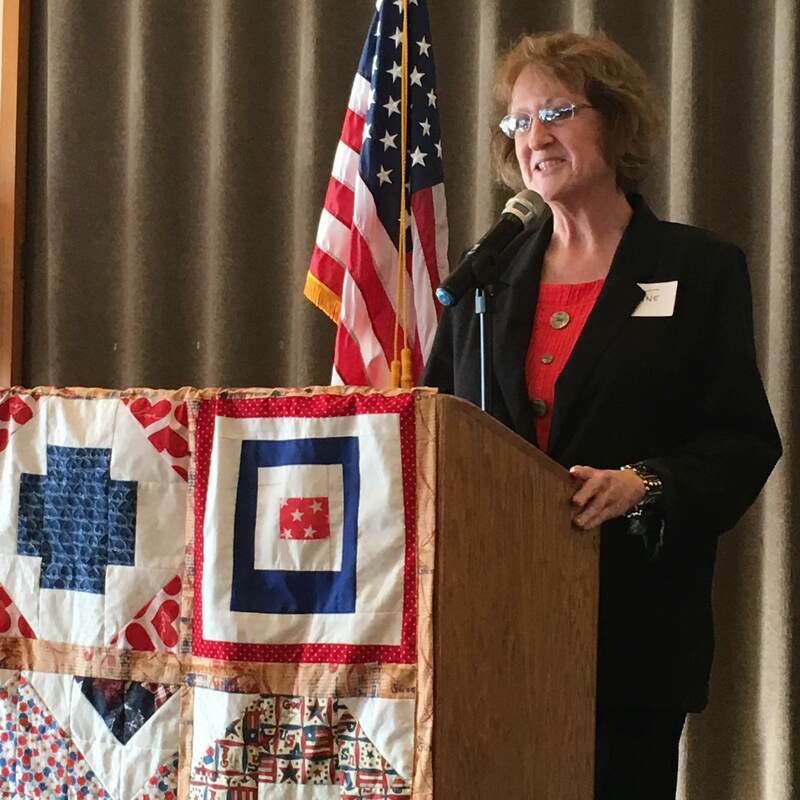 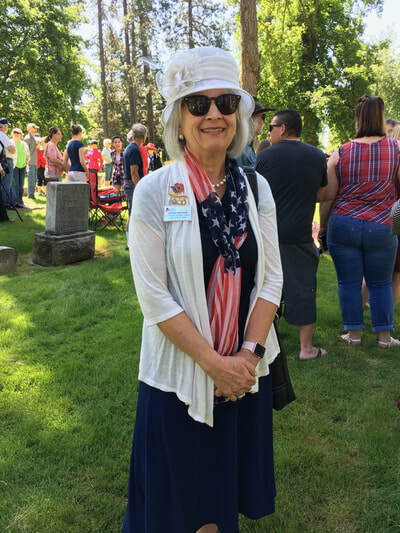 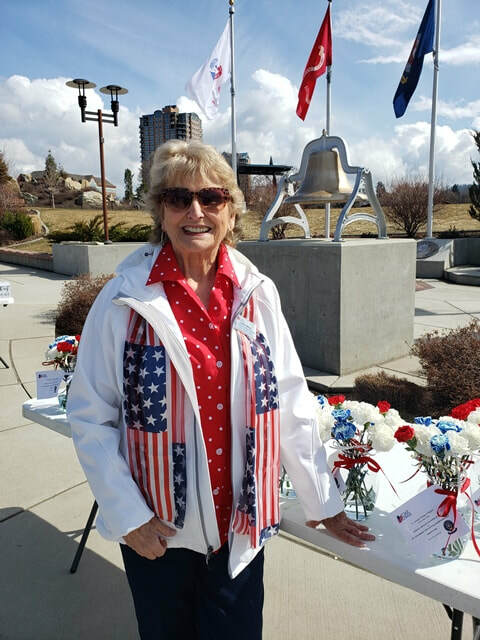 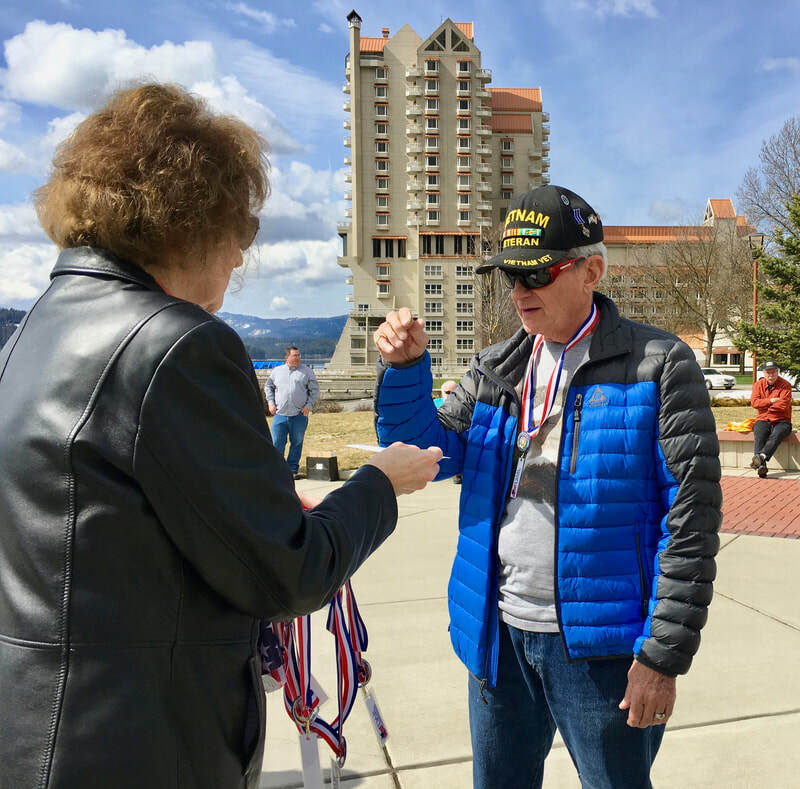 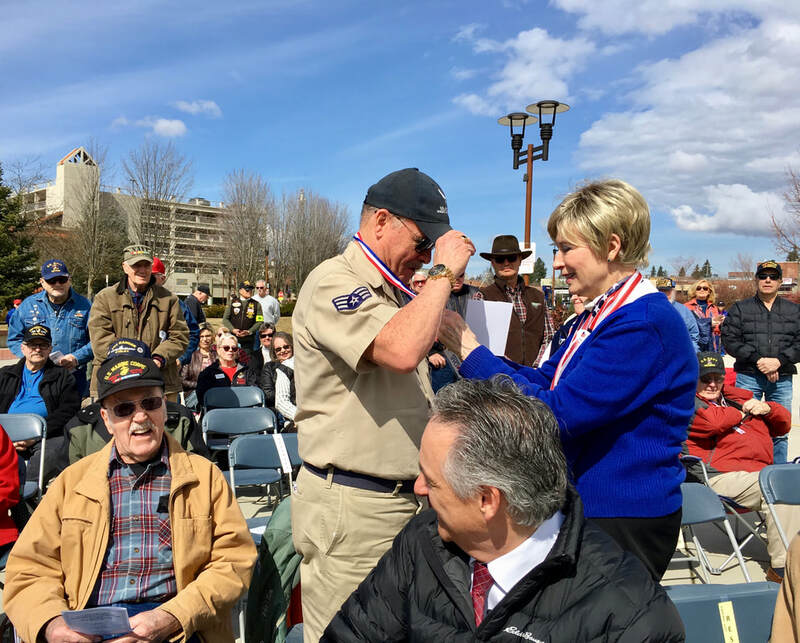 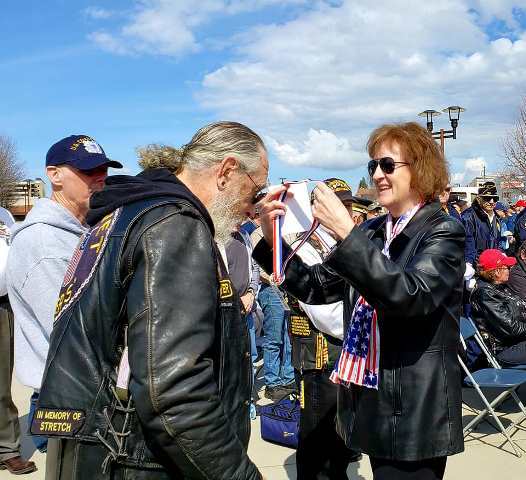 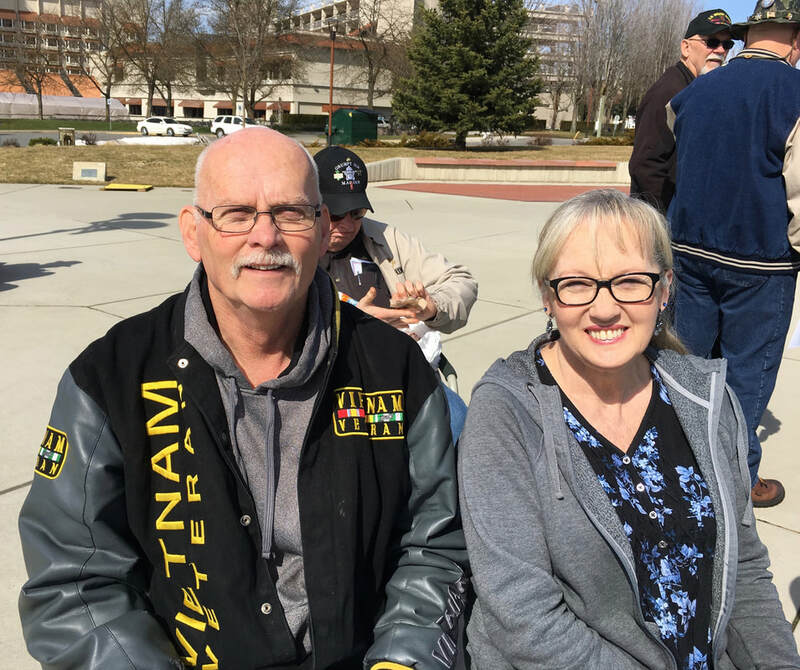 She was joined one day by Chapter member Barb Nelson who received an award as Idaho's 2017 Outstanding Daughter for honoring Vietnam Veterans. 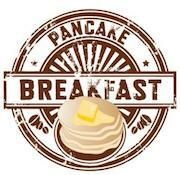 Pancakes, anyone? 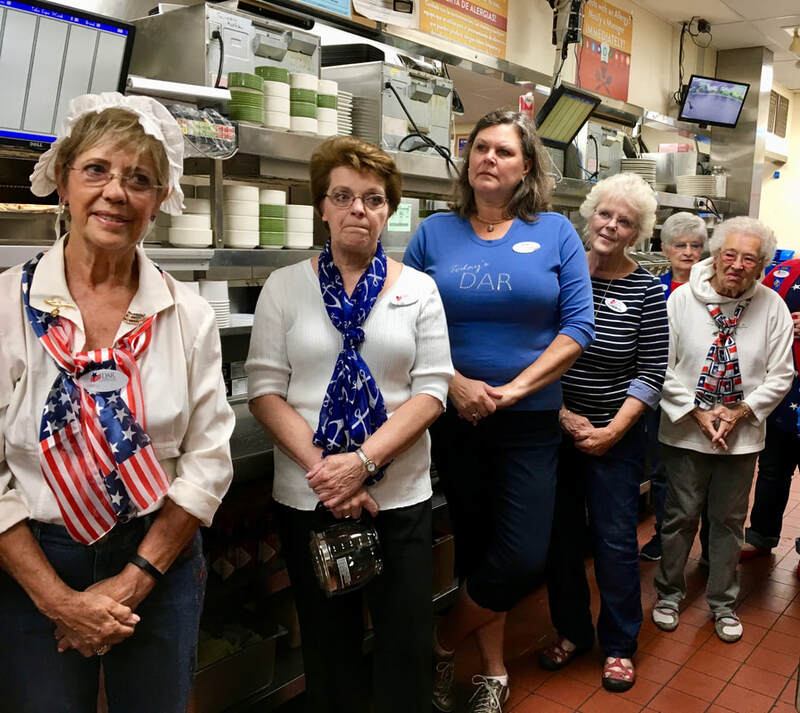 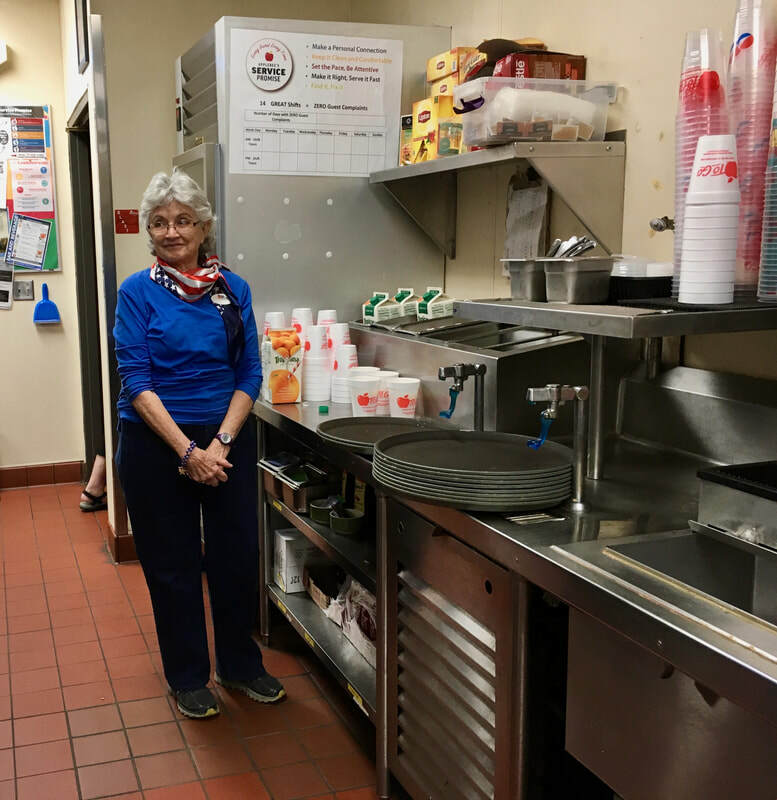 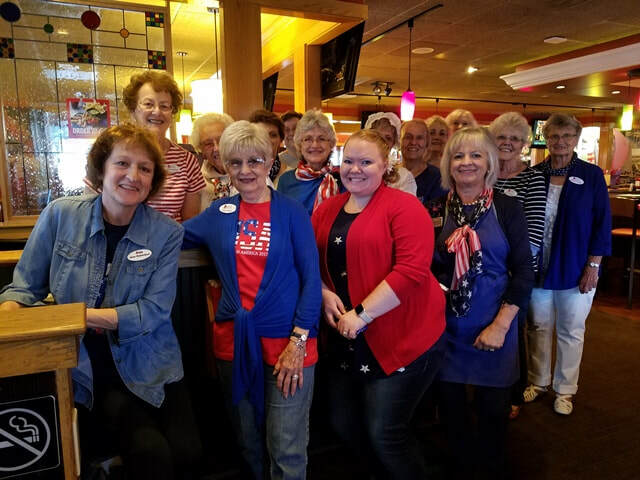 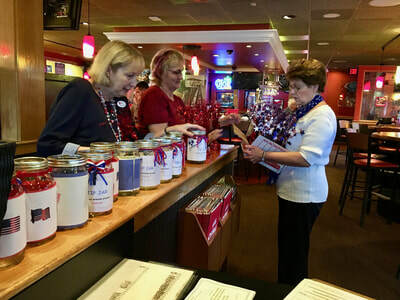 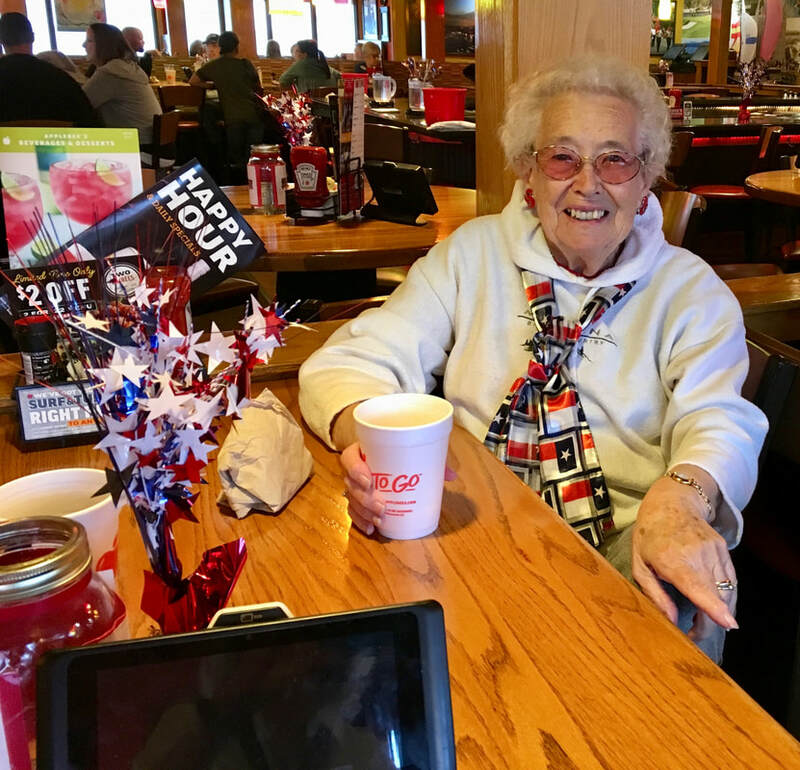 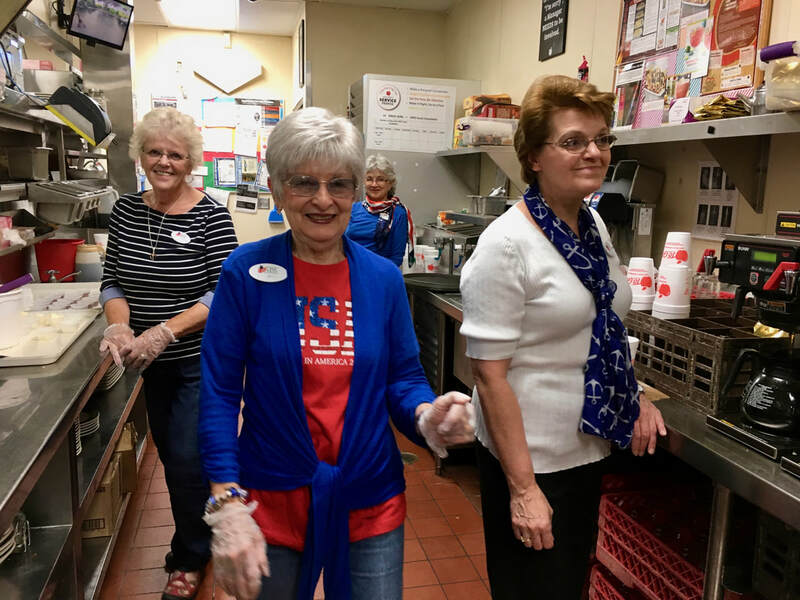 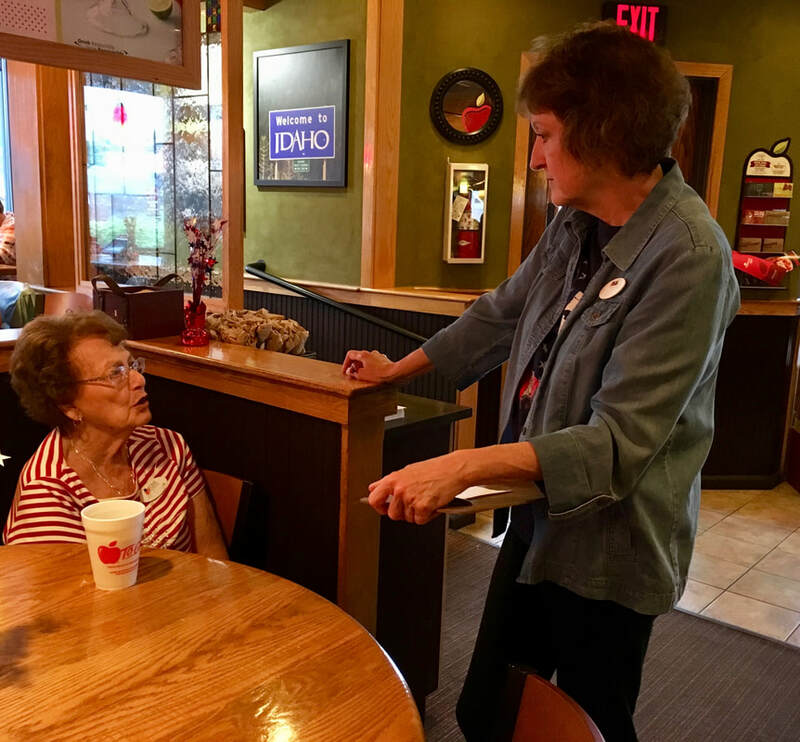 Nearly 100 folks said Yes when Lt. George Farragut Chapter hosted its 7th consecutive all-you-can-eat pancake breakfast fundraiser at Applebee's. 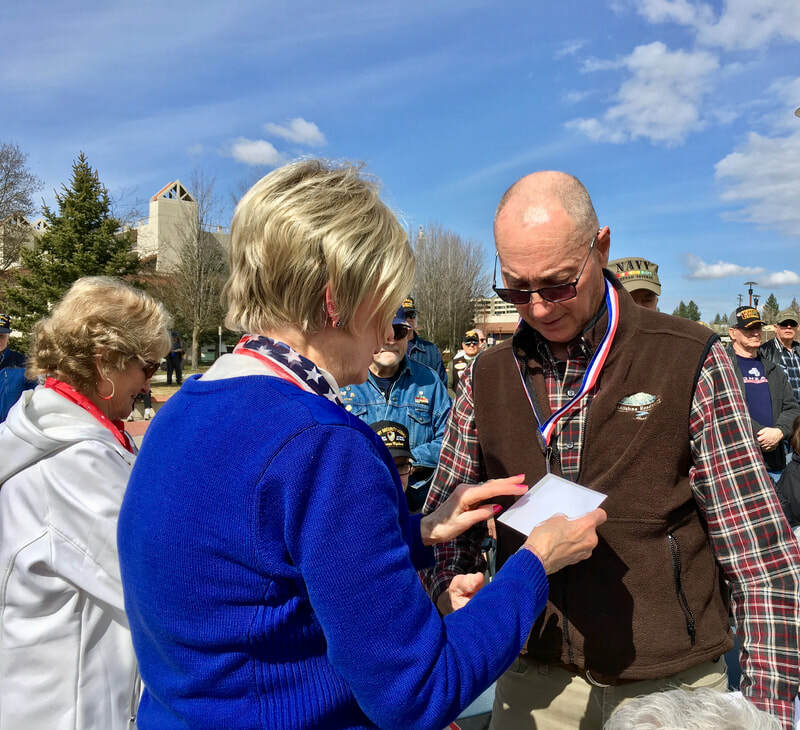 Veterans were given a "Thank you for your service" card. 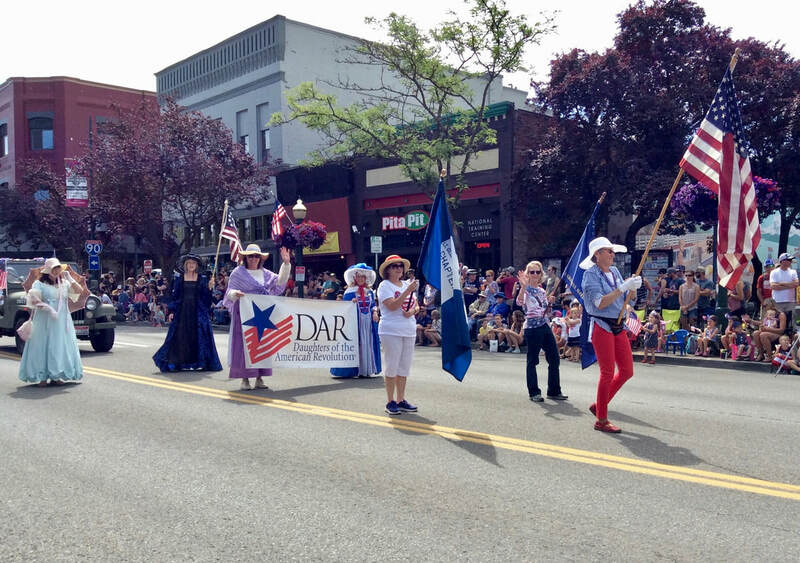 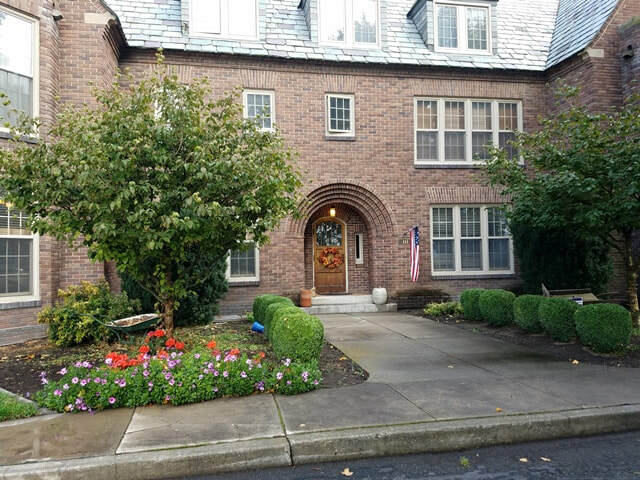 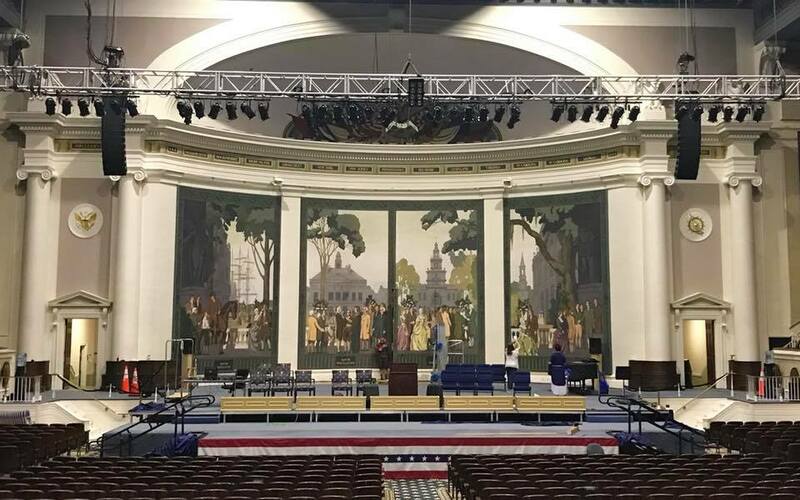 The $1,700 earned will go toward projects supporting DAR's objectives of patriotism, historic preservation and education. 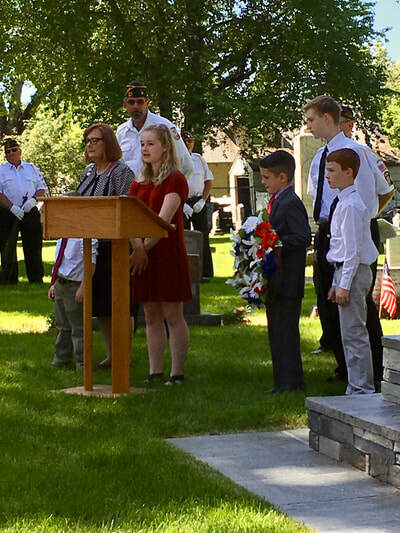 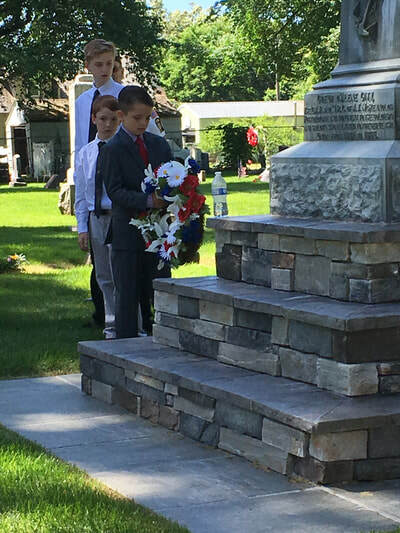 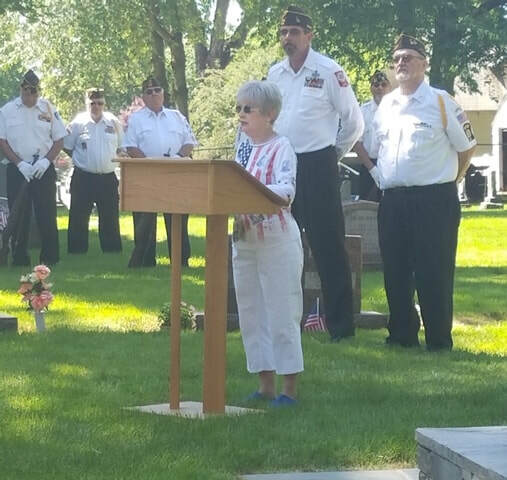 A beautiful day beckoned members of Lt. George Farragut Chapter and members of the Skitswish Society, Children of the American Revolution, to participate in a Memorial Day program at Forest Cemetery to remember and honor those who paid the ultimate sacrifice for our freedom. 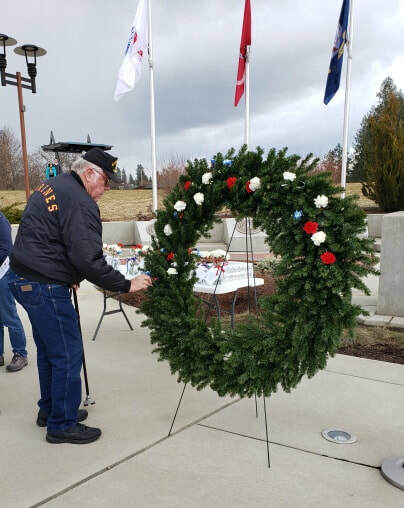 Both groups placed a wreath following a few words from their respective chaplain.